PROFILE - The abbrev. 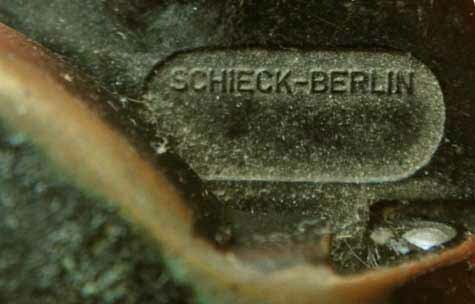 fxn doesn't appear in the List of the 3-letter codes of the German manufacturers who supplied military materiels during WWII but it is said that it stands for Schieck-Instrumente, Wilhelm Wolkersdorf, Elektrische Geräte (source: Militariafundforum). 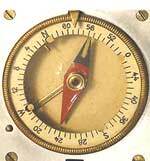 PROFILE: Fernando SCHLACHT (who lived via Farneli, 10 in Milano, Italy) filed in 1938 and 1940 two patents on the base of which this compass was built. 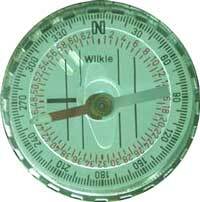 This compass also resembles WINTERER's compass design (SURVEY compasses). Figures 1-0: In the patent, these signs are described as being meant for aircraft (segni per le segnalasioni agli aerei), i.e. to write them on the ground with stones so that the pilots can read them from the air. 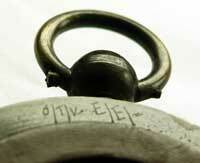 Some symbols are identical with roman figures (ex. : 4 = IV, 5 = V). 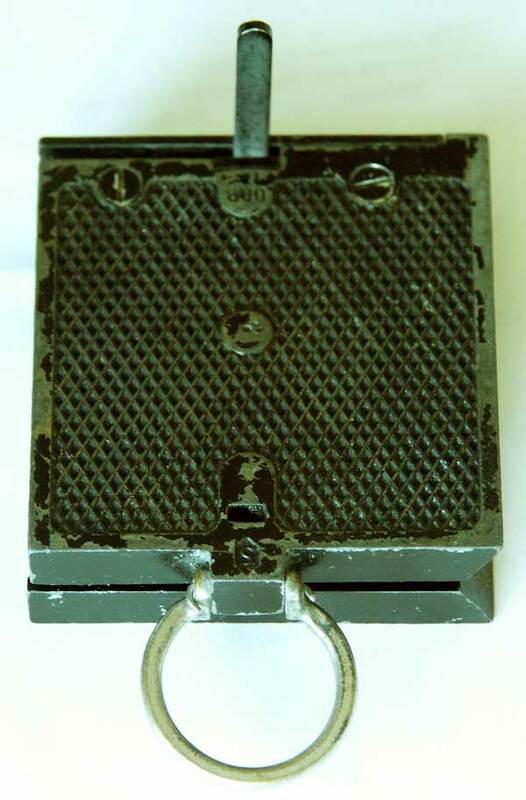 Rear face: Morse alphabet, special version with accented letters plus `N and CH. The end part is a whistle. PROFILE - Former French company (for more information, click HERE). 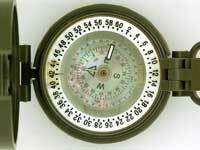 This company produced together with several others the famous Modèle 1922 compass. 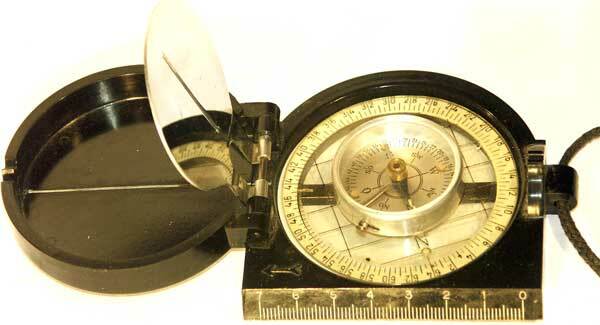 See also Survey and Artillery compasses. PROFILE - Former British manufacturer (for more information click HERE). 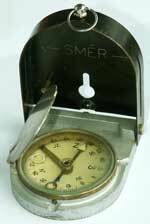 S & M built together with the U.S. company Taylor (acronym TYCOS) Verner's pattern compasses. 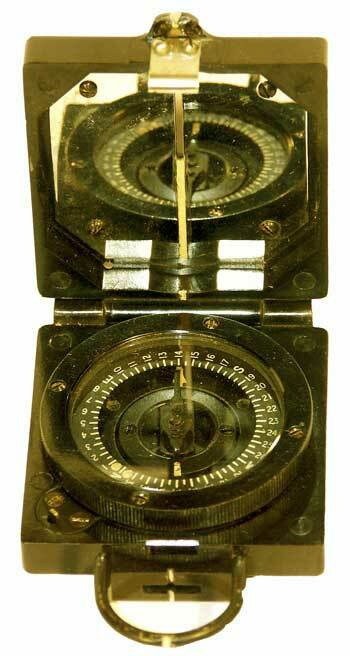 (Picture G. Perry) Marching compass Verner's pattern Mk VII with manual transit lock. 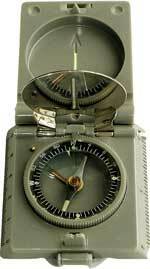 Compare with the French Ltd (F-L) compass Verner's pattern Mk VIII with automatic transit lock. 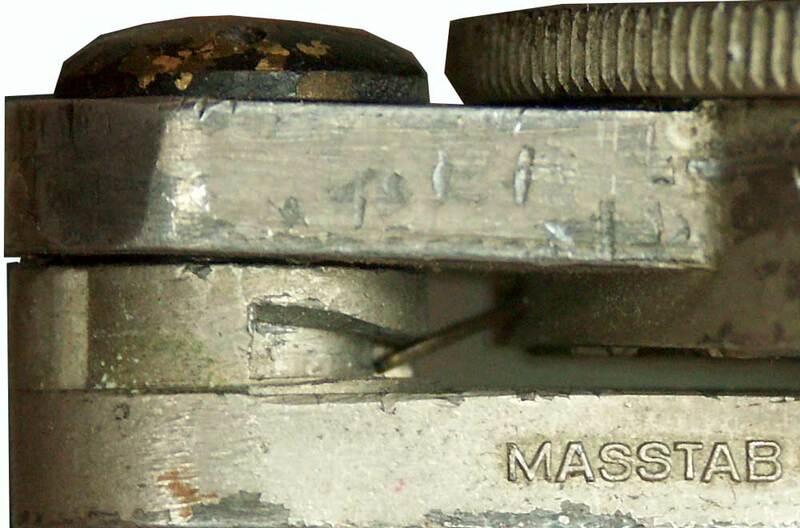 Another famous model was THE MAGNAPOLE of which there seemed to have existed several versions, with fixed and with rotable crystal (without and with lubber line) or with big thumb loop. 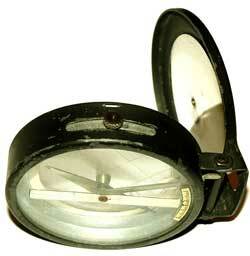 Compare the case with the REFLECTOR. 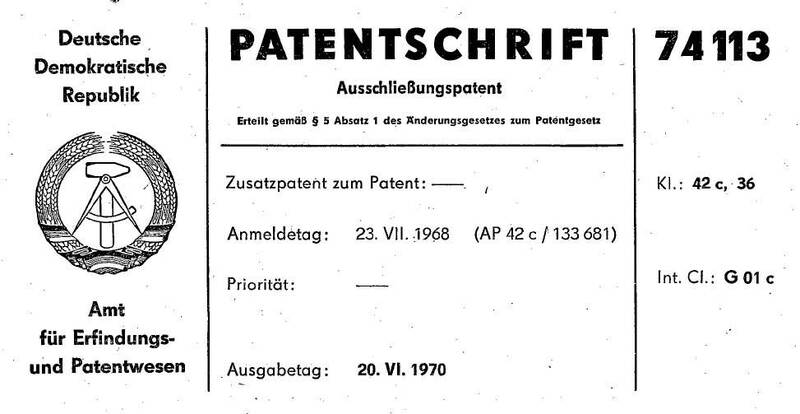 The patent (no. 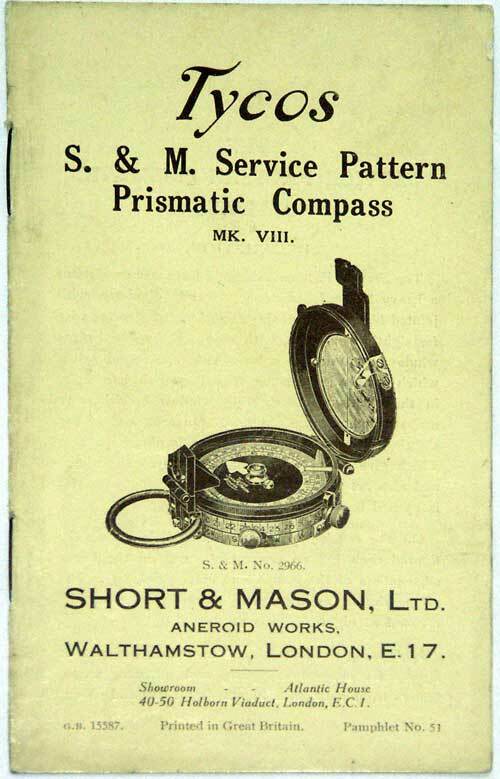 22,598) was filed in 1914 by Francis Edward Collinson, Manufacturer and Short & Mason Ltd, both of Aneroid Works, Mac- Donald Road, Walthamstow, London N.E. 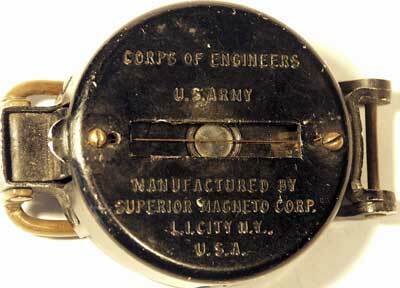 The model designation MAGNAPOLE was also used for a pocket compass in a cooperation with the US manufacturer TAYLOR. PROFILE - Swedish company (for more information click HERE). See also Gunnar TILLANDER. 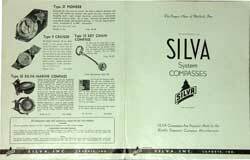 SILVA bought SISTECO in 1990 and still produces their model Mark IV. 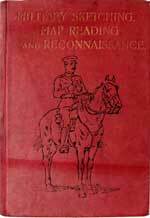 Concerning the special division system (6300 streck) read the relevant chapter in menue Miscellaneous / Divisions / Mils. 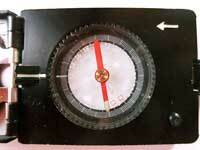 The instrument at right features a 400 grades division in steps of five units numbered every 25. See also the section Wrist and pin-on compasses. 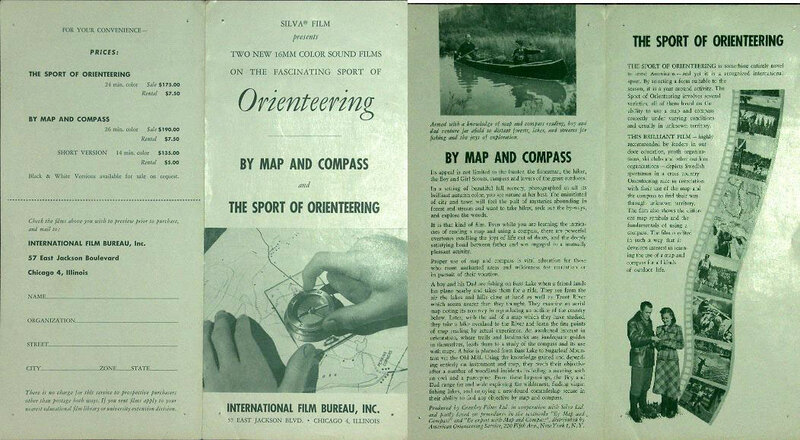 SILVA also produced two movies, one about the use of Map & Compass and the other about the new discipline called Orienteering. 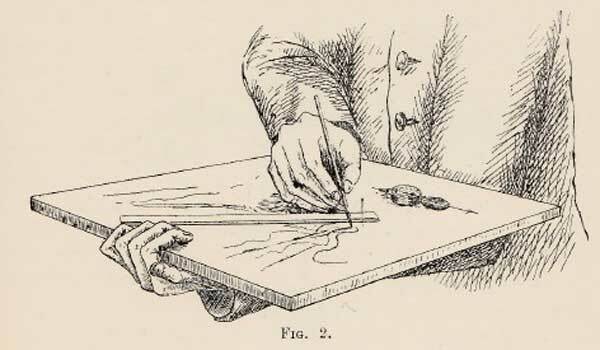 Drawing at r.: French patent issue no. 782.657 (s. Gunnar TILLANDER) Model "Typ 2 "
Picture courtesy Stuart Lamb Model "Typ 3 - 400"
Pictures courtesy Stuart Lamb Model "Type 5 "
- There also was a version with numbered parallel lines and dry capsule. 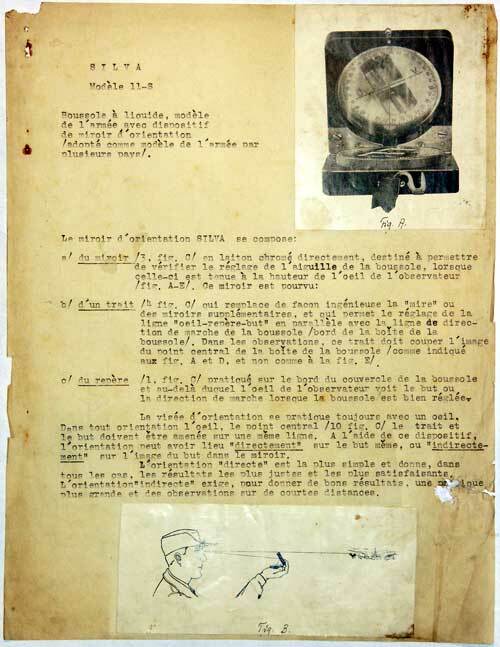 The only user instruction known for the model above is a four-pages type-written French translation with glued drawings. 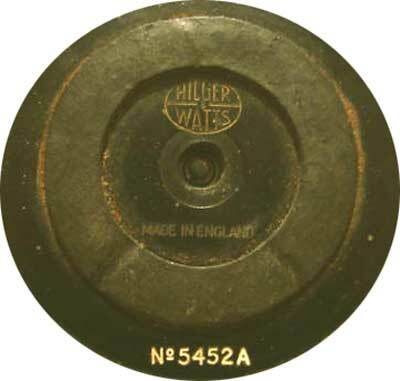 - Divisions: 6300 streck/mils, clockwise plus 400 grades (gon) on the base plate rear face. 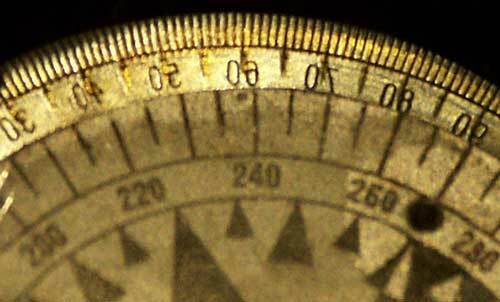 - Parallel lines on bezel aligned on the N-S axis: scale from 0-10, figures 3, 5, 7 and 9 only engraved, total breadth: 50mm / 2 in. 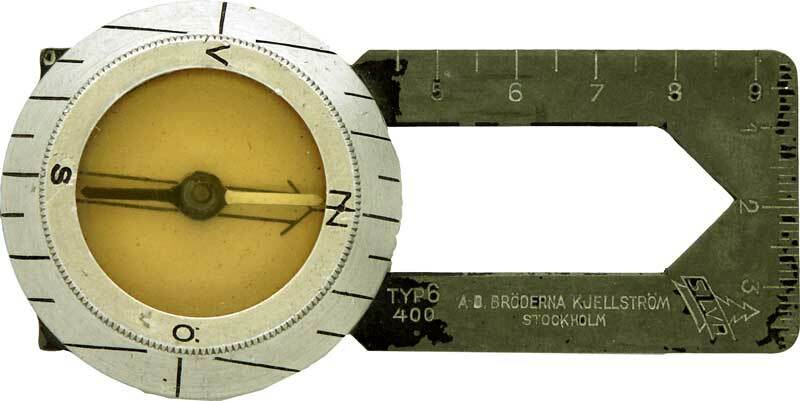 The survey units in Sweden's Artillery use theodolites with the 400 grades (gon) division but the front observers and fighting batteries use the special MIL unit called streck (6300 units in a full circle). Source: Håkan Sahlin, Major, ret. 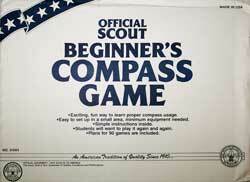 See also Scoutism and (in Pocket compasses) a Compass Game for beginners. - Divisions: 360 deg. 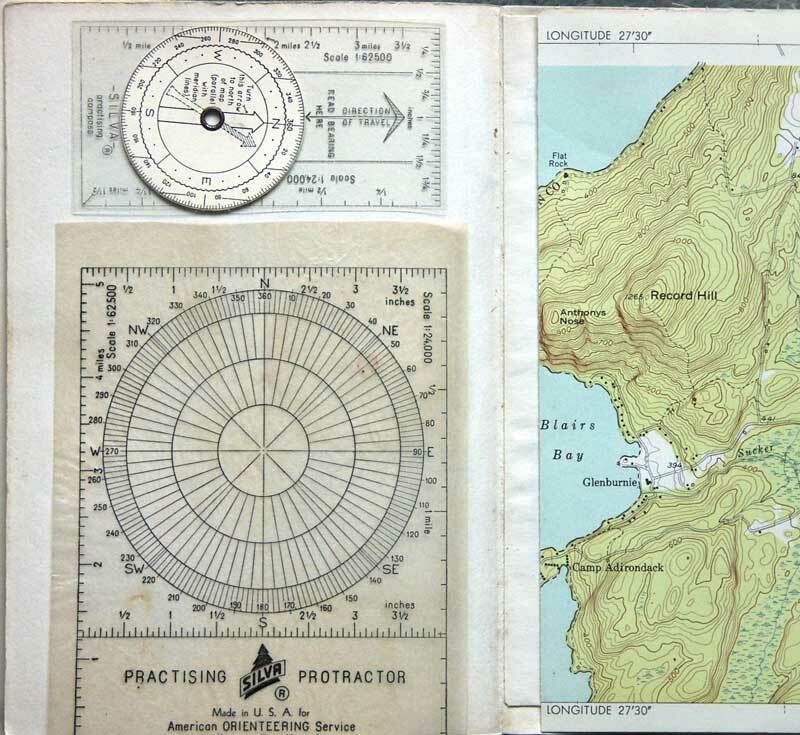 clockwise SILVA founder Björn Kjellström's book Be an Expert with Map and Compass (1955) containing a practising compass* and a map of Lake George's surroundings in the Adirondack park (NY) with the camp on the shore. This model is identical to the famous RECTA matchbox design - produced under licence or customized by Recta? 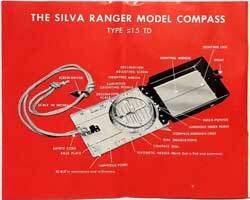 The first compass made by SILVA U.S.A. (created after WWII) was the Type 2 Voyager* displayed in the 1950 catalogue. It was marked 'Reg. Pat. Off.' i.e. Registered U.S. Patent Office. 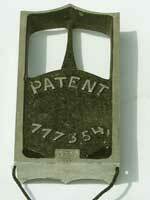 In 1975, the U.S. Patent Office was renamed U.S. Patent and Trademark Office. 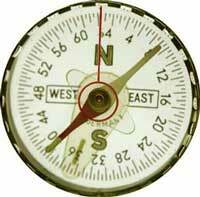 * The same compass model is called Typ 7 in the Swedish version. 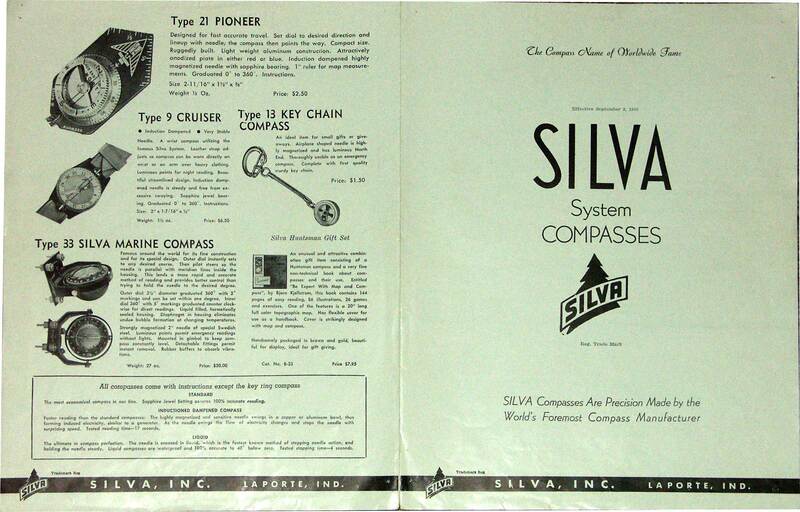 Type 8 Forester (1958 catalog). 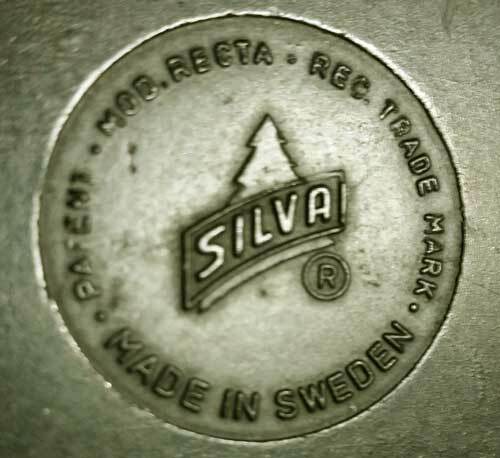 MADE IN SWEDEN ASSEMBLED IN USA BY SILVA INC. LAPORTE IND. and patents numbers for 5 countries (link to pic of back). 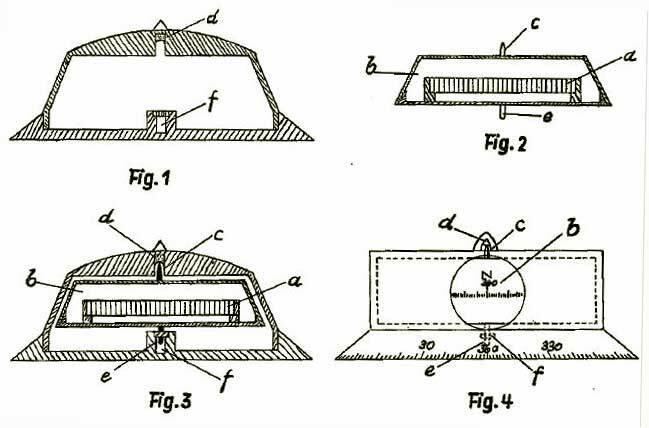 The patent was filed by Nils Henry SANDBERG in 1953. 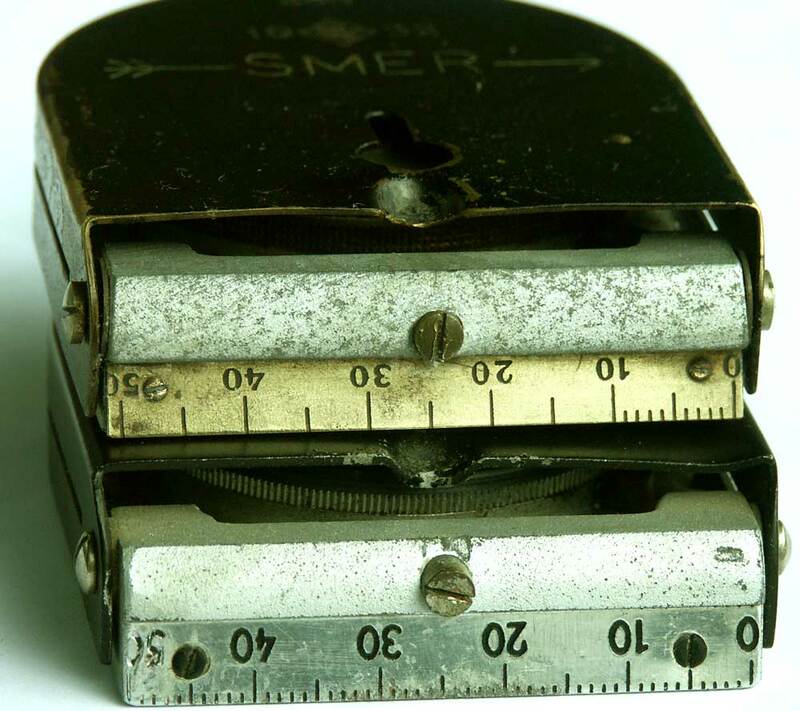 It describes the method for mounting the capsule on the ruler. 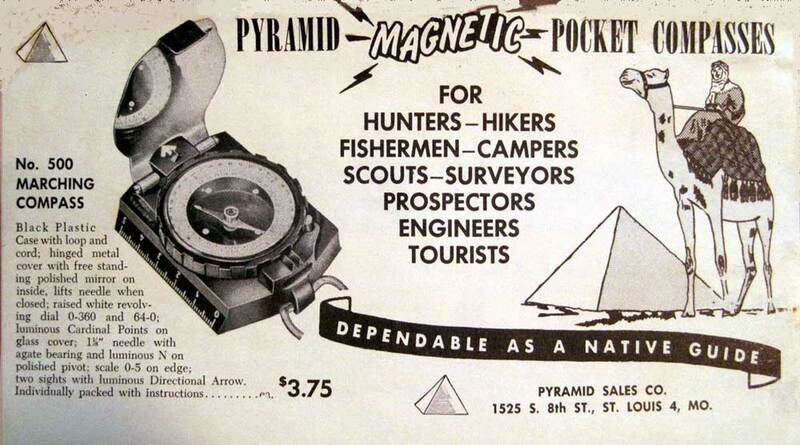 In the 1955 book, the Type 15 was called Ranger and the model called Explorer was almost identical to Type 2. 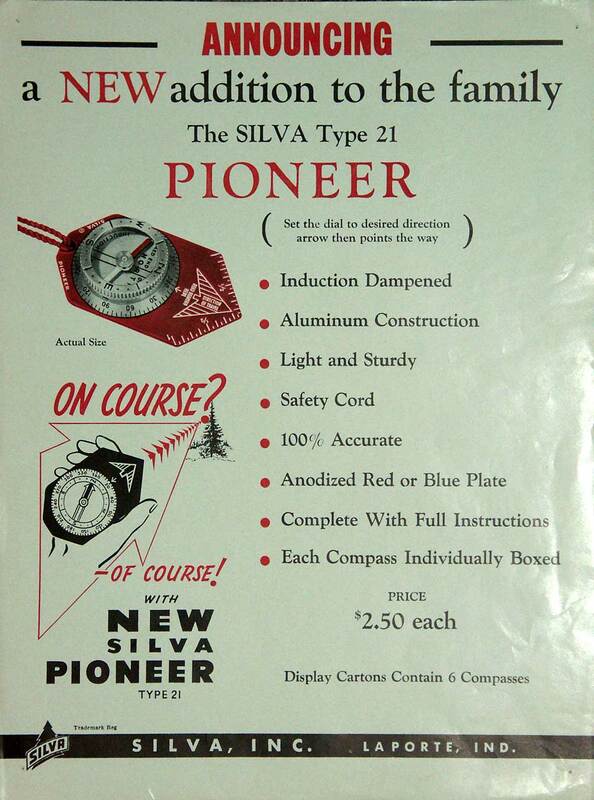 An hexagonal-shaped compass called Type 21 Pioneer was created in (?) but apparently didn't offer any technical edge. On the contrary, its non-transparent base plate is rather a disadvantage. 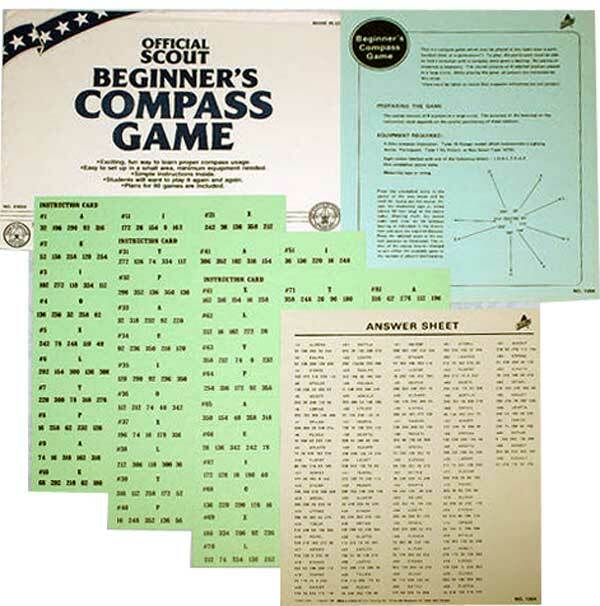 Compass Game (modern version, check HERE the original version - manufacturer unknown). Click HERE for the game rules. 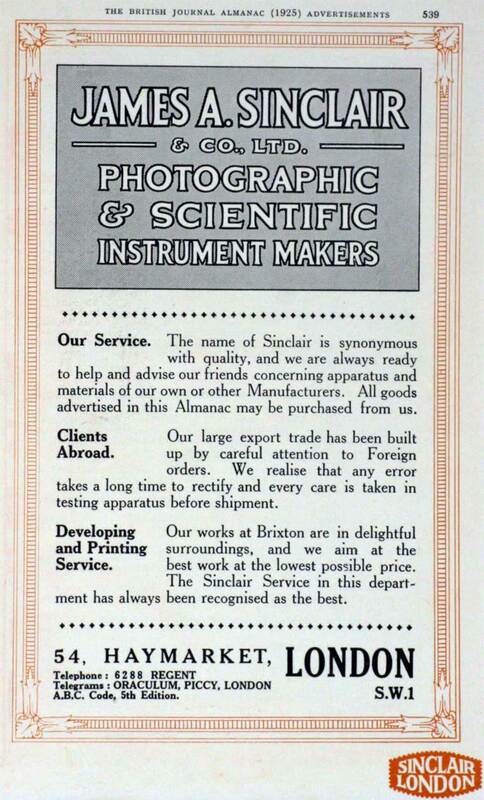 PROFILE - James A. SINCLAIR & Co. Ltd (pic. Graces Guide) was a British manufacturer of photographical equipment (model Tropical Una) and a well-known photographer and the author of a manual. 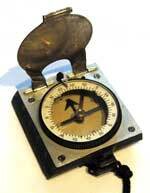 He was a retailer for scientific instruments (signed SINCLAIR HAYMARKET LONDON). He died 1940. 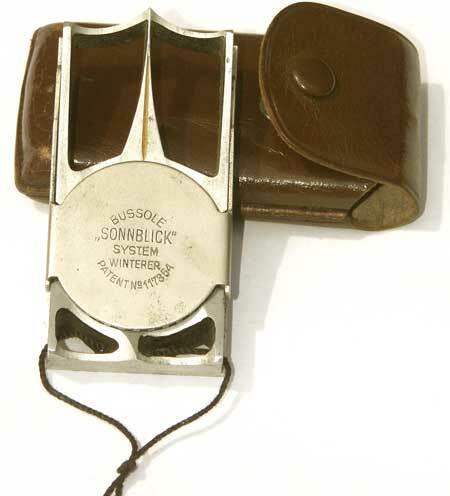 This particular instrument was probably produced by F. Barker & Son especially for Sinclair. It was obviously a transitional design between the Verner's pattern and the successful Mark III model. 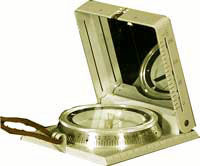 It featured the additional rotating window with luminous bearing line in the lid and the transparent card rim described in Barker's 1910 patent no. 29677 (s. also Steward below). However, its large size and weight were maybe a reason why it was no competitor. 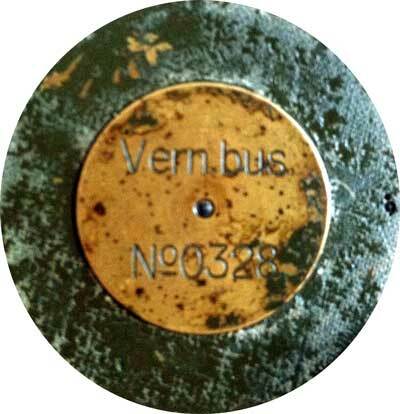 - Markings on reverse: see pic. at left. Compare with F. BARKER's models. Inventor of a famous compass card type (read more details HERE). 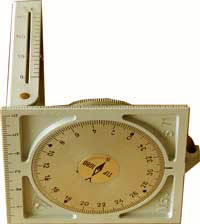 PROFILE - British compass manufacturer (www.sirs.co.uk). 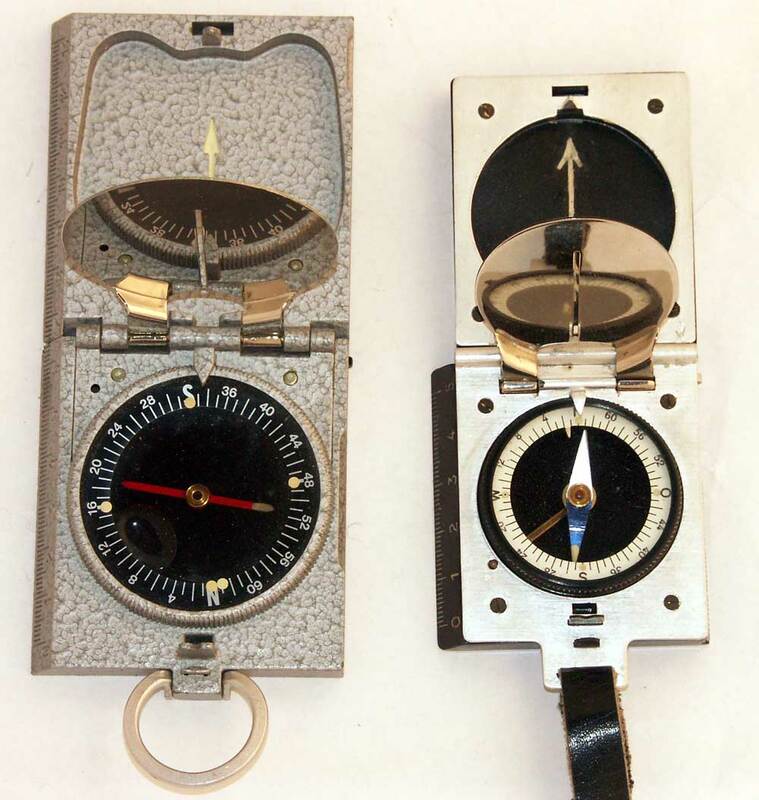 The G150 marching compass (see Stanley below) produced by SIRS bears a label like the one displayed at right. 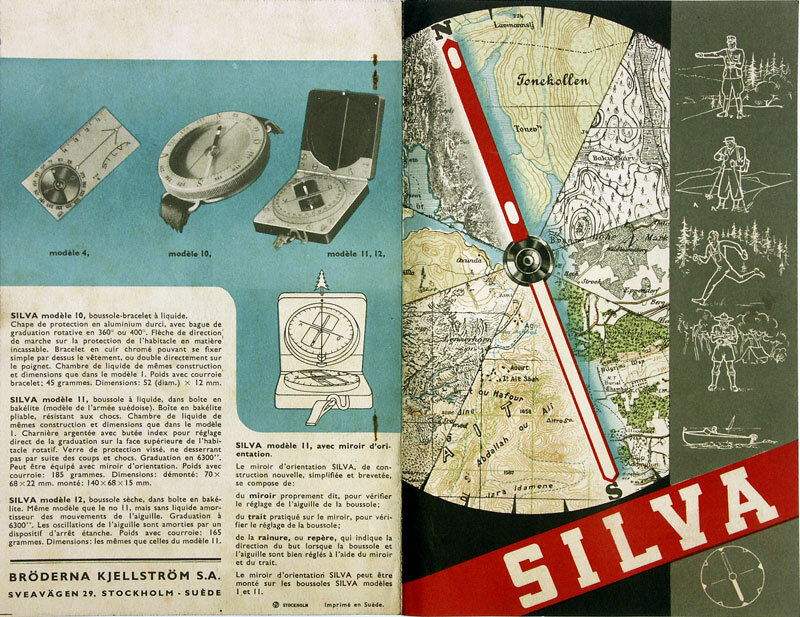 PROFILE - Sisteco Ltd was a Finnish company founded by a former Suunto president to compete with Suunto. 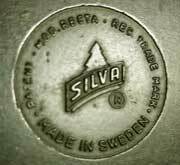 It was bought by SILVA in 1990. 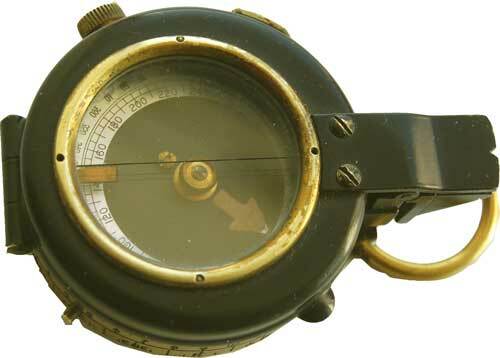 SISTECO built among other instruments this M-71-type military marching compass called MARK IV (compare with Barker and Glauser) and a nautical bearing compass called SIGHT MASTER. 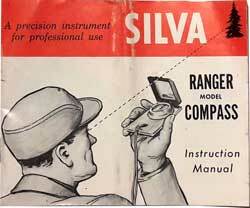 SILVA still produces the MARK IV. 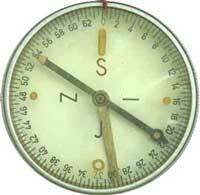 Abbreviation of the company's name Srb & Štys Praha, (see also survey compass SRB). 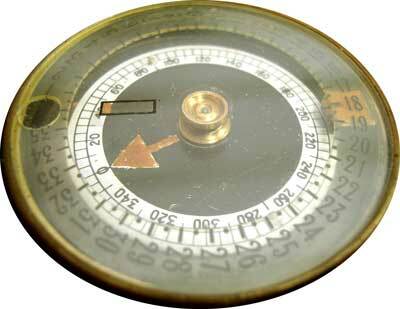 Former Czechoslovakian manufacturer created in 1919 who produced in the 1930's-40's a Bézard-type compass. 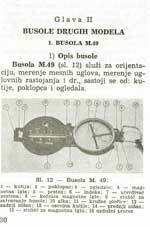 The same instrument was also produced later by MEOPTA (new name of SŠP after WWII). 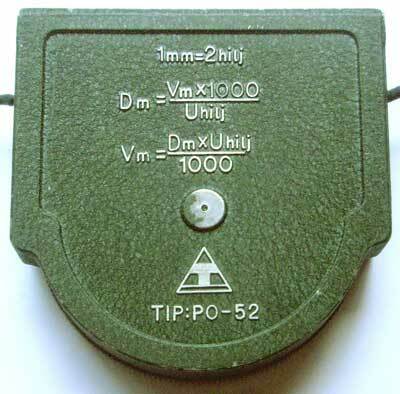 Apparently, the only difference lies in the arrow on the lid which is embosssed on the MEOPTA-signed model. The military version featured the word SMĚR (direction) on both sides of the lid. 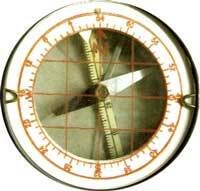 - typical Bézard design of the magnetic needle with a disc-shaped south end and a luminous circle under the crystal. 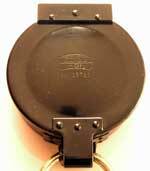 - stop for positioning the lid when open: cylinder head screw. 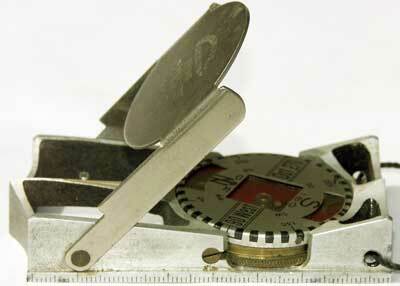 - the mirror is held at a 45 degrees angle by means of a blade spring mechanism which is absolutely unique. 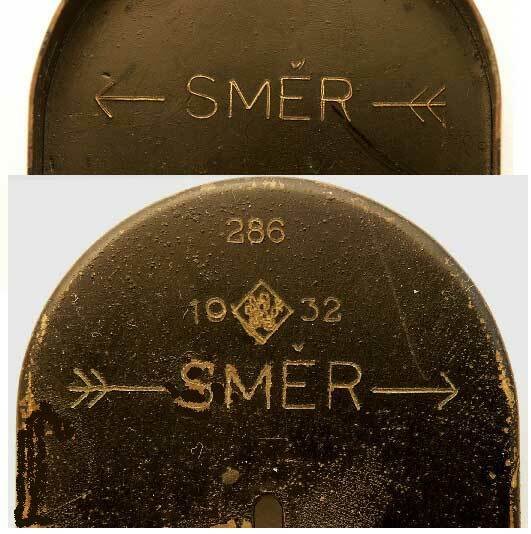 The Army model features on both sides of the lid above the marching direction arrow the word SMĚR (Direction). Moreover, a S/N (?) 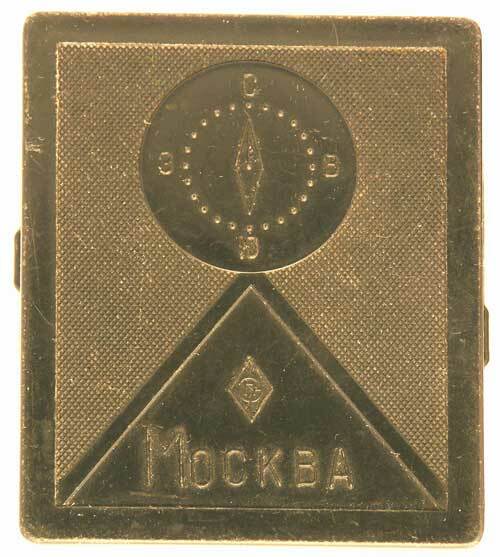 286 and the military unit 10 / 32 on either side of the symbol of the Czechoslovakian armed forces (lion in a lozenge). 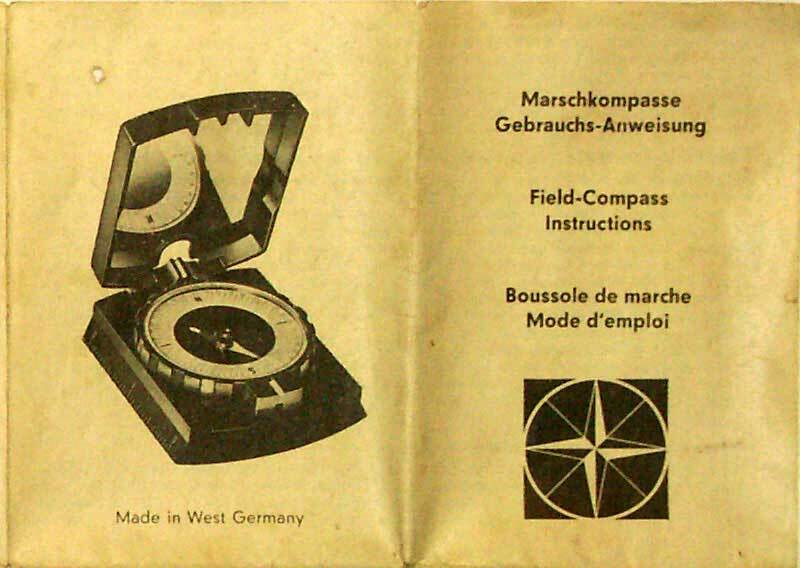 See also Bézard / Imitations / SMĚR and the pocket compass VTD. Top: milit. 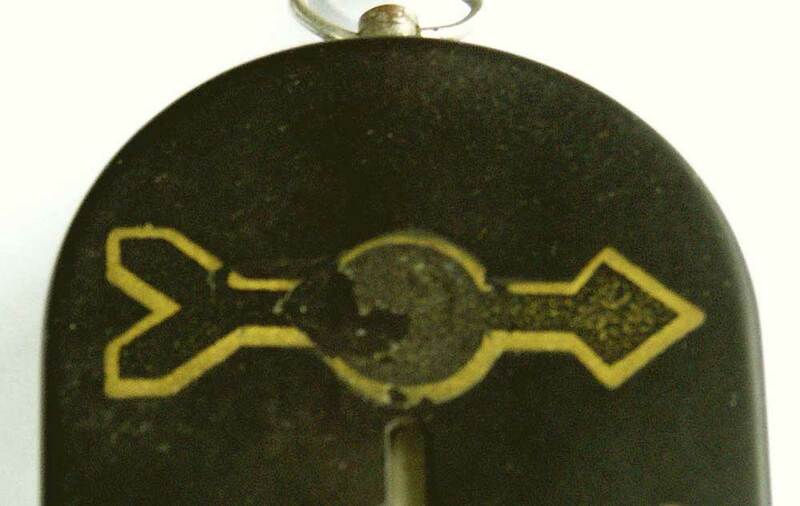 version, brass, 50mm, only 10mm engraved. 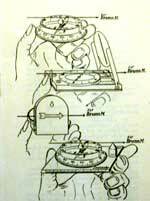 PROFILE - Elmer Ambrose Sperry (October 12, 1860 – June 16, 1930, see Wikipedia) was an inventor and entrepreneur, most famous as co-inventor of the gyrocompass. 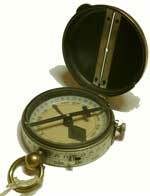 He produced among other instruments the marching compasses designed and patented by Creagh-Osborne. PROFILE - Former British company (more information HERE). 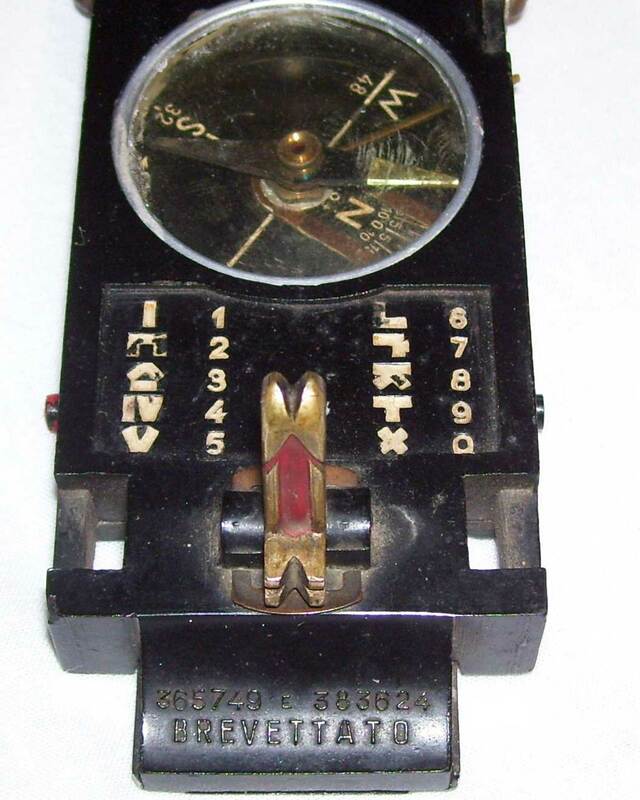 A model built during WWII was designated P.2270 but this instrument doesn't appear in the pre-war catalogue at right in which all item numbers are in a 1400 digit block. 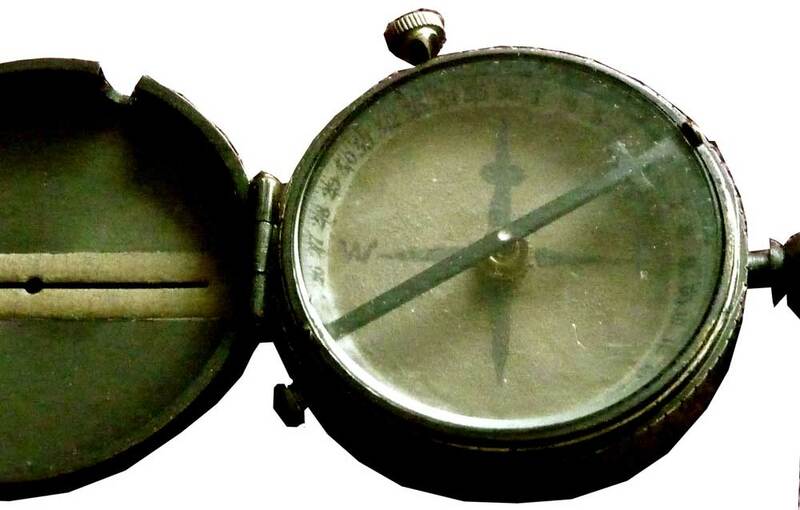 Note: We only know about this compass via an order dated 1941 (link to pic) and have never seen a picture of it. Your help is needed. Many thanks in advance. 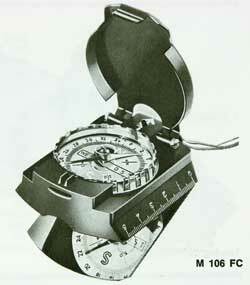 The compass type G150 was designed in the early 1970's and produced until the late 1990's. 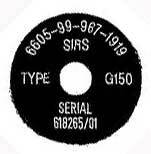 As per 1999, only a few batches were made to special order by SIRS Ltd. (see article above). 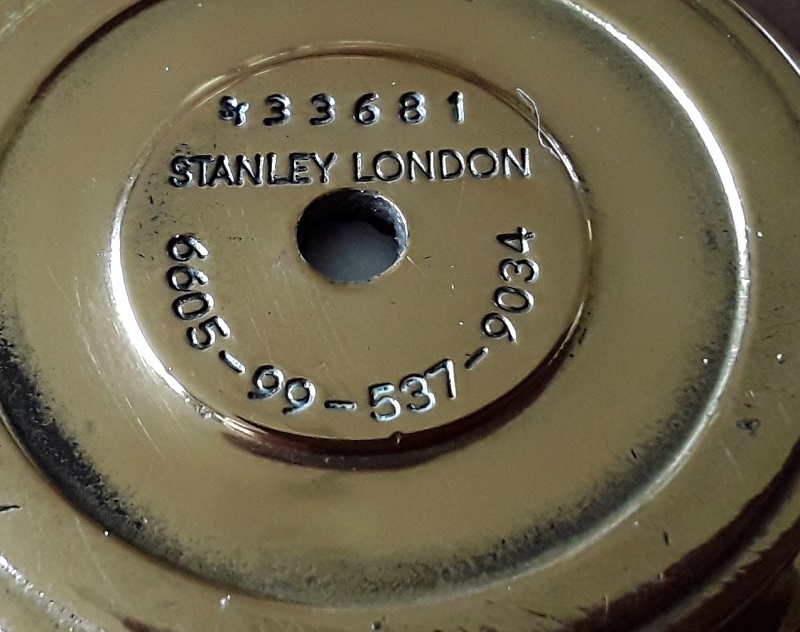 The Stanley name has been discarded and the compass is now the SIRS G150. 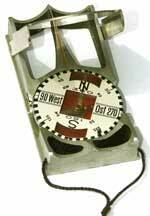 The Stanley G150 Marching Compass is very famous. It was an iconic compass as it was used by British troops during the Falklands Conflict (1982) and the first Gulf War (Desert Storm, 1990-91). 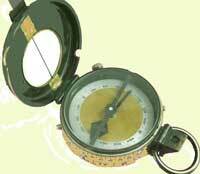 It has an important place in the history of British military compasses. 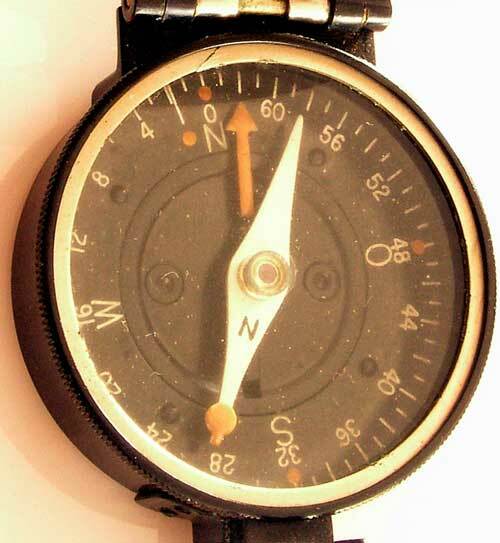 - Manufacture date: mid 1970's ? - Markings on reverse: S/N, mfr, NSN. This instrument was maybe also sold under the brand name DOMINION. 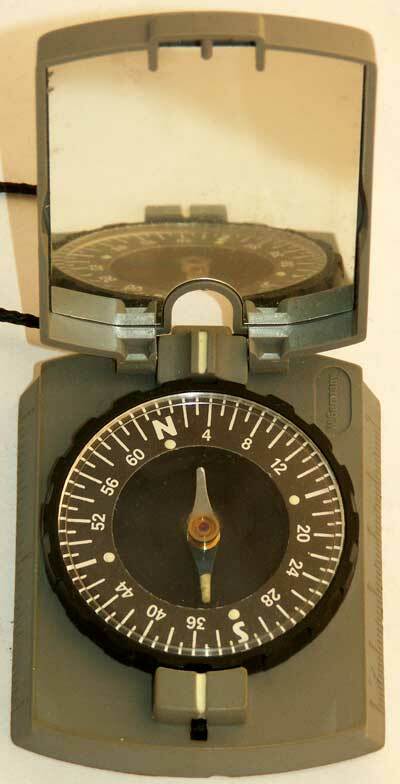 This compass type was manufactured for only one month in the 1980s then discontinued. It’s roughly the same size as the G150, just weighs less, and has a different design. 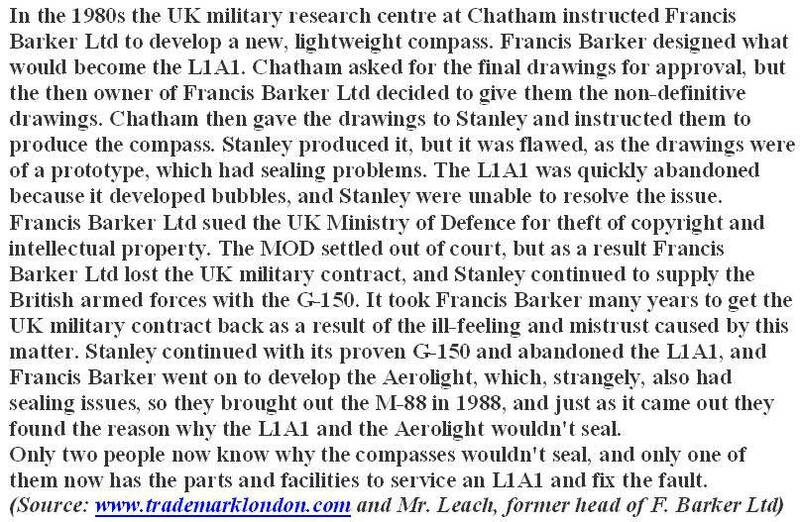 Stanley stopped making them very quickly for technical reasons (leakage problems - read the full story HERE) and continued with the G150. 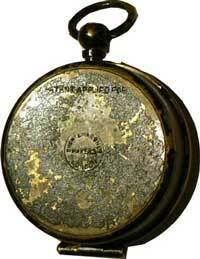 - Material: brass case, aluminum clamp ring, mother of pearl dial, plastic pivot support inside brass bowl. PROFILE - Former German company located Böcklingstrasse 2 (now Lommelstr.) in a southern district of Munich (München-Solln). The company name "Moment-Apparate" appears on the user instructions. It was registered in 1937/38? 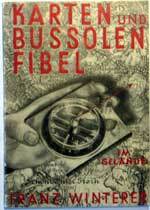 by Carl's wife Erika von Stein-Liebenstein zu Barchfeld. 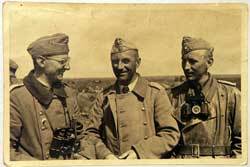 The inscription in the telephone book of Munich for the year 1942 is "Stein, Carl von, (HR), Messgeräte u. elektr.techn. Apparate " (i.e. 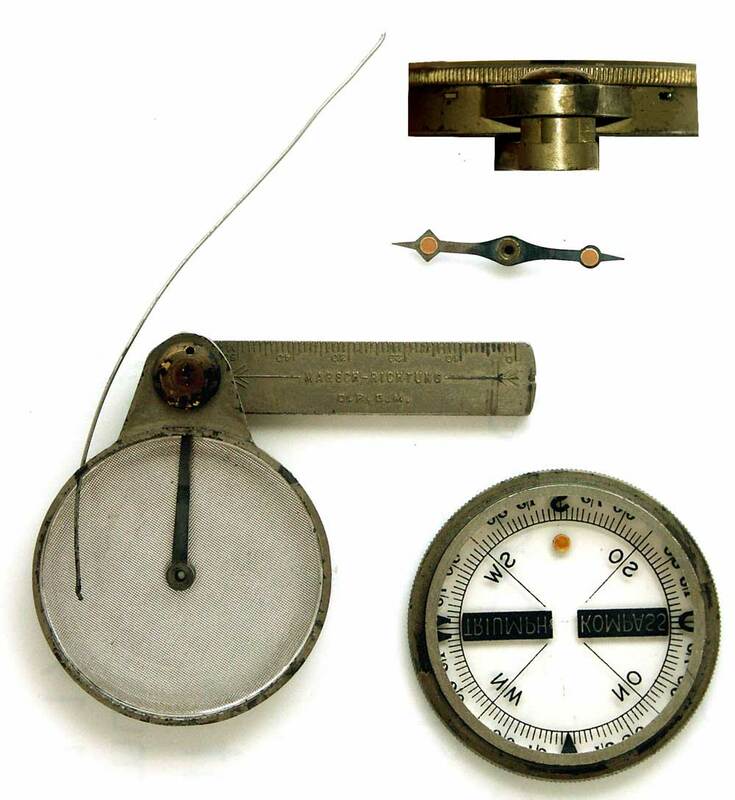 measuring and electrotechnical instruments). 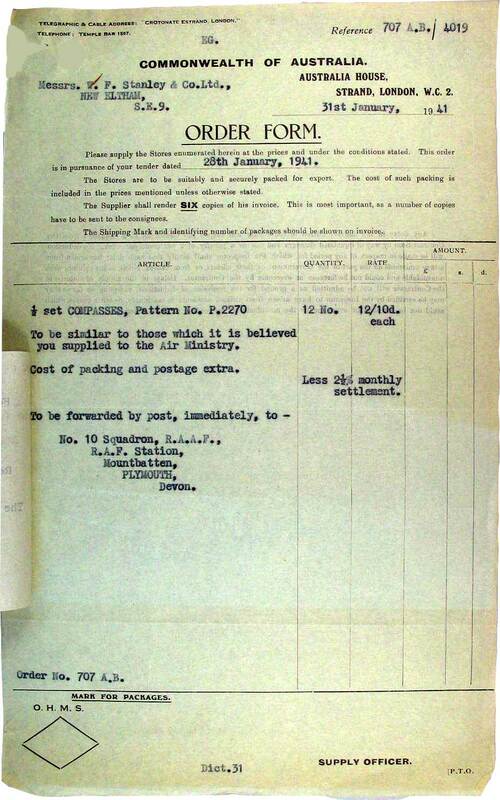 The abbréviation HR = Handelsregister indicates that the company was registered. 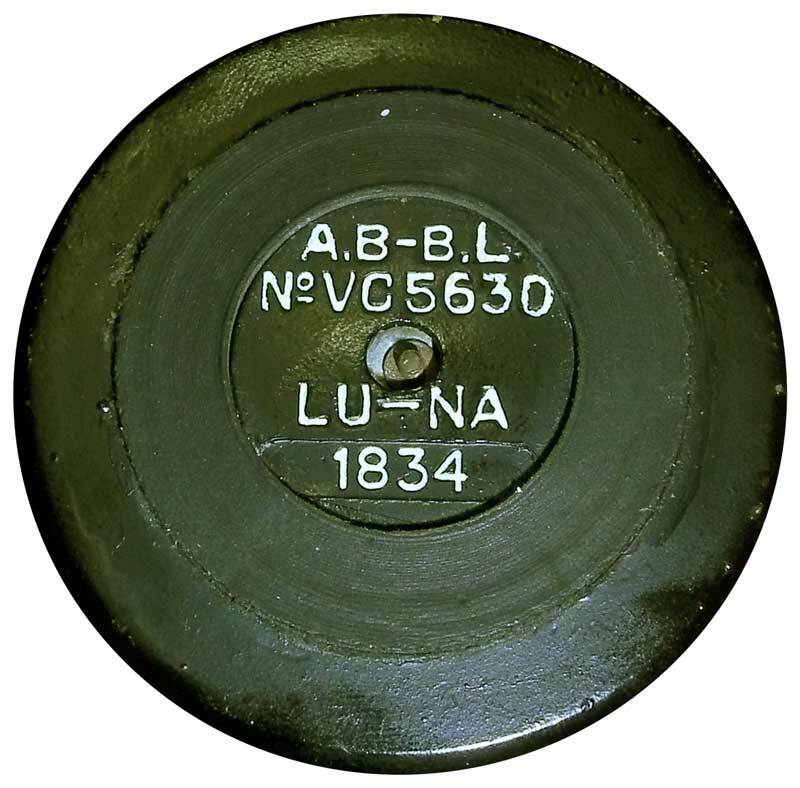 During the first air bombing of Munich on September 19, 1942, a bomb hit the house no. 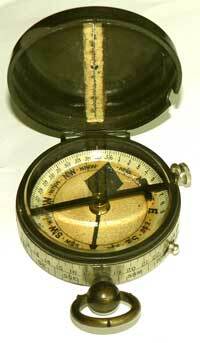 1 on the opposite side of the street and which belonged to the industrial manager Rodenstock (optics). 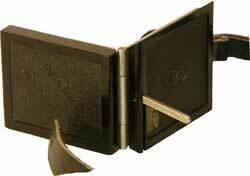 The company was no longer listed in the telefone books in the following years. We assume thus that their house (and maybe the family itself) was probably also badly hit. 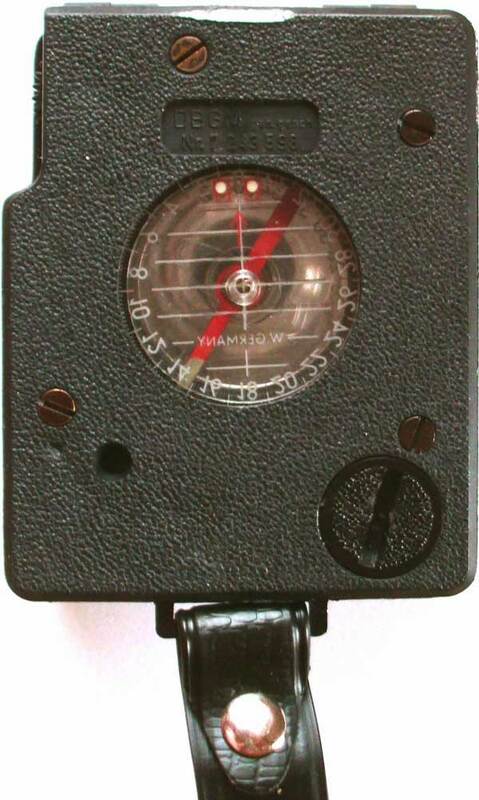 The only known product is this unusual instrument called TYP 39 (since probably made in 1939) featuring a tiny aluminium pocket compass attached to a much larger bakelite case. 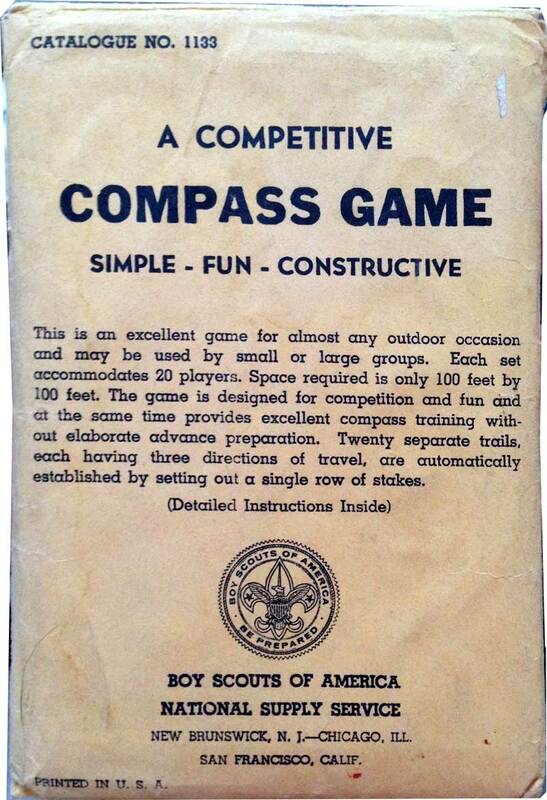 - Divisions: 6400 mils, counter clockwise in the compass and on the course setting platte. - Marking on cover: "v. Stein"
- User instruction (photocopies can be ordered). 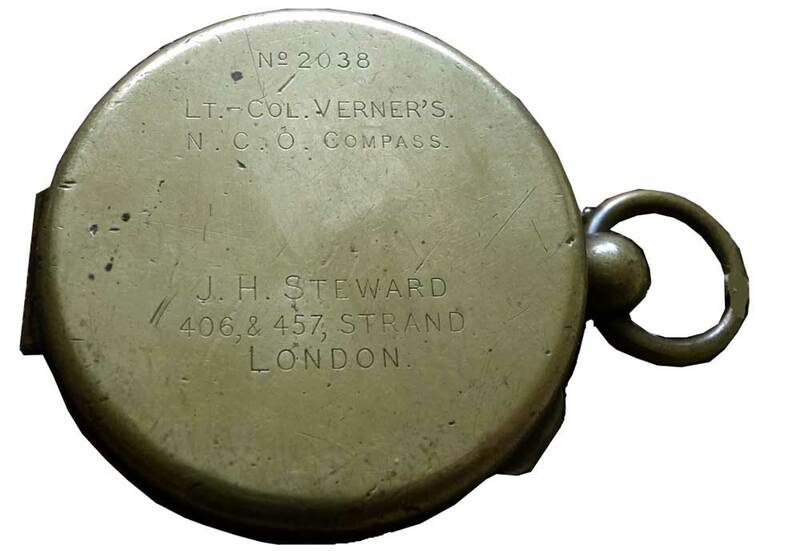 PROFILE - J. H. Steward Ltd was a British manufacturer (more information HERE). 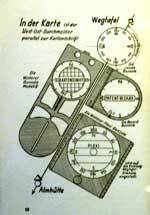 Steward's instruments were described in several Army Manuals (below) and especially Captain VERNER's book Military Topography (1891). 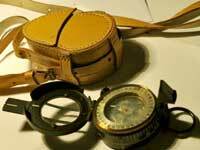 See also Wrist, Pocket, Survey and Nautical compasses. - 1st row: Instrument called "VERNER COMPASS" Mark III wich was not yet a prismatic built in 1887 (go via the menue Miscell. to Terminology/Mark for the chronology of the designations). Compare with the earlier model displayed in the section Pocket compasses. J.H. 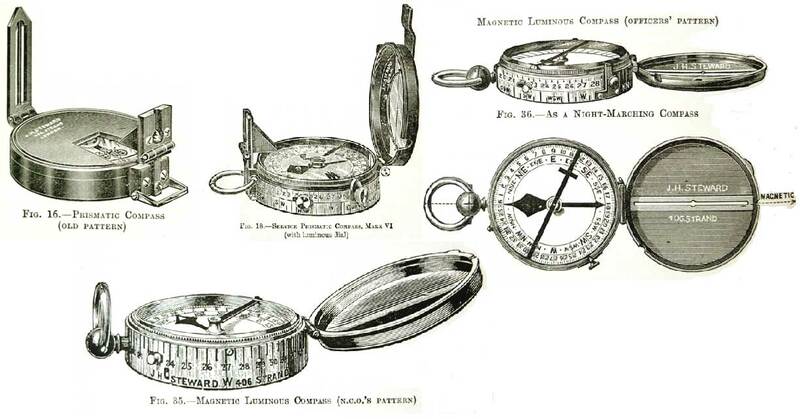 Steward had his company's name printed on all compasses featured in the British Army's official cavalry manual for military sketching, map reading and reconnaissance (see table below). 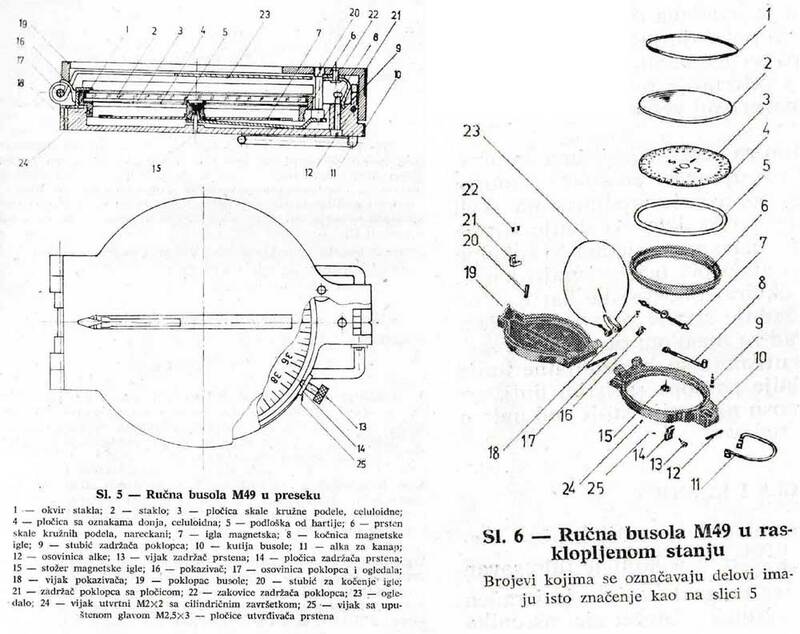 - 2nd row: Special version of a Verner's pattern Mk VII for missions by night (WWI). 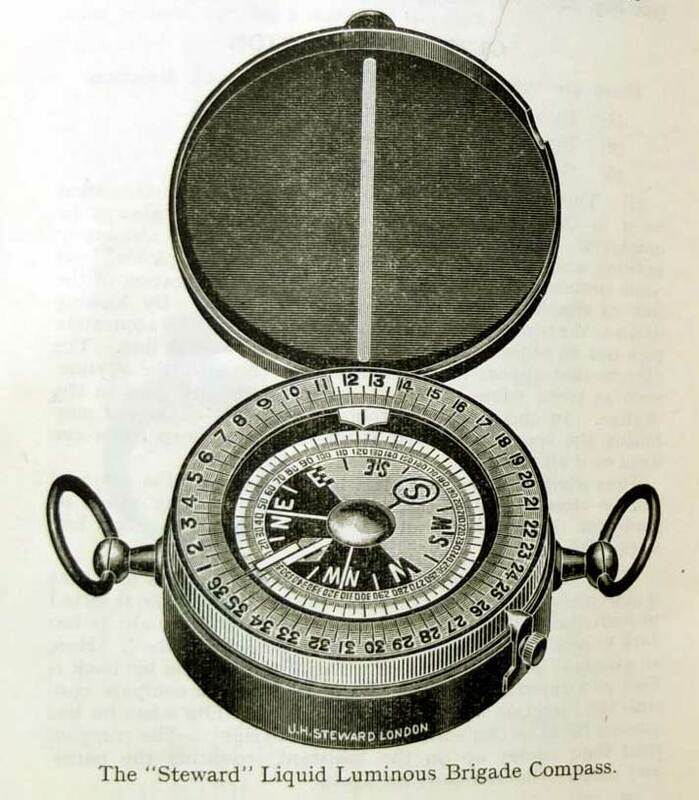 The compass card's central part features a design that Barker tried to register under the name Royal Geographical Society (Sept. 5, 1903). This was rejected twice* and Barker eventually only used the abbreviation R.G.S. 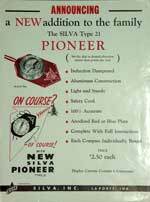 without further explanation in their catalogs for the design no. 416645 between 1906 and 1926 (other examples: see BARKER). 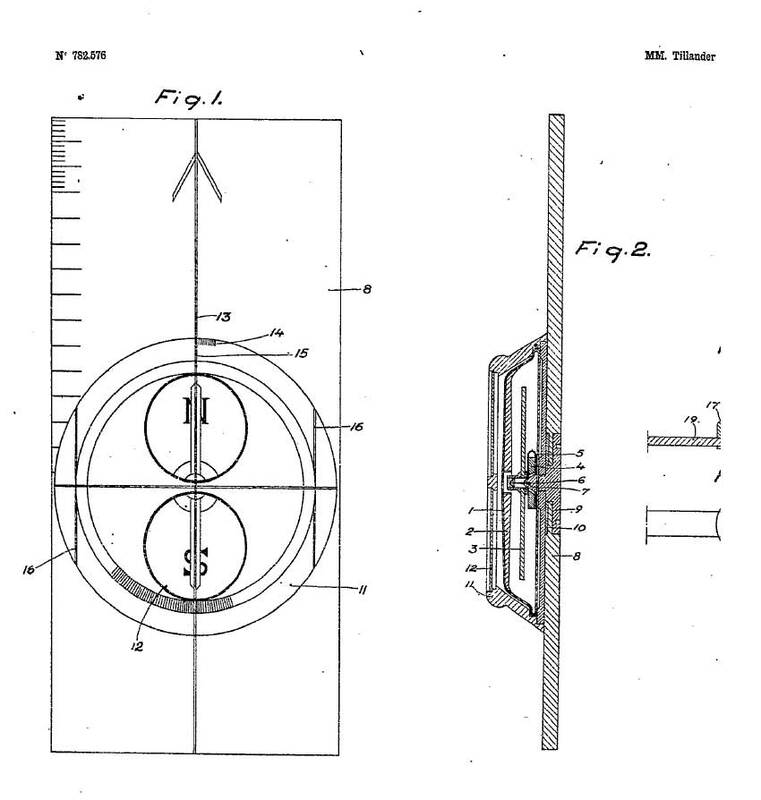 The Barker Patent no. 29677 (Dec. 21st, 1910) indicated on the rear side refers to the transparent card's rim (see also MORDAN) and the additional rotating window with luminous bearing line. The figures could be read through the prism in the dark thanks to a large Radium-paint dot located exactly under the prism. 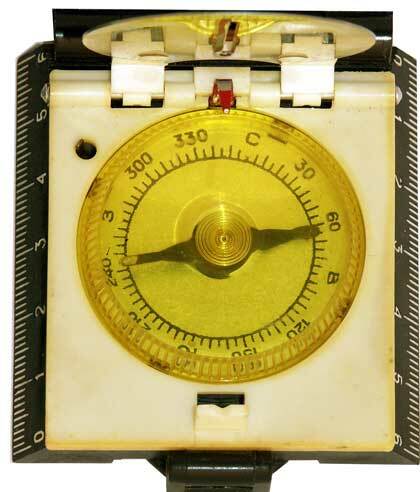 This variation has a brass bezel instead of the usual glass index ring, and has a double-glazed lid window, the inner glass etched with the ususal vertical sighting line, and the outer glass bearing a Radium-paint line that can be rotated through 90°. 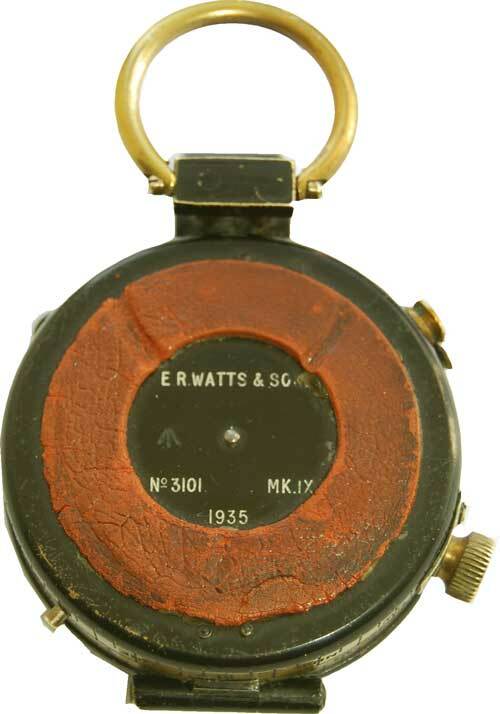 - 3rd row: Standard WWII Mark III version (see Barker), Service pattern and Singer's pattern. 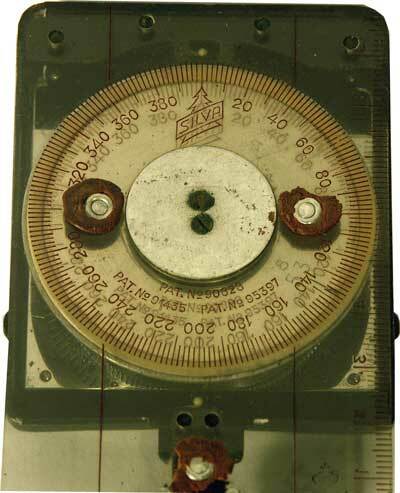 - Markings on reverse: A.H.S. 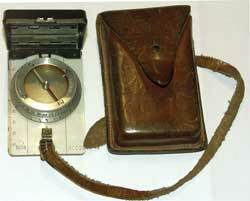 The case is almost identical to the lensatic instrument made by F. Barker & S.
Marking: H.O. (Home Office?) 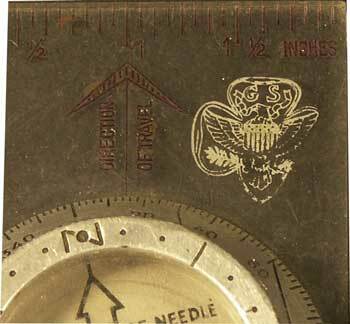 crowfoot arrow head (British Army symbol) 27 = 1927? PROFILE - U.S. manufacturer who produced like many others the lensatic compass type M-1950. 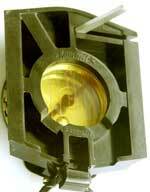 PROFILE - German company (for more information click HERE and visit its website). 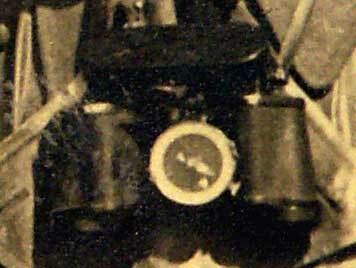 C. Stockert's logo before WW1 featured a cane (Stock in German - see picture at right) and two letters S. Later, it was replaced with the name's initial letter (S) inscribed in an elongated hexagon. 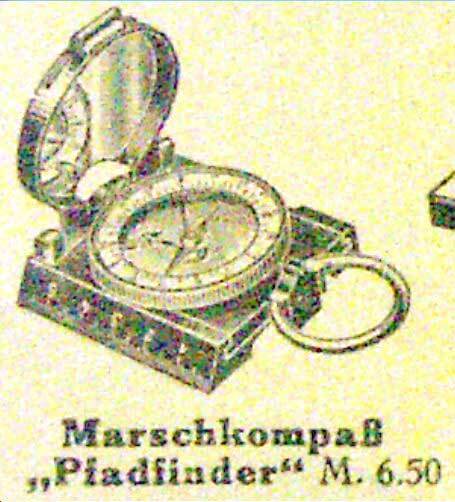 In the 1930's-40's, there were four different models: Marsch- / Touristen-compass, Pfadfinder, Jugend and one without name. 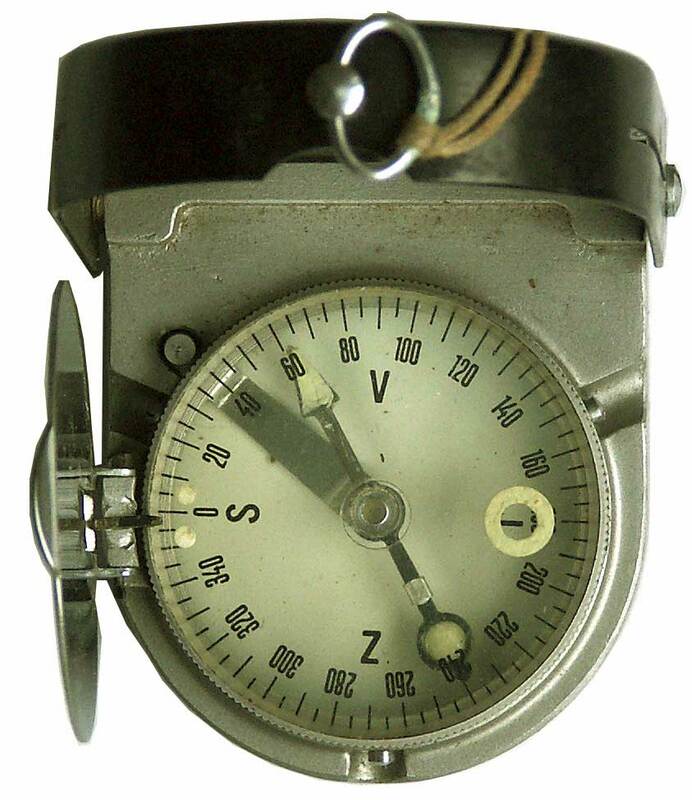 The model Kommit was produced after WWII. 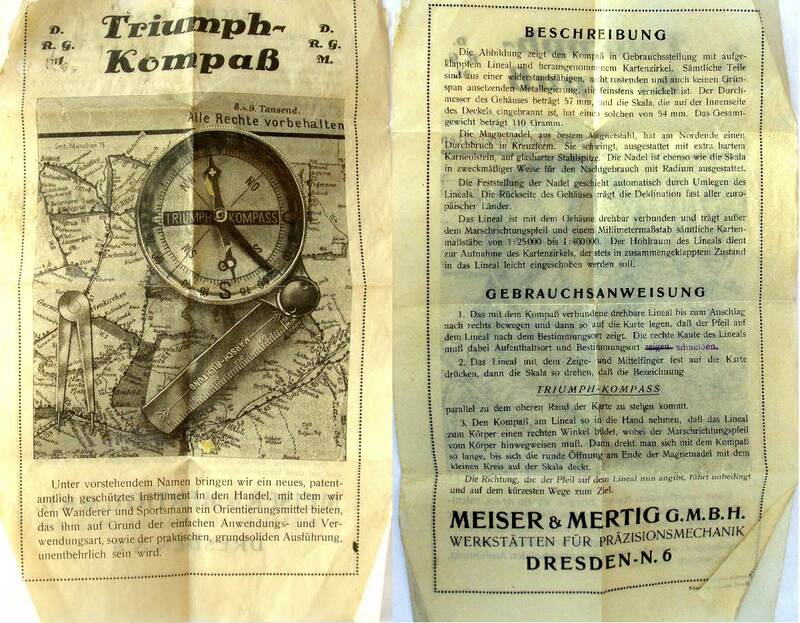 There was a tight cooperation with the other two compass manufacturers located of the vicinity (Fürth and Nuremberg) and the catalogues of C. Stockert, PASTO and Wilkie were similar in respect to form and content. 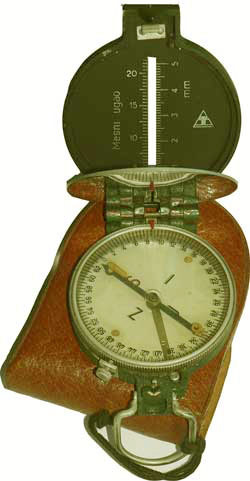 The TOURISTEN-KOMPASS differs from the MARSCH-KOMPASS in one point: the lid's case and left side is identical to the compass case and features a second half of the ruler (total 10 cm) on an oblique face. 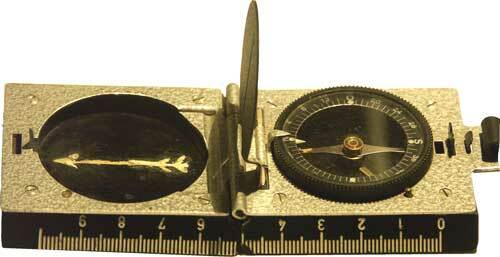 Both compasses feature on their right hand side a barely visible 60 mm long ruler with raised divisions and figures. The compass dial was at that time white as usual (see the BUSCH JUNGENDIENST COMPASS) with black divisions and cardinal points. Later, this design changed (white divisions and letters on black ground) since this is easier to render these markings luminous with bright paint. 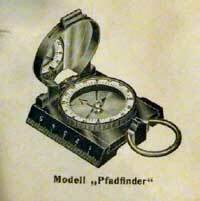 The first version of the model Pfadfinder (i.e. pathfinder, scout) featured a slot in the lid and no DRGM abbrev. 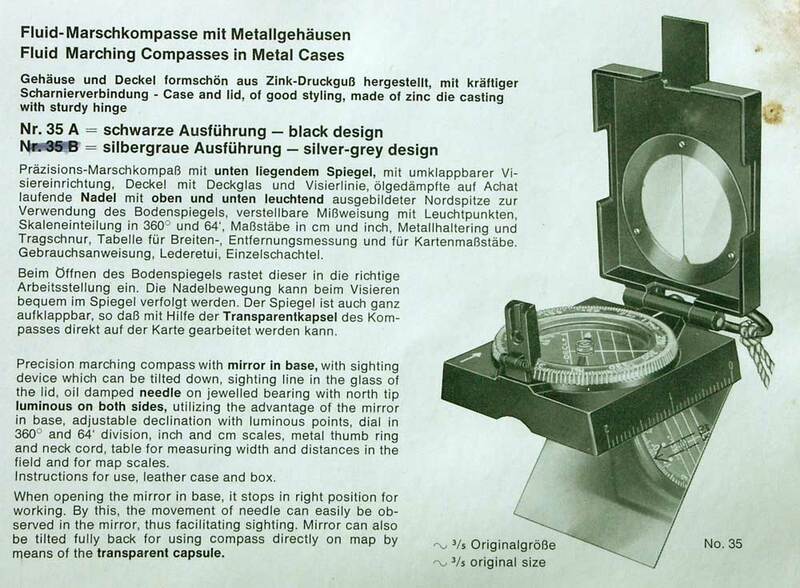 The version shown in all catalogues and user instructions featured a mirror and a white face. The Pfadfinder compass was slightly different from BUSCH's Jungendienst- Kompass and featured a thumb loop which opened the lid when rotated upwards (patent no. 476998). 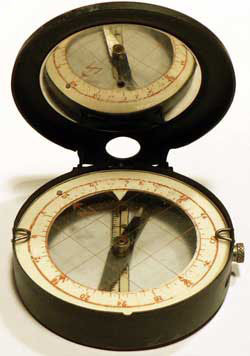 Click on the image above for a description of this compass and of the three following models in the catalogue for 1938. 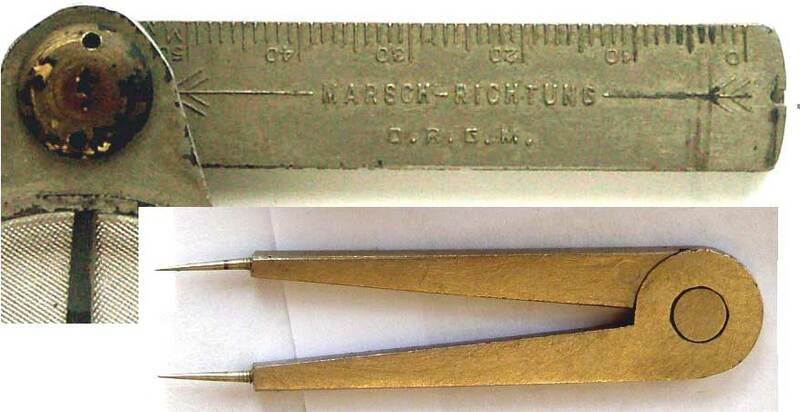 Two versions of the Marschkompass are known: the early one with a white chapter ring and a 50 mm ruler and the later one with a black chapter ring and a 100 mm ruler. 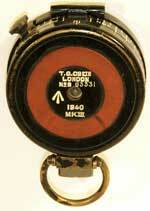 Click HERE for a picture of a "Pimpf" (military Pathfinder) taking a bearing with a MKo. The swivelling holding lever which equipped all compasses. 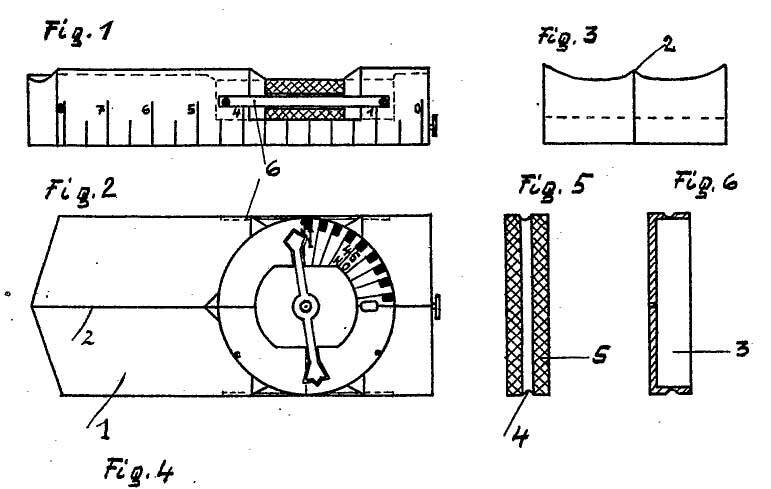 Patent (1938) - click on picture for pdf view. 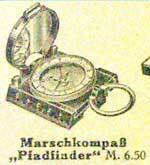 A luxury early version of the Marschkompass featured a red needle and a brass bezel (later replaced by plastic). 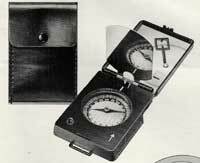 The mirror had no sighting slot and the case no swivel lever. 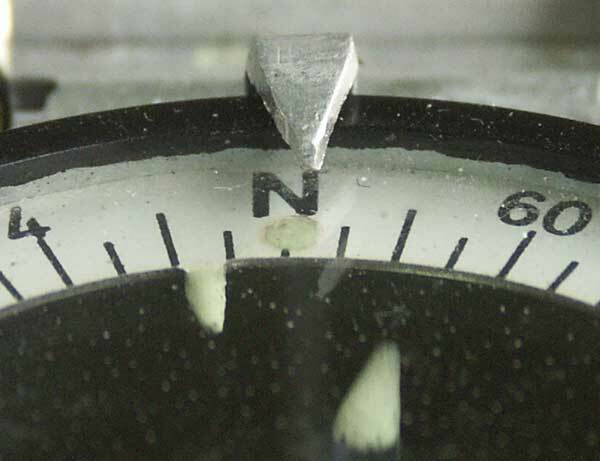 The Magnetic North reference was a tiny pin attached to the side wall on the early version but a protruding sharp edge of the scale on the later one. 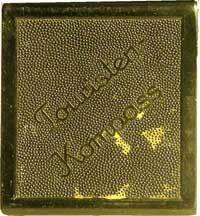 Upper side of the "Marsch-Kompass"
Upper side of the "Touristen-Kompass"
There were four different models (see prices above): with or w/o mirror, with normal or radium paint markings (pic. below r.). 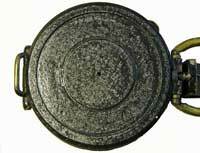 Late definition (black scale, divisions clockwise). Simple model without mirror. 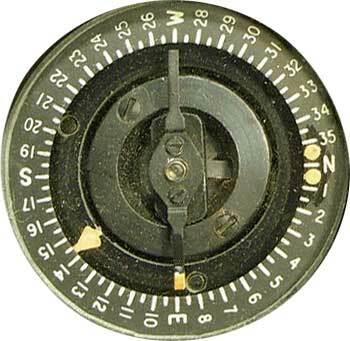 The magnetic needle can be locked by means of a small brown lever. 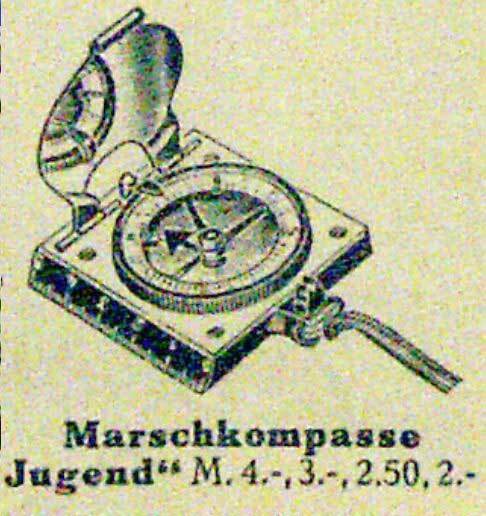 Box of the Jugend-Kompass: The text said on the old one (click to see it) that marching was more pleasant with a compass. 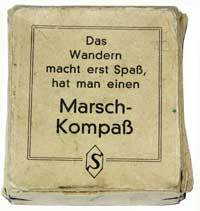 After WWII, this word was replaced by hiking (Wandern). 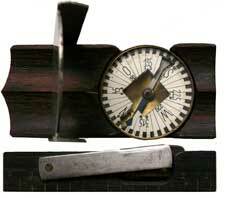 - Rulers: 50 mm and 2 in. The KOMMIT and PFADFINDER models in a modern fluid-dampened version. 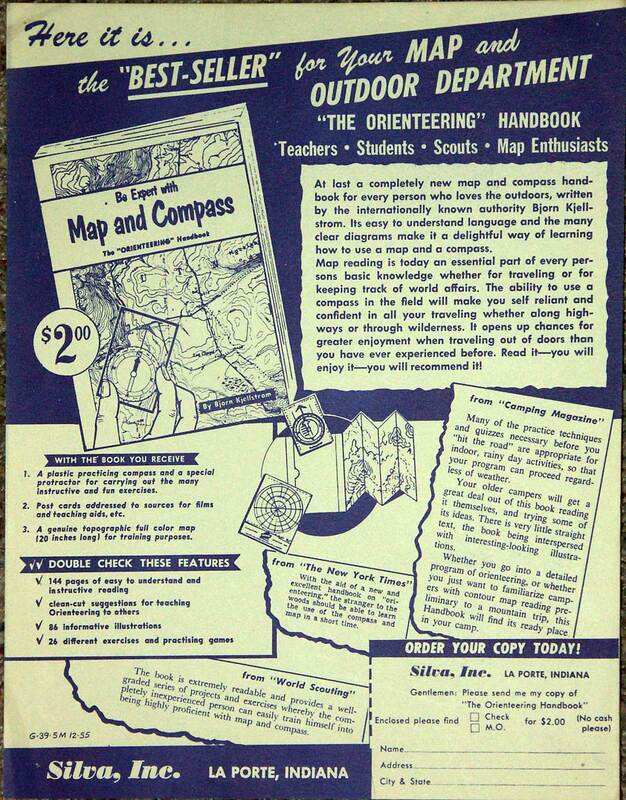 Modern fluid dampened version of the boy scout compass. 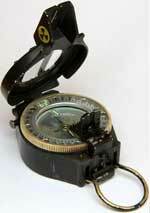 - Automatic opening of the lid by turning the loop, - Folding grip lever. 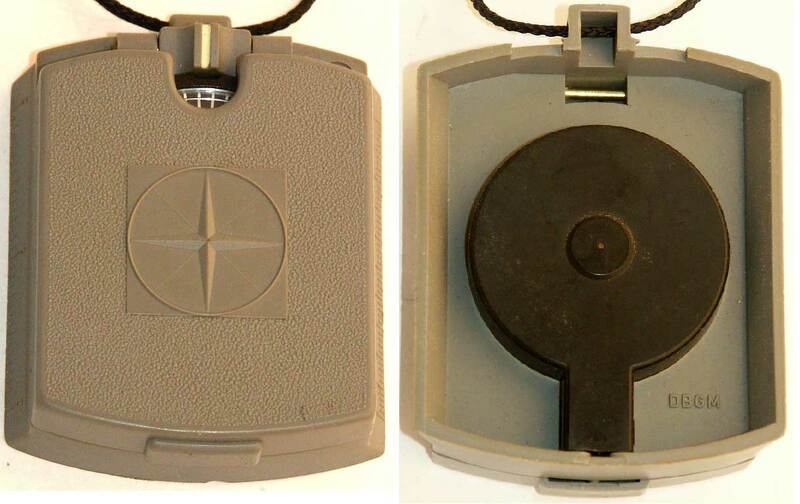 The Marschkompass model in grey plastic case was available with dry or fluid capsule. The abbreviations D.R.P. and D.B.G.M. on the obverse (see MISCELLANEOUS/ Terminology / Abbr. 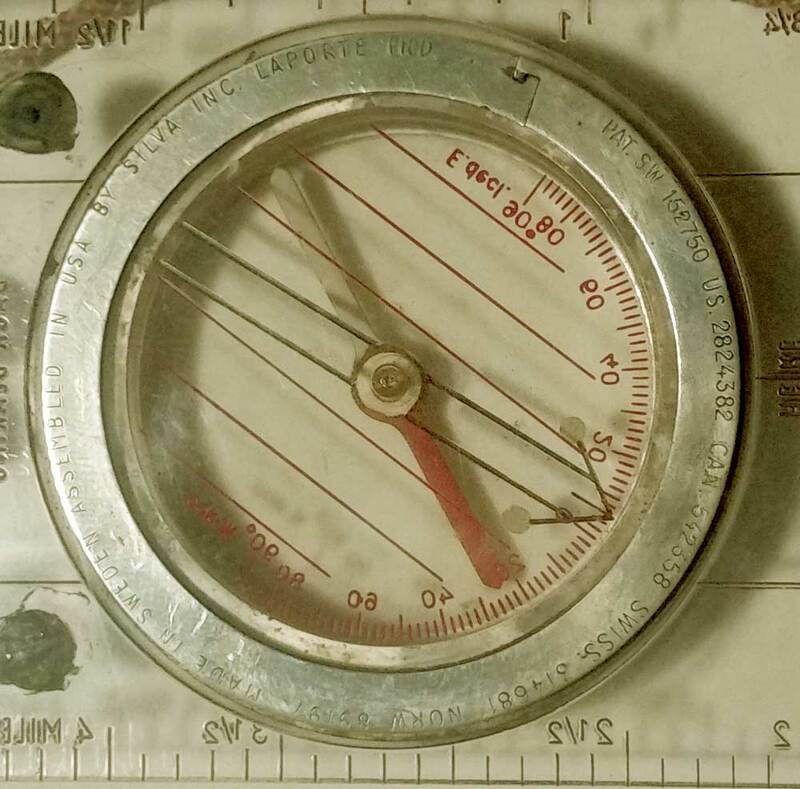 ), indicate a probable production date in the late 50's or early 60's. The 'S' logo doesn't appear on the liquid capsule version. 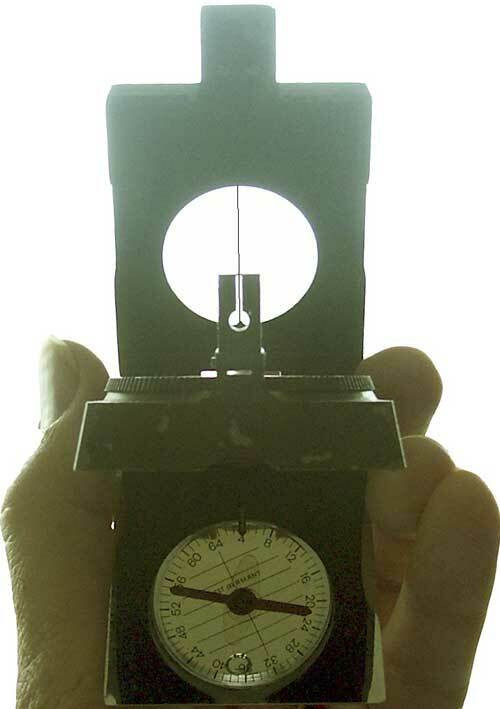 Moreover, there was a large version (breadth: 65 mm; ruler, fully opened: 130 mm). 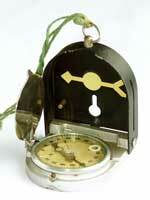 The early one (see letter to the Heereswaffenamt, dated 1940) featured a dry needle capsule (6400 Mils, counter-clockw.) 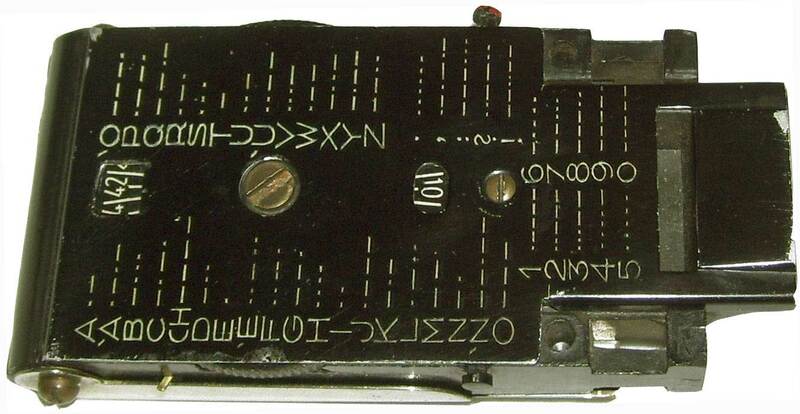 in an Elektron case painted black. 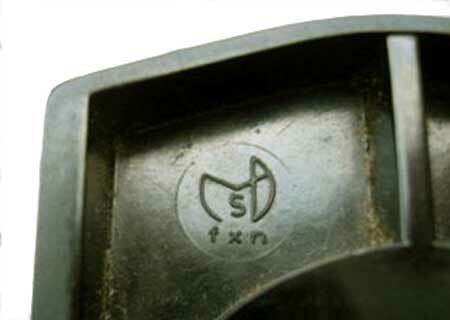 The surface of the external sides featured a grid of tiny "diamonds" (losenges) and the only markings are the usual logo (a small S in an elongated losenge above the thumb ring axis) and the abbr. DRP at the opposite border. 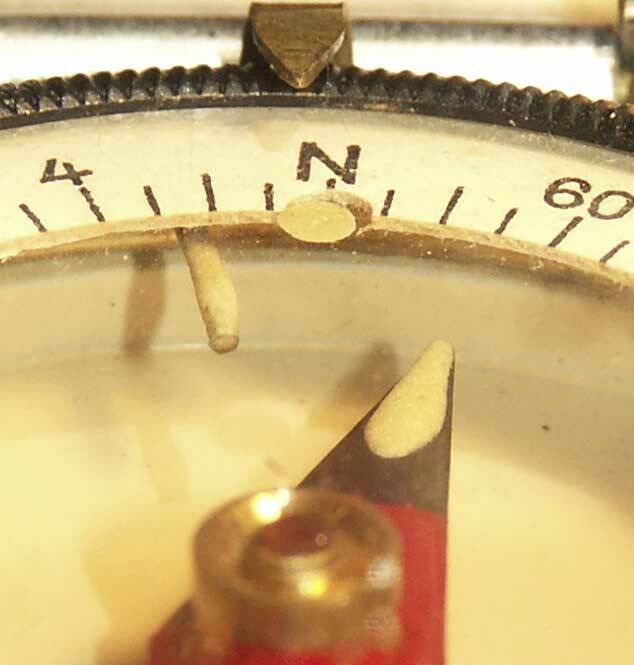 The later version featured a red fluid-dampened needle in a light alloy casing (6400 Mils, clockwise). The surface protection was a sort of "hammered" grey paint. 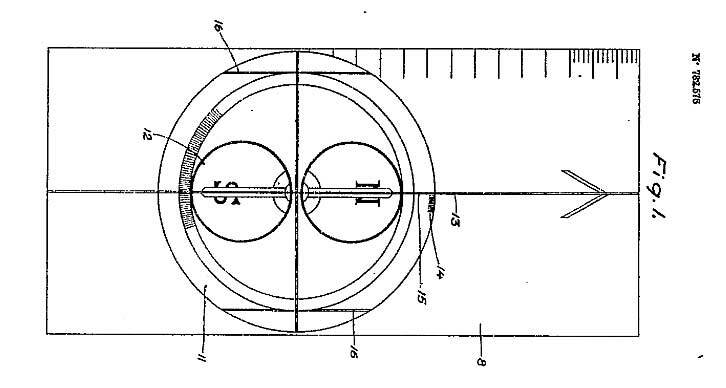 The fluid damping capsule akin the KOMMIT model above was most probably supplied by WILKIE. 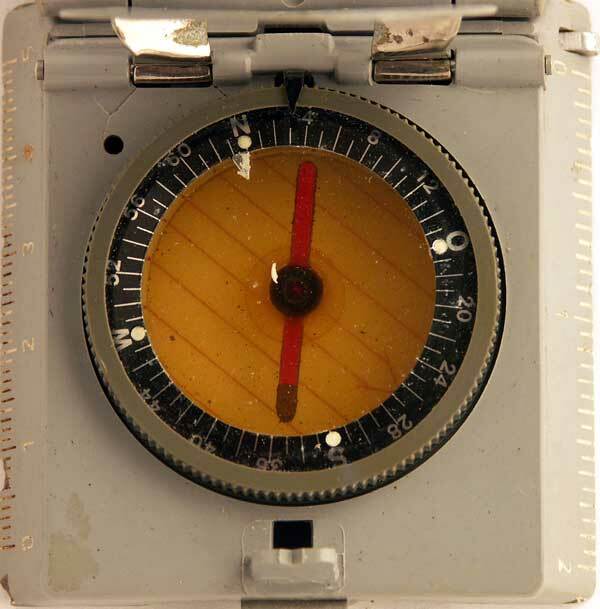 A model featuring a clinometer and a bubble level was produced in 1980 with an olive drab case (Pic. courtesy F. Liebau). 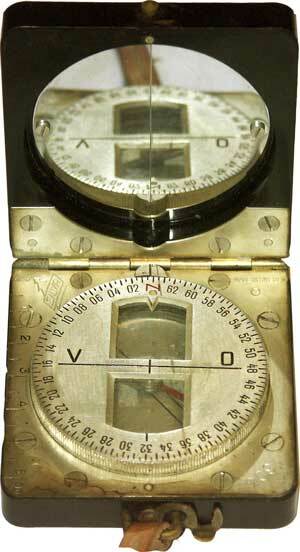 Absolutely unique design: the compass capsule is integrated in a case made of two sliding halves (for photograph click HERE). A civilian version (360°) in Russian was also produced probably under license in the USSR in the 1950's/60's. It was called TOURIST-2. 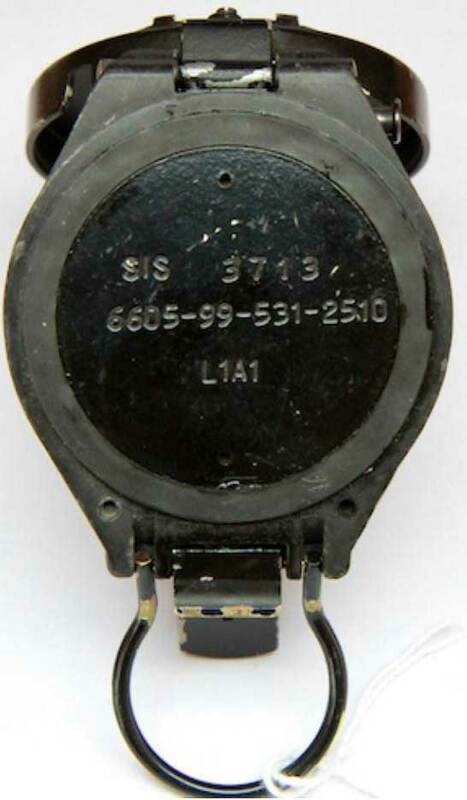 The manufacturer was московский опытный завод энергоприбор (Moscow Specialized Instruments Plant Energopribor. 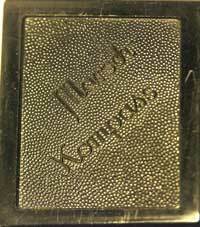 The price (3 roubles) was also indicated in the bakelite casing. 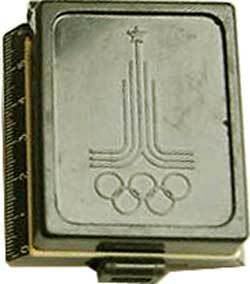 A modern version was produced in 1980 on the occasion of the Olympic Games in Moscow adorned with the Games' logo. 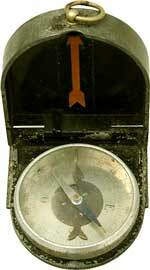 It was carried in a plastic box (click on link for pict.) featuring a wind of rose and the name of Moscow in Russian (MOCKBA). 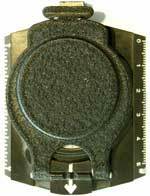 PROFILE - Former US manufacturer (L.I. city, New York) - For more information click HERE (momentarily no data available). Lensatic compass model M-1938 (see also Wrist compasses). 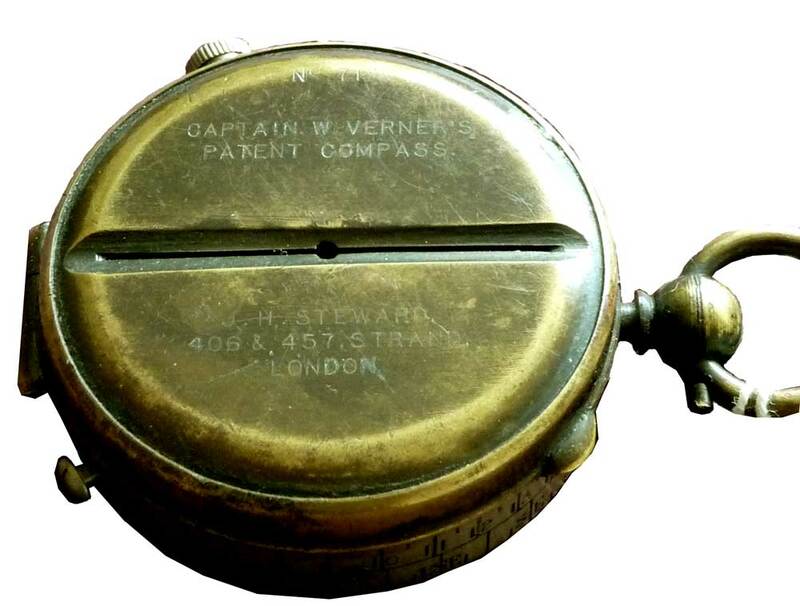 This Verner's pattern compass Mk IX 1941 was made by Granville Garnett Sutton from Cleveland, Ohio (1894-1953) and Caperton Braxton Horsley (1903-1988), U.S. makers of various equipment like a hand-held signal lamp among other things. 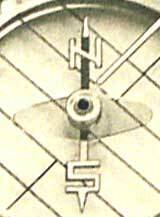 The company called Sutton-Horsley Co Ltd Aircraft equipment manufacturers was located in Toronto, between 1930 first in Jarvis, Esplanade Street 7 and from 1941 until 1943 in 263-267 Adelaide West, Garden City Press Building. This company was in fact maybe only a retailer. 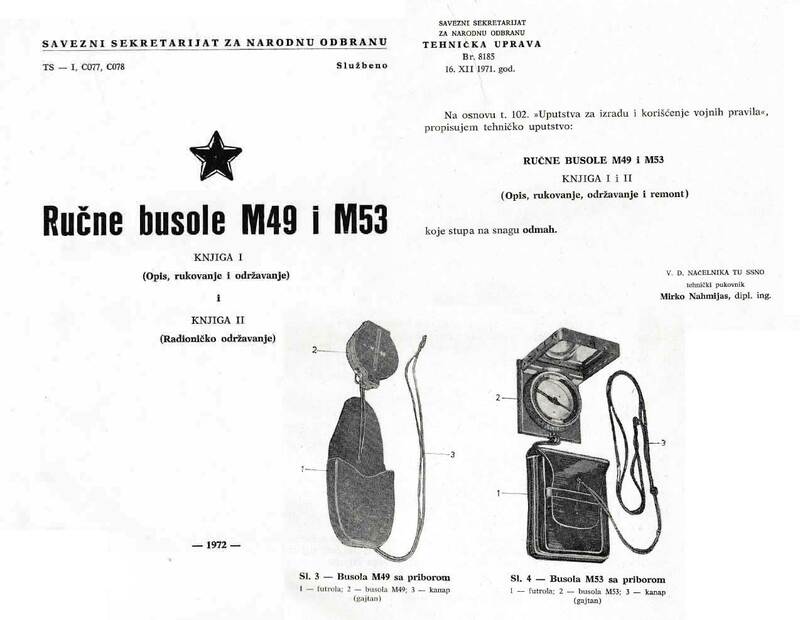 PROFILE - Former Yugoslavian Company. Its logo was the letter T in a triangle (see picture below). For more information click HERE. 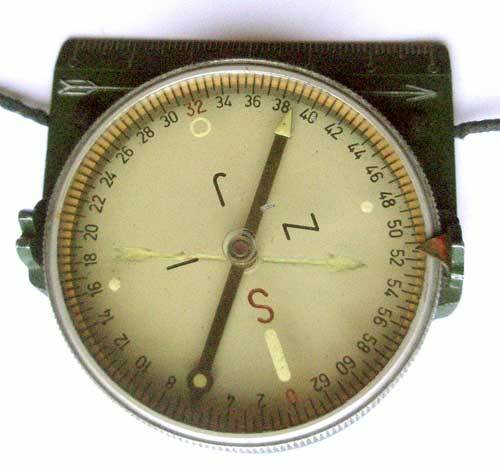 The People's Army of Yugoslavia first utilised compass models taken from the German Prisoners of War (PoW). 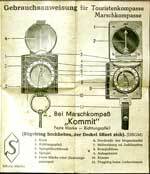 Later on, Teleoptik developed own models. 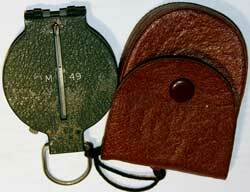 Their designation indicate the year they have been issued: 1949 for model M.49 and 1953 for model M-53. 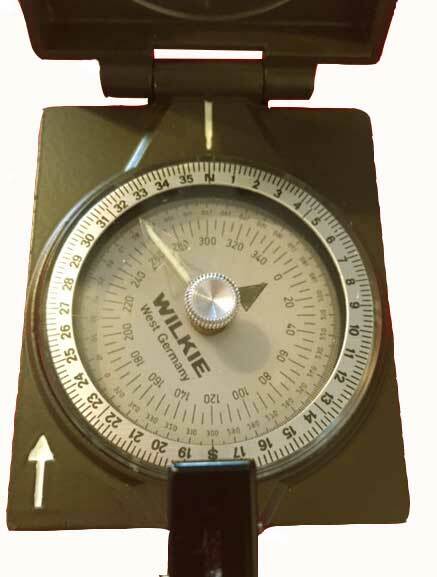 Distance measuring by means of the scales in MILS in the lid (Mesni ugao): the distance between eye and compass must be 50cm (20 in.) 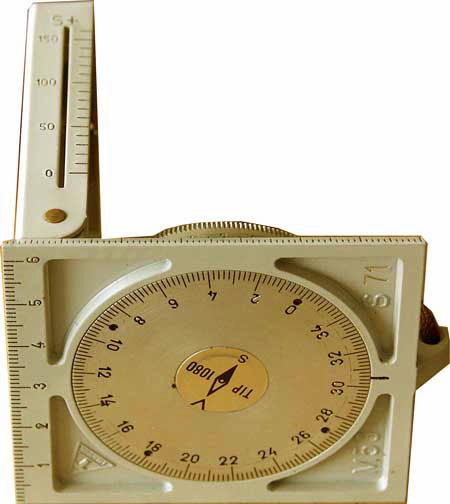 for the right-hand scale and 25cm (10 in.) for the left-hand scale. 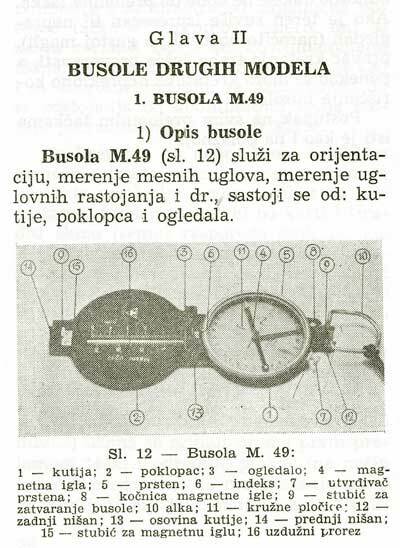 At right: description published in the 1969 Yugoslavia's army training manual. 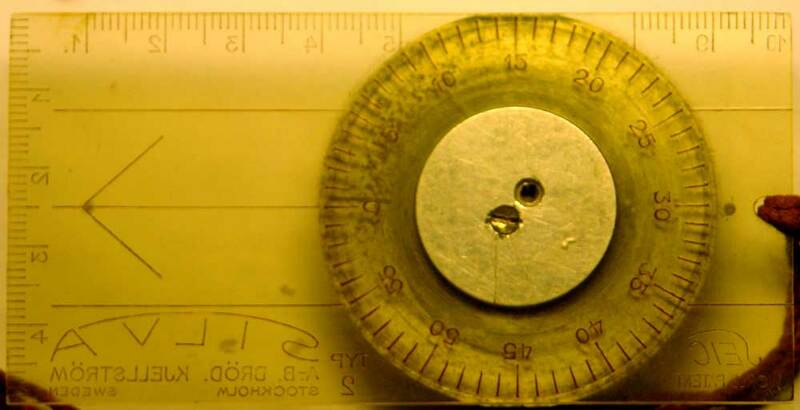 The capsule's ring is graduated in mils (6400) and the measured angle can be read at the underside in degrees. 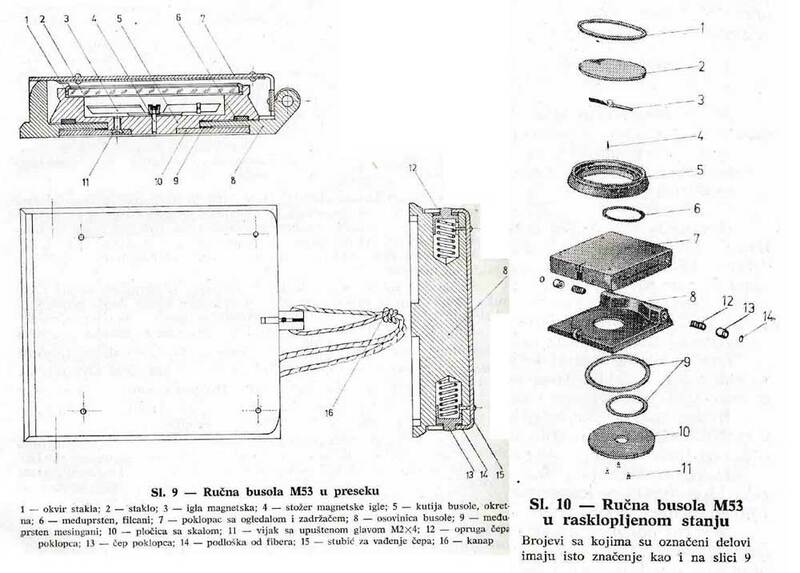 Three-side-view and parts as published in the 1972 maintenance manual. 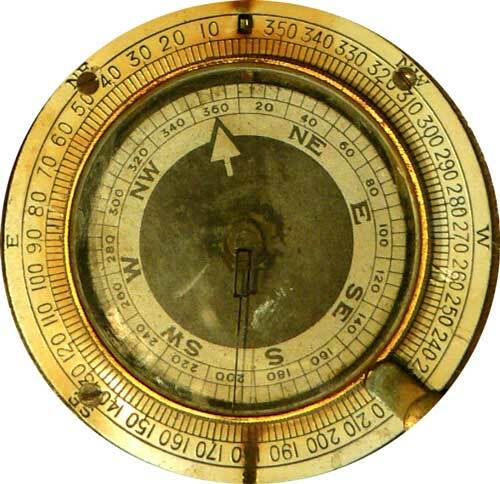 Interesting compass built according to some principles of the Bézard. 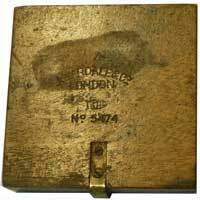 Both sides of the base plate show divisions in millimeters but no graduation. 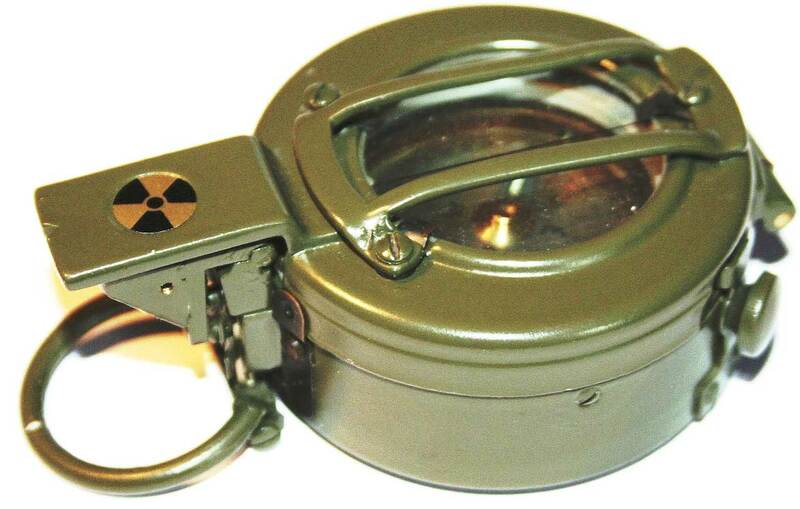 The lid has a short slot, in-line with the mirror’s sightline, and two luminous dots. 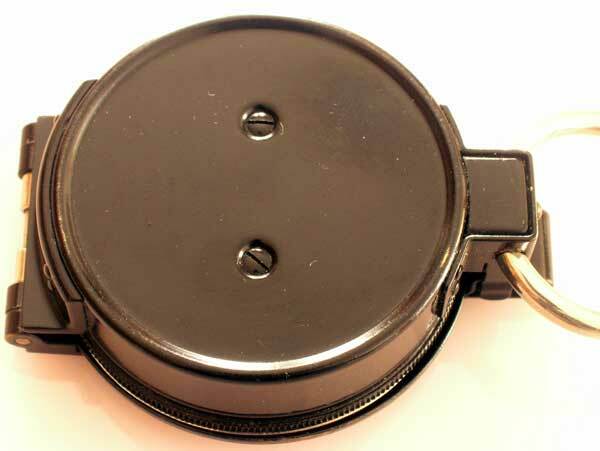 The lanyard attachment ring also has a slot corresponding to the sightline and a luminous dot at its rear side, only visible in the mirror. 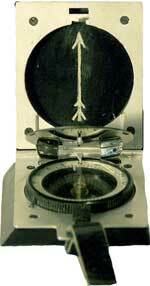 The mirror’s sight line upper end is terminated by a triangular luminous arrow. Profile - T.G. 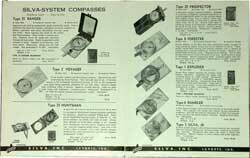 Co. Ltd. was the abbreviation used by The Gramophone Company. 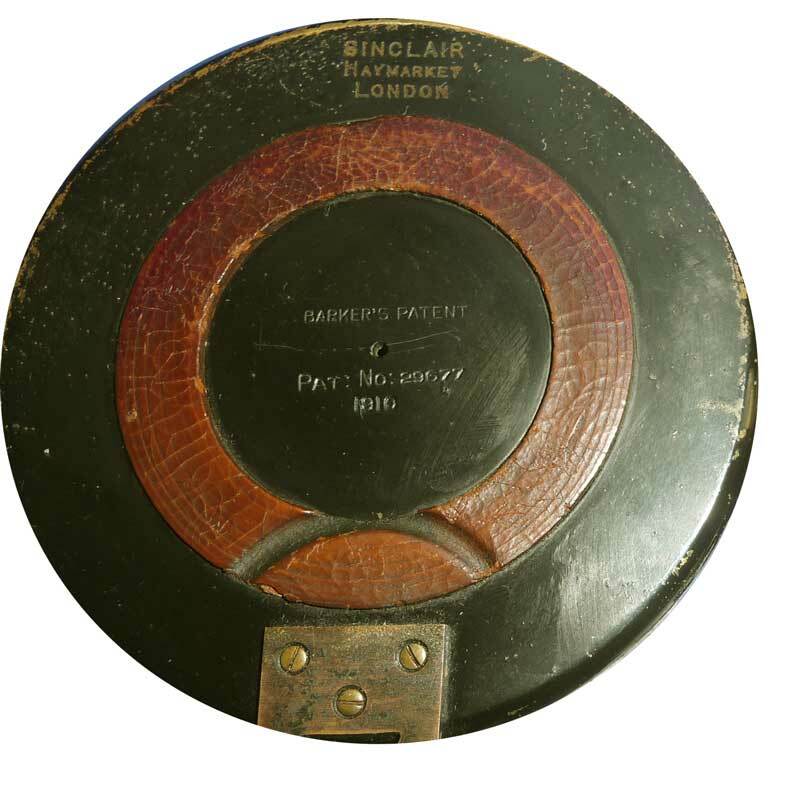 This firm merged with its subsidiary His Master's Voice (2/3) and with Columbia Graphophone Co. (1/3) in 1931 to become EMI (Electric & Musical Industries) who continued to use “The Gramophone Co.” trademark for various items, changing it for the War contracts to just T.G. Co. Ltd. 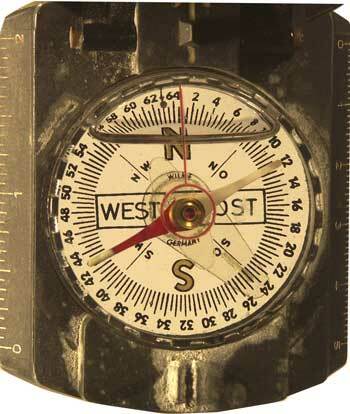 In reality, F. Barker & Son apparently built these compasses since they all carry the B prefix to the serial number. T. G. Co. disappeared as soon as WW2 finished. 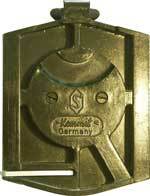 This company name was probably used to keep secret the manufacturer's real identity. 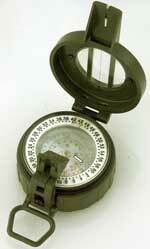 The letter 'B' in the serial number means that this compass was in reality produced by F. BARKER & Son. Reproduction currently made in India. 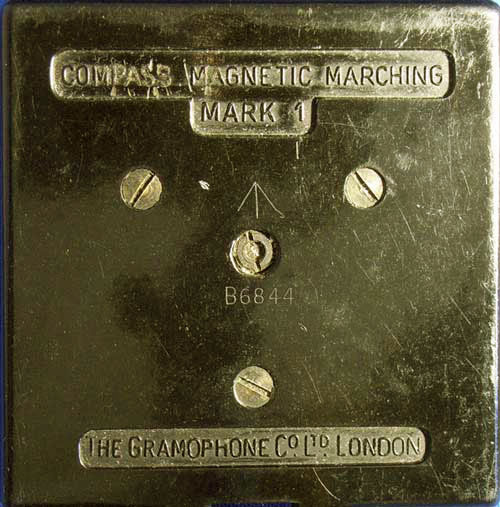 Two different versions were produced: the quite rare and probably early one bore the full name "The Gramophone Company" (no. B6844). The more common and later one only bore the abbreviation. 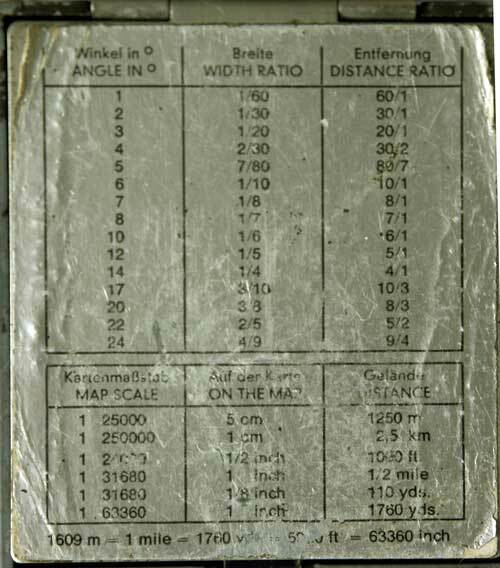 The users instructions were printed on a small square of paper the size of the mirror (copy available). SILVA'S co-founder and inventor Gunnar TILLANDER filed several patents for light-weight compasses especially for orienteering but also for Aeronautical compasses. 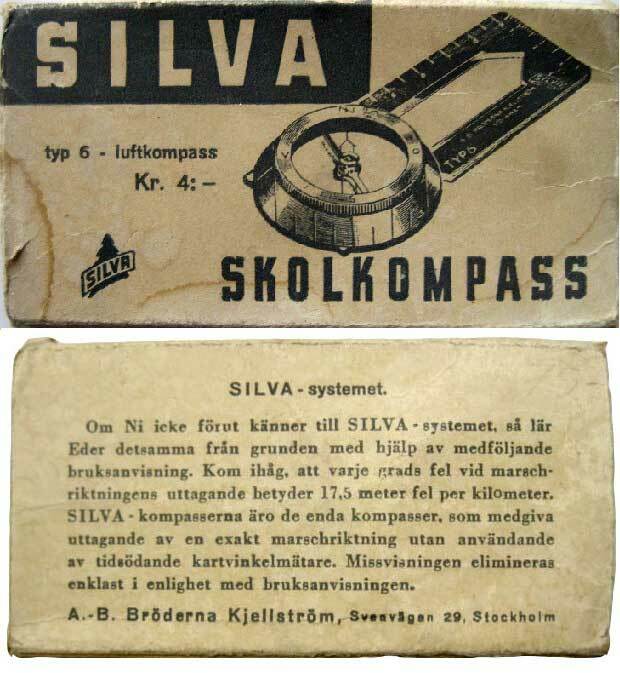 Of the oldest one (together with R. Ekkeberg) describing SILVA's first model (see above) featuring a capsule with two windows for N and S we know the French version (no. 782.576, 1935). Another patent (no. 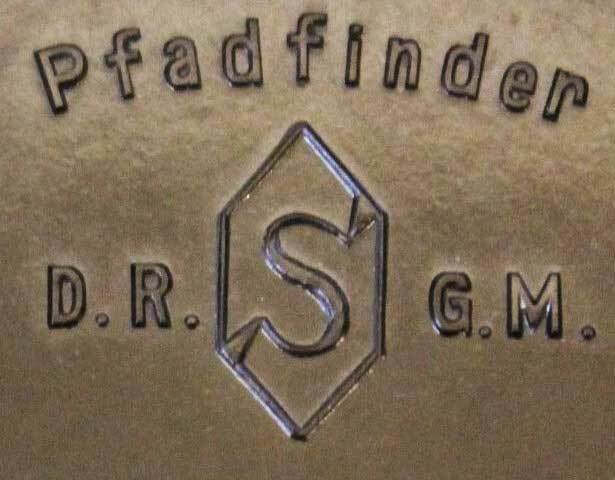 74113) relates to the compass made by Freiberger Präzisionsmechanik (FPM) in the German Democratic Republic (GDR) in several versions. 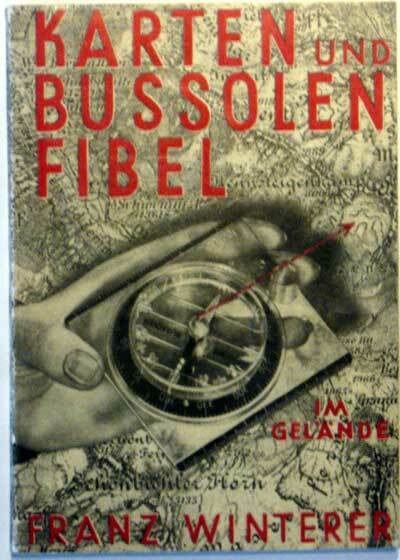 A West German version (FRG) is also available. 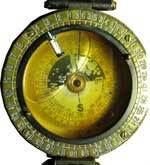 PROFILE - This instrument was made by Meiser & Mertig in 1924 (engraved on rear face on top of the cities list). It is probably not connected to the motorcycles of the same name. 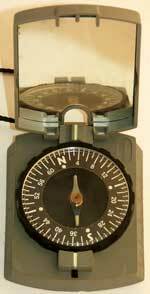 The compass face features typical Bézard characteristics like the east-west stripe and the disk-shaped south end of the needle. 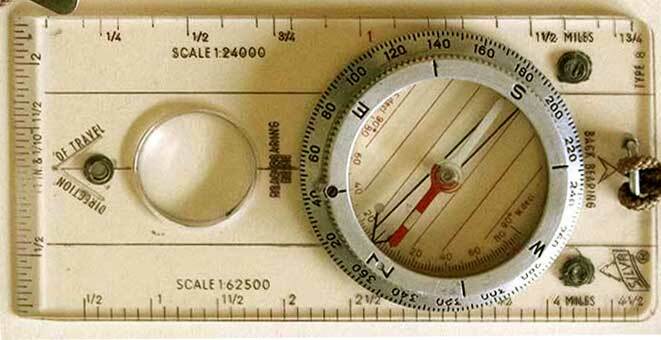 Only the cross at the northern end and the very unusual quadrants are unique: numbered every 15 degrees except for 0 and 45 where the cardinals are printed while the zero marker is facing each cardinal! 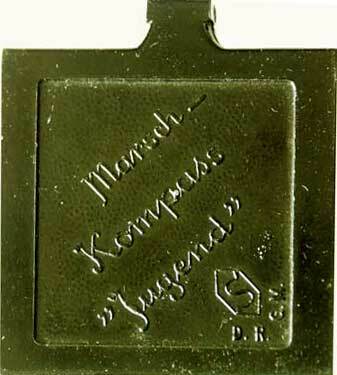 The word Marsch-Richtung on the ruler in the middle of an arrow is also a hint at Bézard. 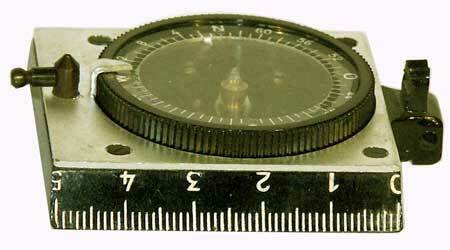 The bezel is secured to the case by means of a piece of wire lying in the respective grooves. 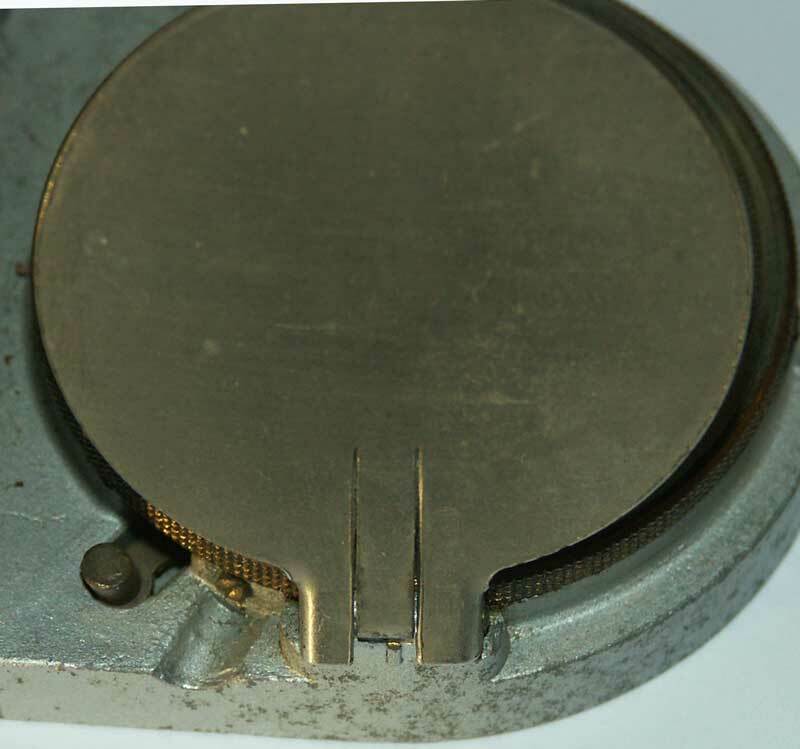 It is to be pushed into a tiny hole (located on the right-hand side of the ruler hinge - see the picture in the top right corner of the view of the dismantled instrument) and is self-locking in a slot (left of the hinge). 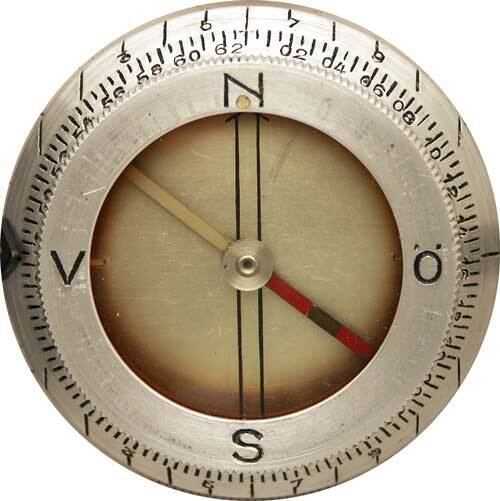 As far as we know, this system is only to be found on the OPTOS compass. 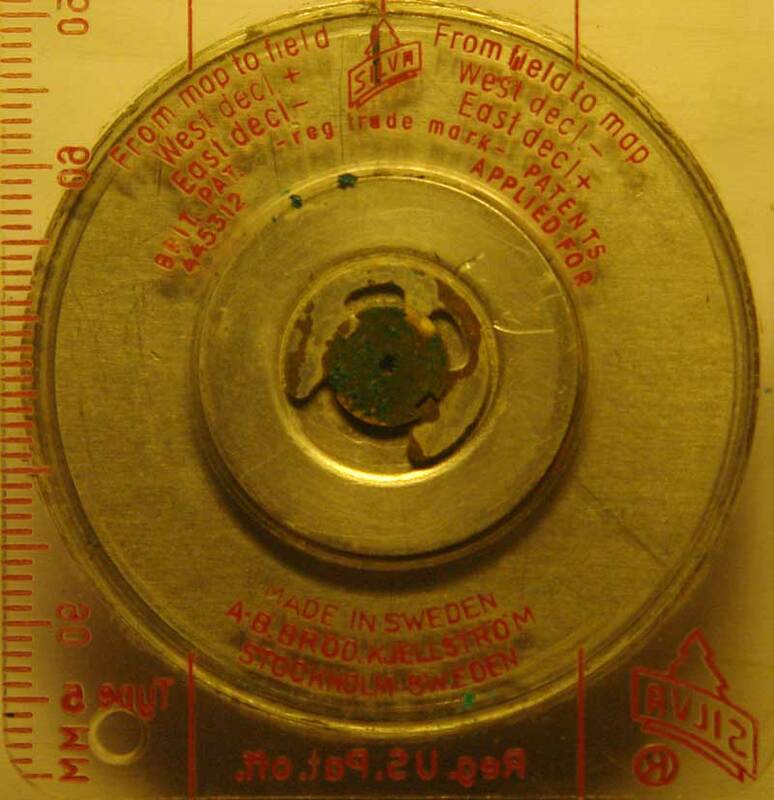 A highly reflecting film of waffled aluminum is placed on the bottom of the capsule. 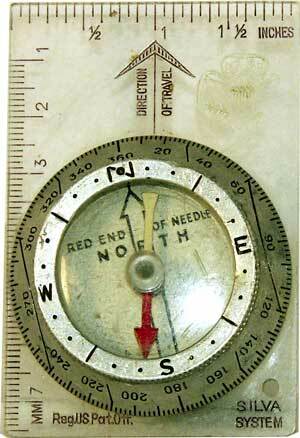 The luminous markings on the needle (cross and disk) and under the glass (disk on the SOUTH side!) consist of Balmain paper. 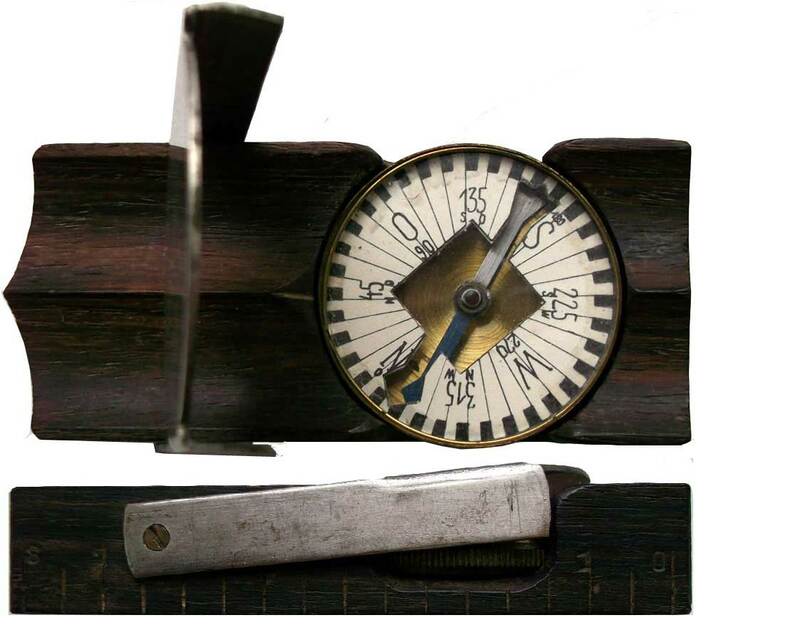 Transit lock: the needle is pushed upwards when the calipers holder is swung back in place (see photo of mechanism HERE). Rear face: ruler folded with stowed divider. 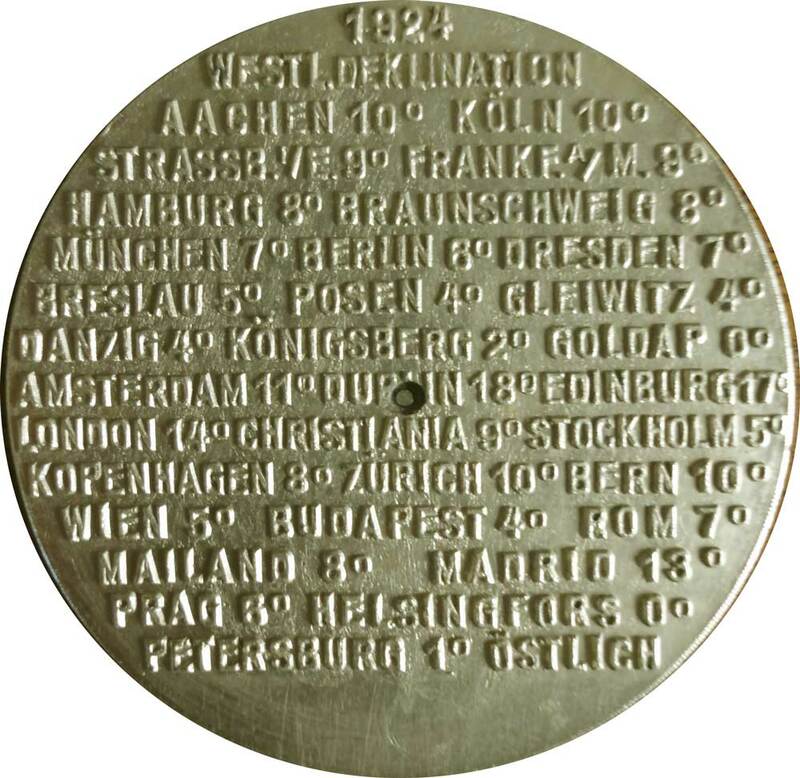 For a view of the cities' list with their west magn. 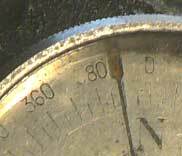 declination starting with 0° in Goldap at the easternmost limit of East-Prussia (now Poland) click HERE. 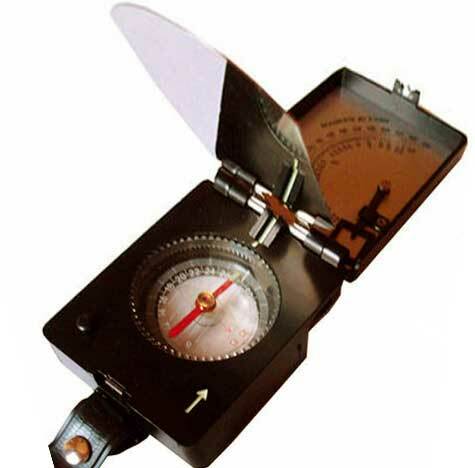 - The hollow folding ruler is 74mm long with the removable divider stowed (70mm when the divider is removed); divider caliper: 47 x 10 x 2mm. 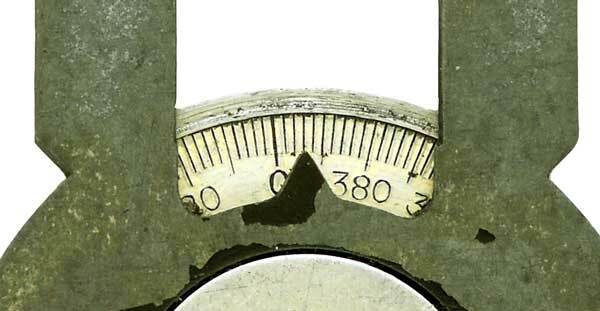 The ruler is graduated up to 50mm and features map scales from 1:50,000 to 1:400,000 on one side (left column - pic. 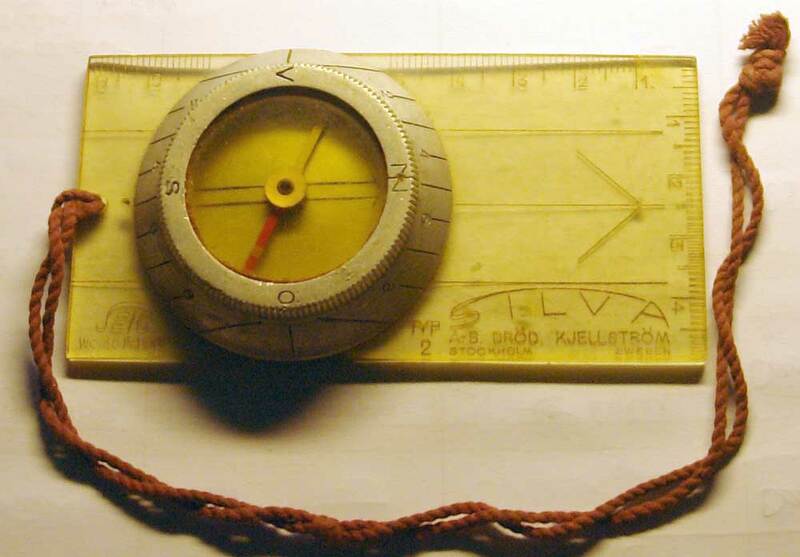 at left) and the corresponding line representing a certain distance in km (right column). Further scales on the sides: 1:25,000 and 1:40,000. 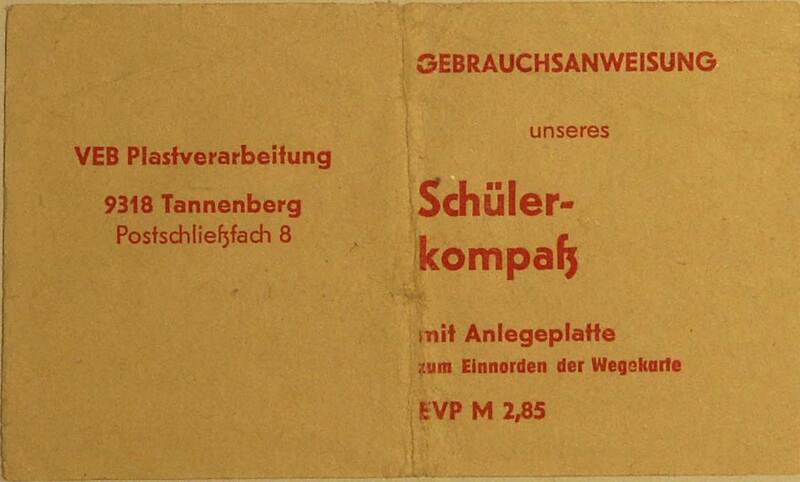 PROFILE - The company VEB* Plastverarbeitung (plastic materials) was an East-German manufacturer located in Tannenberg (Saxonny). This " schoolboy's compass " (Schülerkompass) was stuck in a basis plate but could be separated and carried like a pocket compass. 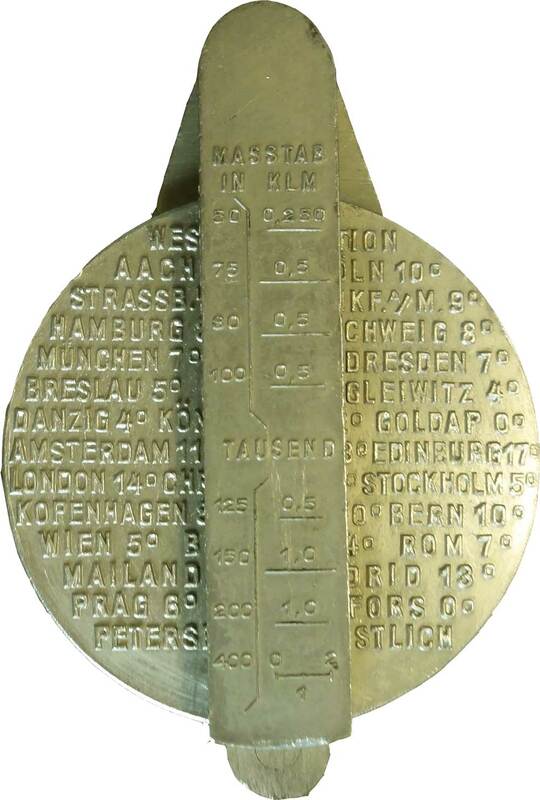 Its price is only indicated in "Mark" (2,85 M), which means it was maybe the successor of PLATIN (see the identical pocket compass with a price in Deutsche Mark, DM) after the "Wall" (Iron Curtain) was erected. PROFILE - William Willoughby Cole Verner was born in 1852 and died Jan. 25, 1922 (for more information about his military career click HERE). 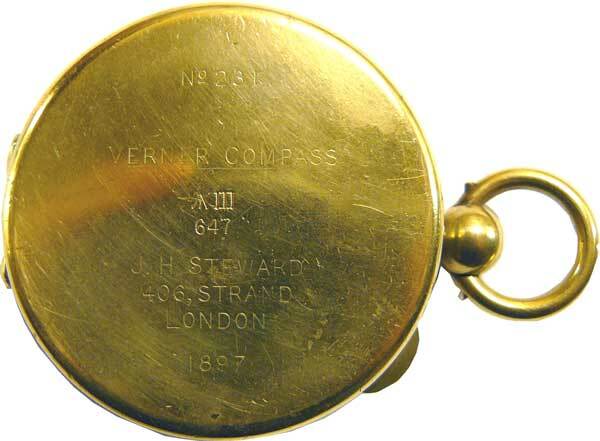 A certain type of British compass is called Verner's pattern after its designer's name, W. Verner. The various instruments known of are marked Mark III to VIII (see exemples in the compasscollector.com). 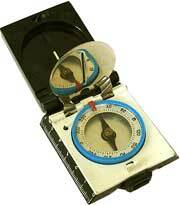 However, the well-known dry-card prismatic Service Compass (see pic. at r.) was designed a few years after he published his famous book Some Notes on Military Topography in 1891 (see menue Miscell. 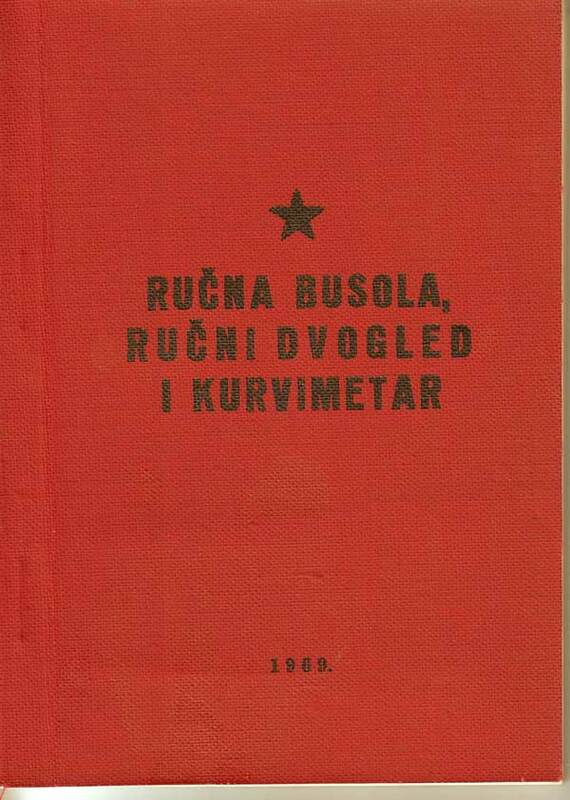 / History & Bibliogr.) 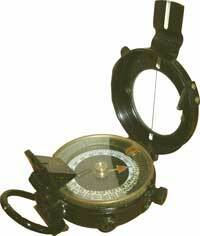 in which he condems the then generally used large prismatic Schmalcalder-type compass and advocates instead the use of a small plane table and a pocket compass (link to pic.) for drawing military situation sketches. 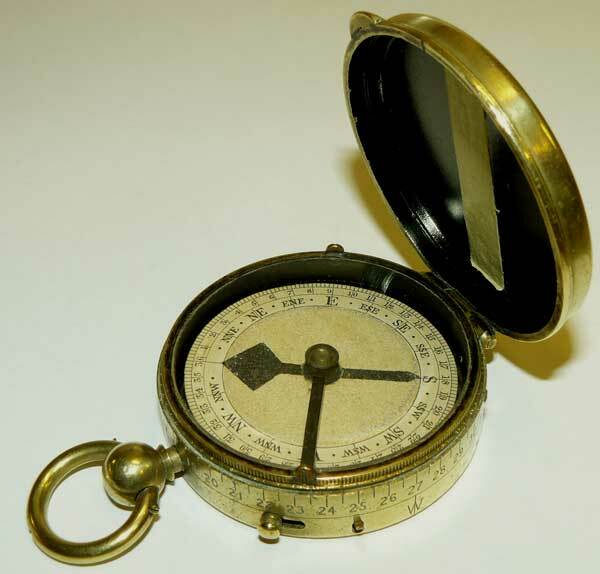 The earliest Verner-signed compass (Mark III, 1887) was a simple pocket compass (see Steward). 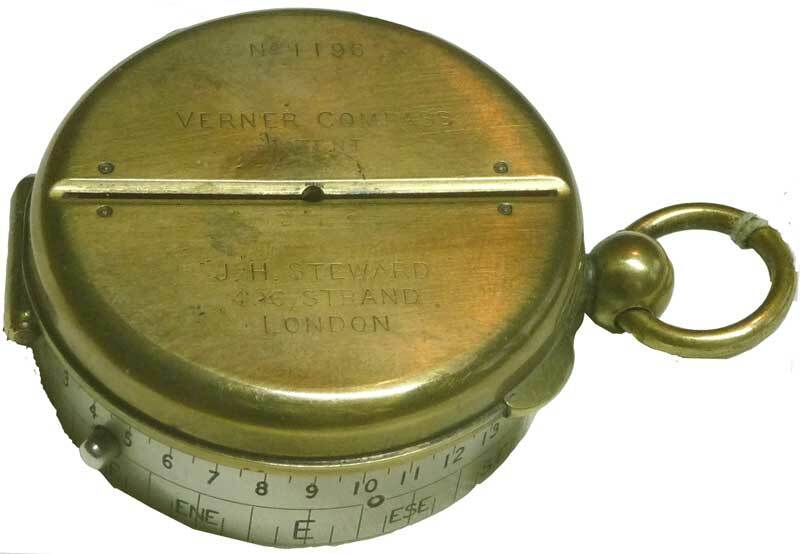 The true Verner's Pattern compass is primarily a down-sized survey compass in a hunter case. 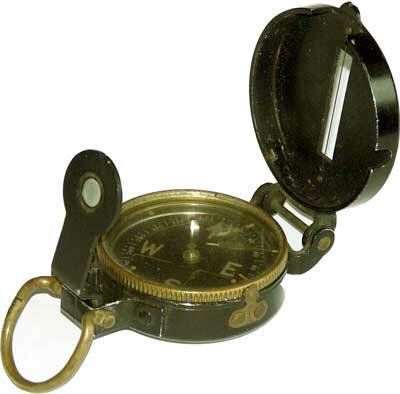 It is based on Charles Augustus Schmalcalder's patent (1812) where the front sighting vane was replaced by a thin line etched in a glass window inserted in the hinged lid. 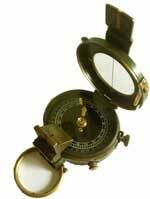 The early developments are thoroughly described in the website compasscollector.com. See also pictures of compasses bearing his consecutive military ranks in the table below. 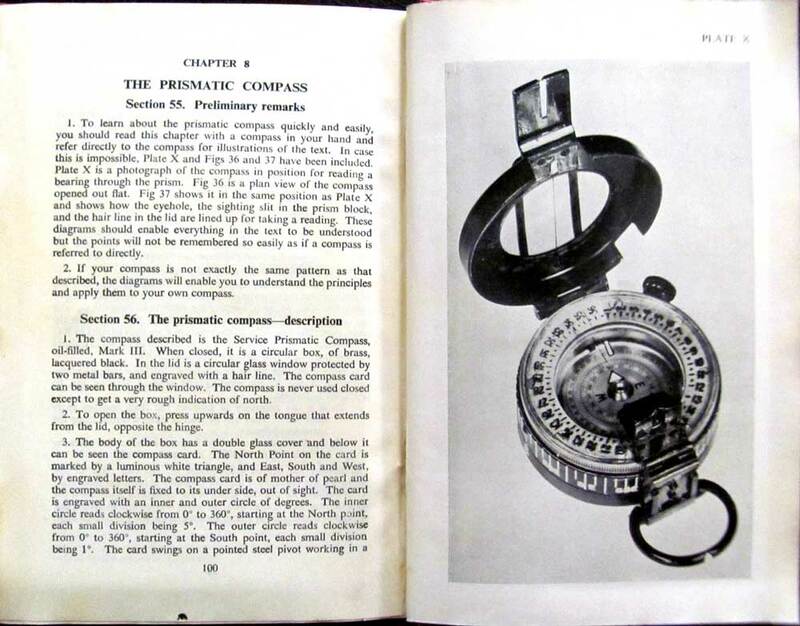 The first Verner's Pattern compasses were signed by J. H. Steward and some featured a Singer's patent black and white card. 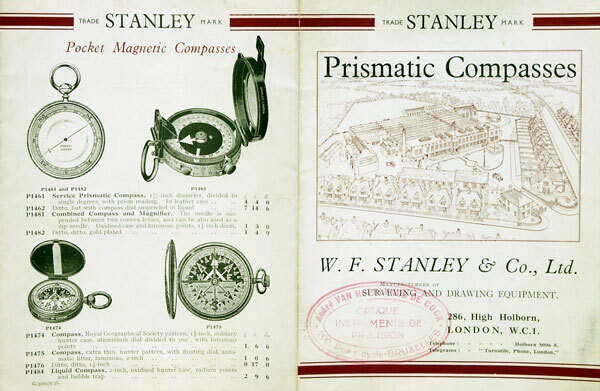 The most common later items (Mk VII and Mk VIII utilized during the first World War) are all prismatic compasses. 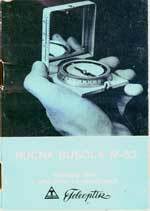 The instrument is described in the 1929 issue of the War Office's Manual of Map Reading, Photo Reading and Field Sketching (see menue Miscell. / History & Bibliogr.). 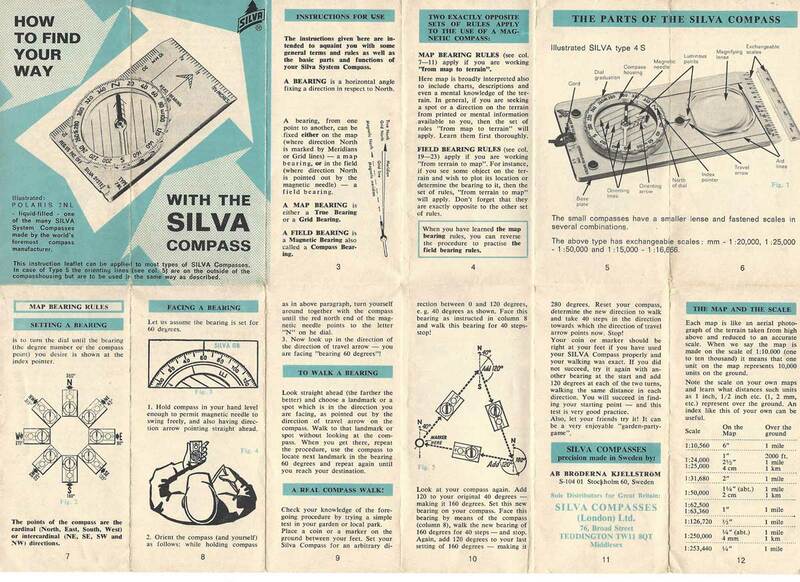 A fac simile of the original short User Instructions can be ordered (click HERE to see a photograph of page one). 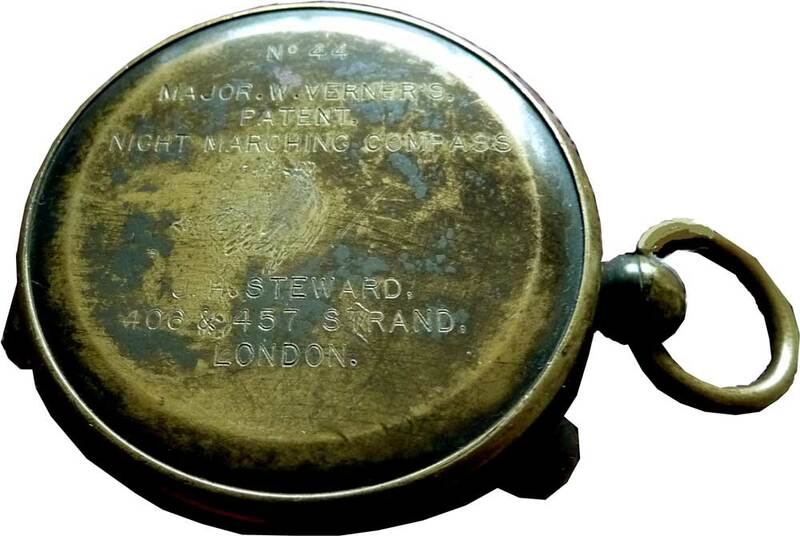 The ultimate version was a Mk IX but it was no longer engraved VERNER'S PATTERN and was immediately replaced by the technologically further developed prismatic liquid-dampened Mk III built by F. Barker & Son. 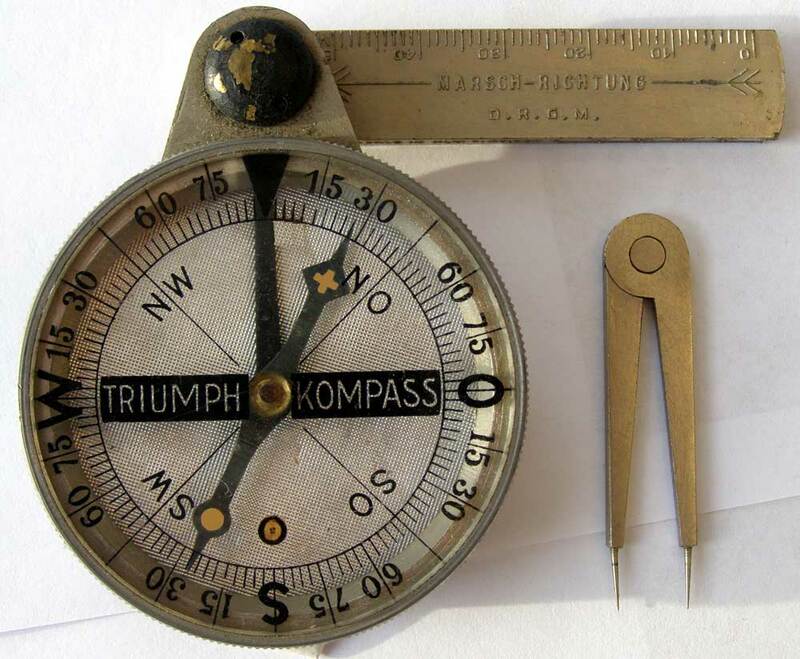 Several compasses without prism are known on which his various military ranks are engraved (from left to right below: no rank, Captain, Major, Lt.-Col.). 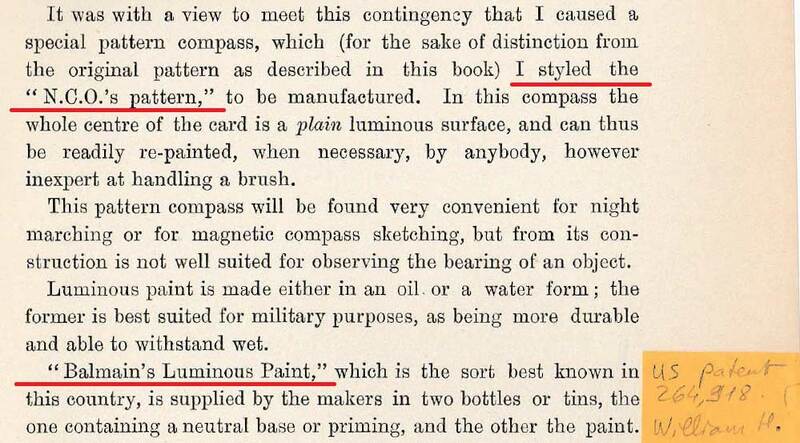 The luminous surfaces are made of Willesden paper coated with Balmain's luminous paint (U.S.Patent no. 264,918 issued in 1882). This version is the last avatar of the VERNER family. 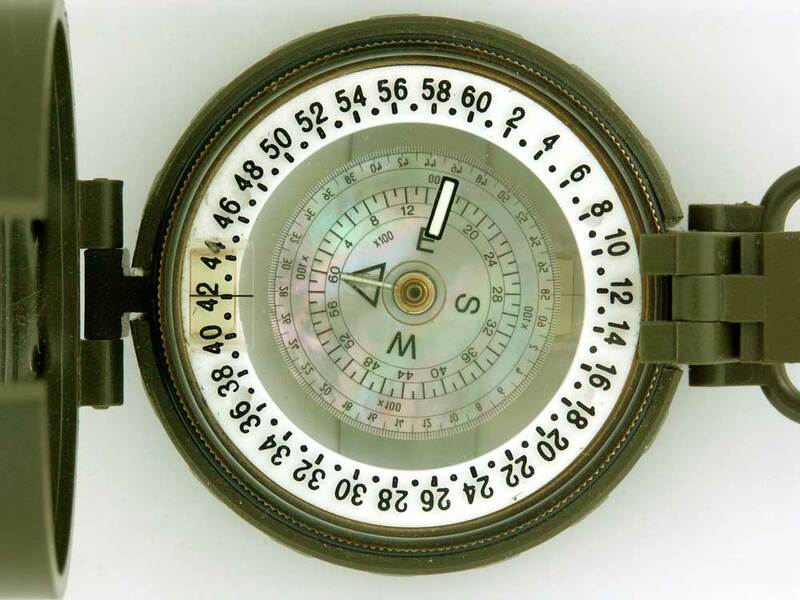 It constitutes an attempt during WW2 to take a share of the market conquered by the new fluid-dampened Mk III by imitating one of its features, the chapter ring. The technical solution was half-hearted though since non rotatable. 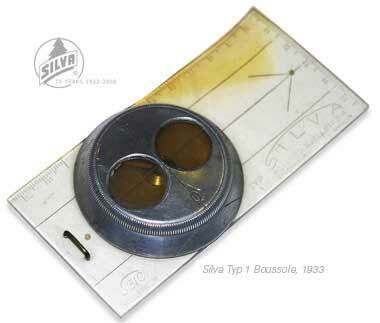 This transparent ring was graduated with a round hole at the place of the zero located under the prism. 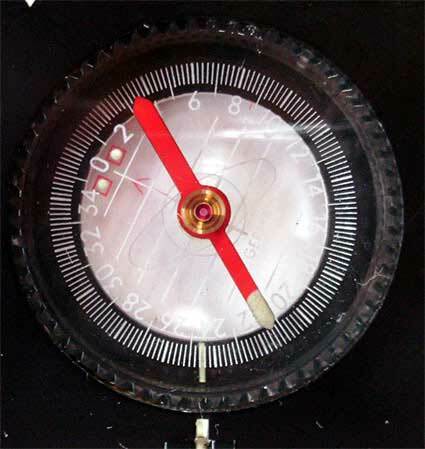 The compass disc's rim was also transparent like on the MORDAN system (mica). 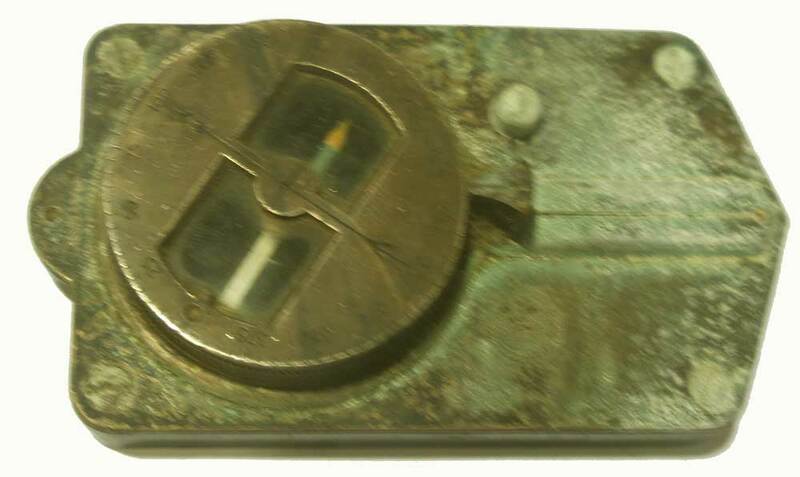 A small quantity of Radium-compound paint located in the case under the prism illuminated the figures. It was certainly cheaper and lighter but the disc would need more time to settle than the fluid-dampened Mk III. PROFILE - Verner's pattern compass with an unsolved engraving. 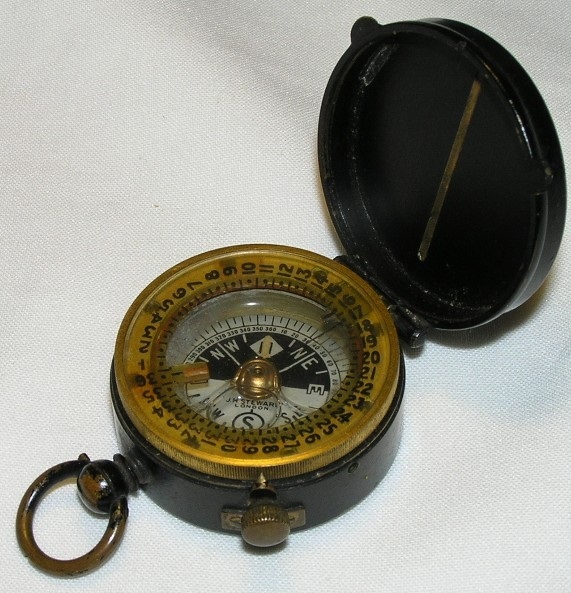 Thank you for helping us find out the country of origin and the manufacturer. 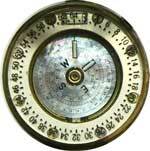 The common Verner's pattern compasses feature a mother-of-pearl disk. This one is "negative" with white figures and markings on a black face. The card's material is unknown. 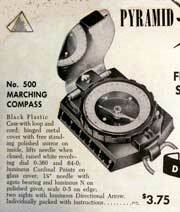 Note: The website compasscollector.com cites black-face Verner compasses signed 'MIO'. 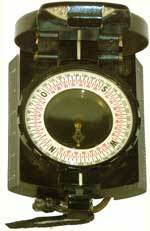 The Mk IX displayed hereafter is a Verner's pattern Mk IX compass. 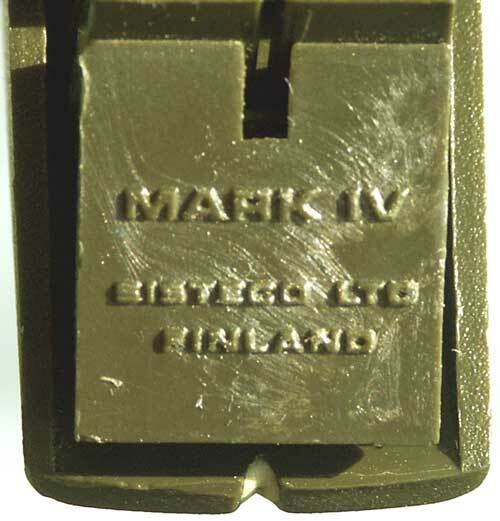 The Mk IX was identical to the Mk VIII but was not engraved with the inventor's name because the patent protection had already ended. 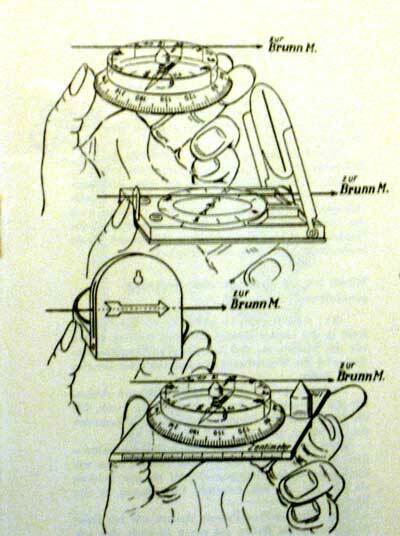 Compasses issued to German soldiers between 1933 and 1945 are displayed in the chapters Breithaupt, BUSCH, MK, Zeiss Ikon, etc. 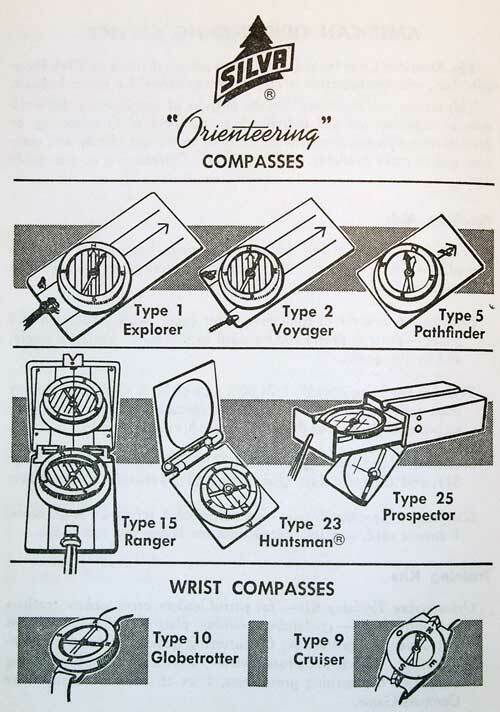 See also the section Survey and Artillery compasses (Breithaupt, Goerz, Zeiss, "X" (unknown manufacturer). 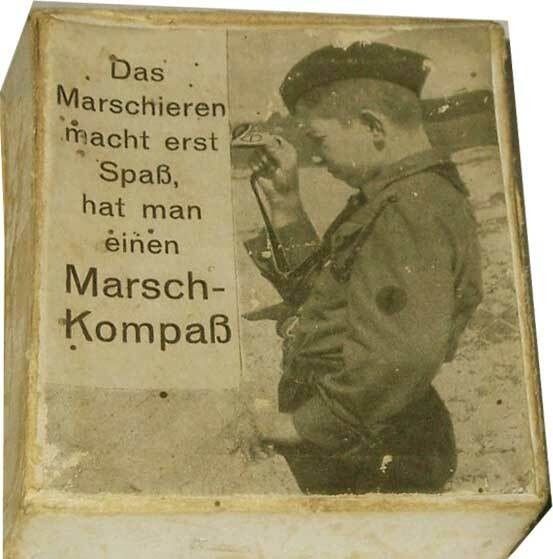 The German word Wehrsport designates paramilitary exercices (orienteering, shooting, fighting etc.) 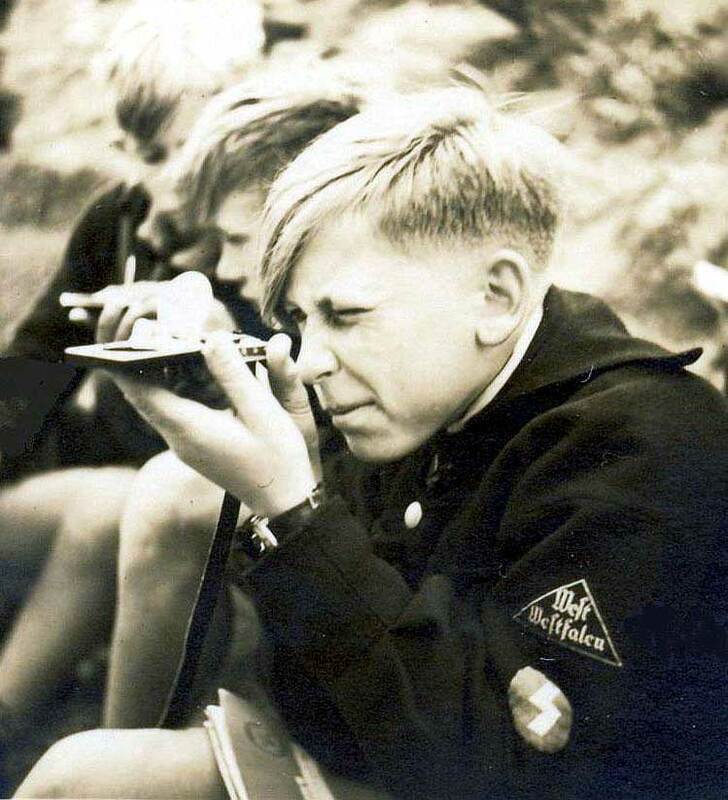 for youth organisations in Nazi-Germany like the Hitler-Jugend. 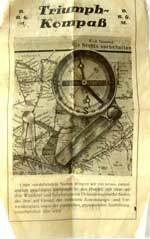 A series of 13 specific documents called WEHRSPORTTAFELN (link to list) existed explaining how to use various tools for orienteering tasks like the compass (no. 8 "Orientierung", see BUSCH compasses) and the square protractor or Romer scale (no. 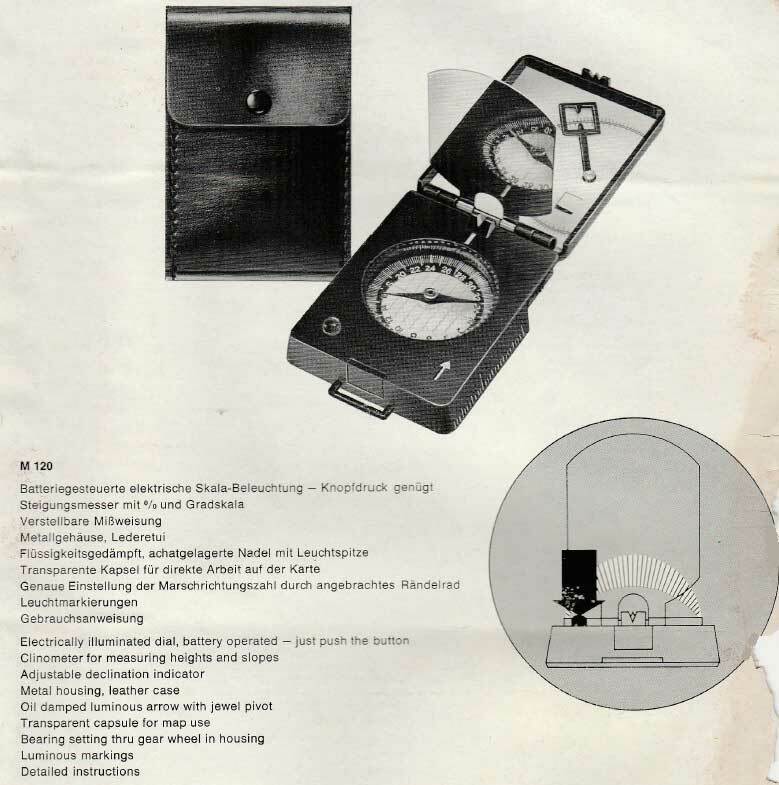 12 "Planzeiger" - photocopies avlbl. in our SHOP). 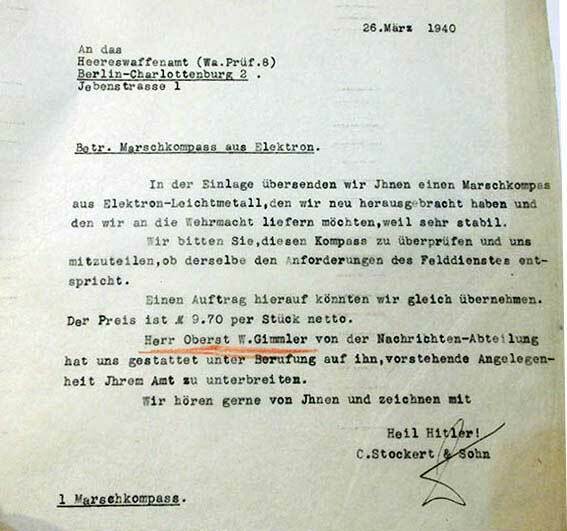 In communist East-Germany (GDR), the official org. was called GST (Gesellschaft für Sport und Technik). Read more info about it in the German Wikipedia. 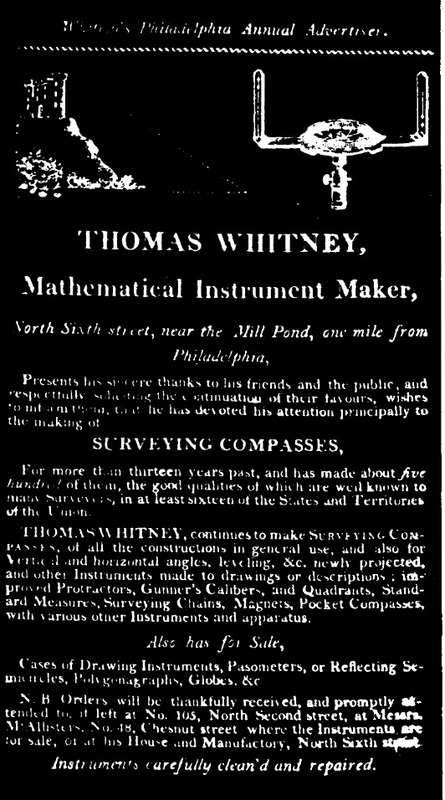 Thomas Whitney was a British instrument maker who emigrated to Philadelphia, PA. U.S.A. before 1798 (several addresses are known). 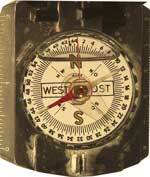 He made the compasses used by Lewis and Clark during their expedition from Saint Louis to the Pacific Coast from 1804 to 1806 (link to Wikipedia). The National Museum of American History (NMAH) claims that the (pocket surveying !) compass that they display was probably carried on the Lewis and Clark Expedition. 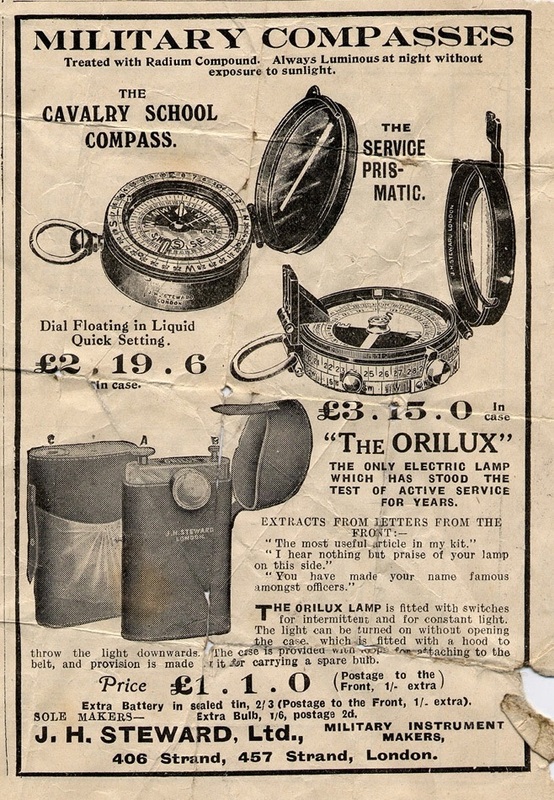 In a very comprehensive study it is said that "... in addition to a plain surveying compass with ball and socket joint (see ad below) Lewis purchased one silver-coated [pocket compass] and three others of brass." This relates probably to the chapter ring and not the case. The only ones we know of feature a wooden case. The large one of the NMAH features two short sighting vanes placed slightly off axis. Whitney also signed a smaller version without vanes. - Dim. : 3 ½" x 3 ½" x 1 ½ " (approx. 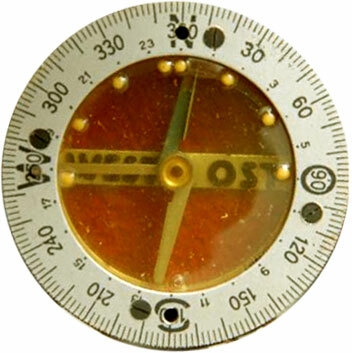 90x90mm). 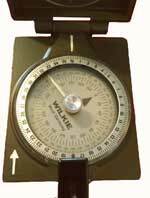 The model without vanes is probably smaller by one inch. 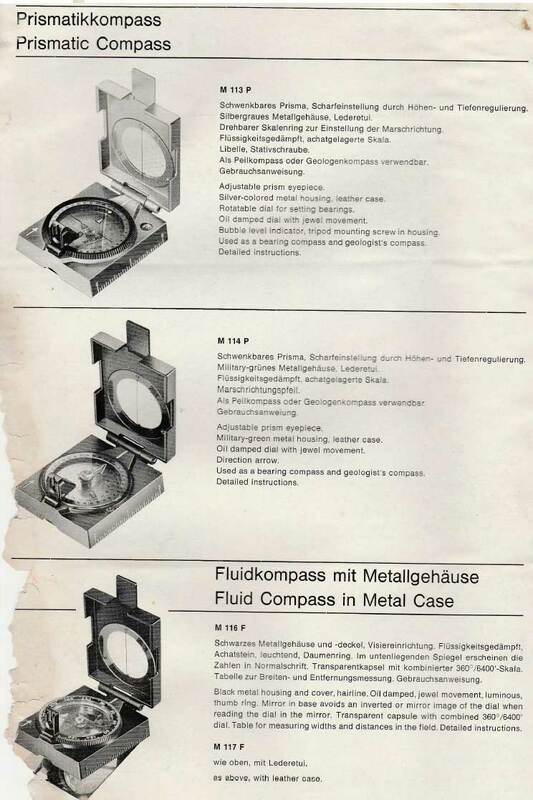 In the 1960's, there was a tight cooperation with the other two compass manufacturers located in the vicinity (cities of Fürth und Nürnberg) and the catalogues of C. Stockert, PASTO and Wilkie were similar concerning form and content. 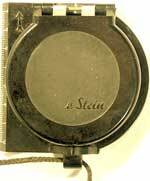 The system featuring a hanging mirror was patented in 1914 by Emil Perman. 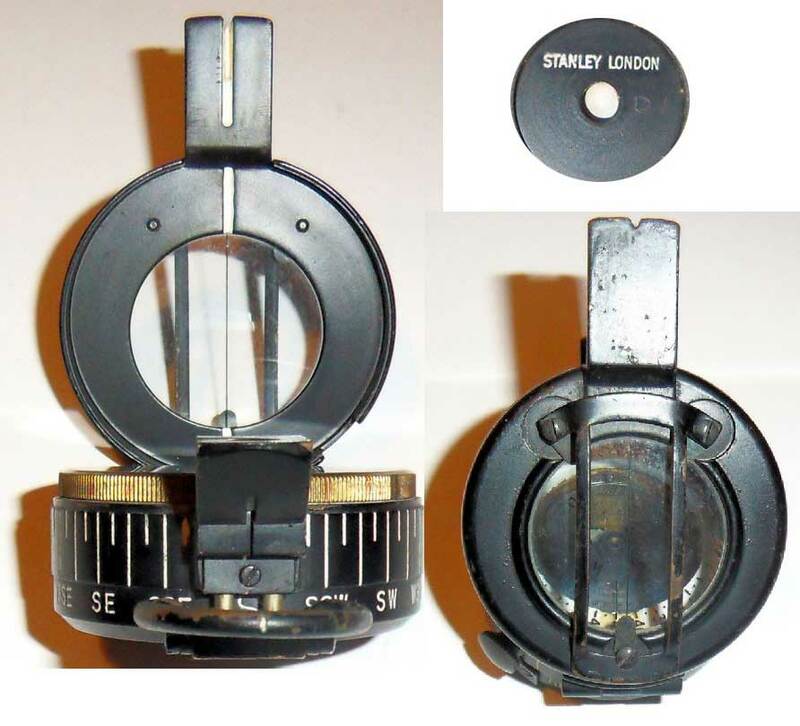 The swivelling aft sight is identical to the prism fitting of the model PASTO 206 S and at the lowest point of the circular opening in the lid is a tiny triangle (fore sighting aid) (click HERE for picure of sighting). Img at r. : Plain version w/o mirror and rotatable scale This model doesn't appear in any of the catalogues known and can as well have been designed and made by PASTO. 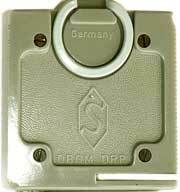 It was propably an aborted project for the German Army (Bundeswehr, Bw) created in 1956. 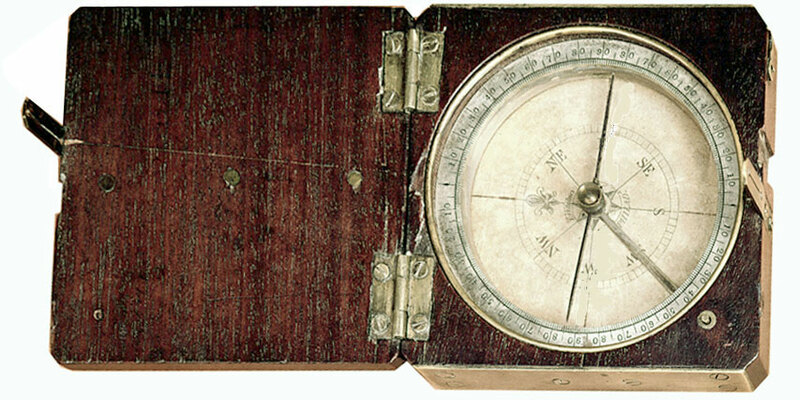 The tiny arrow on the case's left upper face is also on the Bw compasses made by Askania und Breithaupt (CONAT). 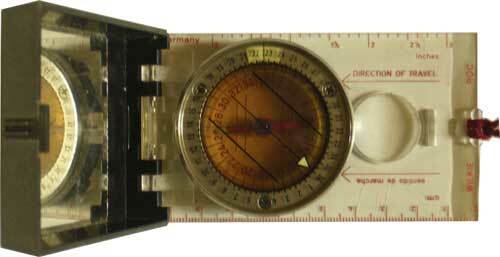 It is neither a lensatic nor a prismatic compass like the common items used by the U.S. Army (s. Stocker and Yale, Cammenga etc.) or the British Army (s. Barker, Stanley). Click on image above for descr. in Engl. 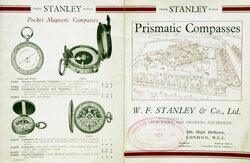 and on image below for a view of all prismatic models in the 1975 catalogue. - Mirror: swinging downwards and automatically locking when deployed by 45°. 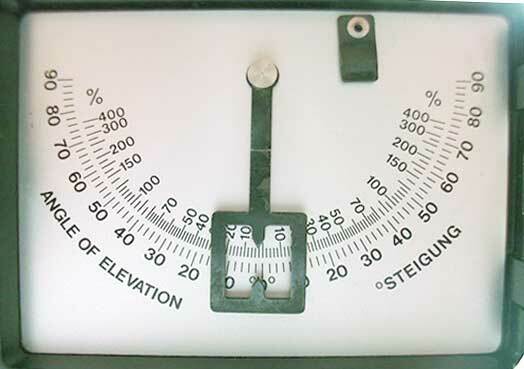 On the rearside is a sticker featuring a table with, for a value in degrees, the corresponding width or distance of an object (ratio) and also a map measuring information (scales) (for picture click HERE ). Click on image above for full descr. in Engl. 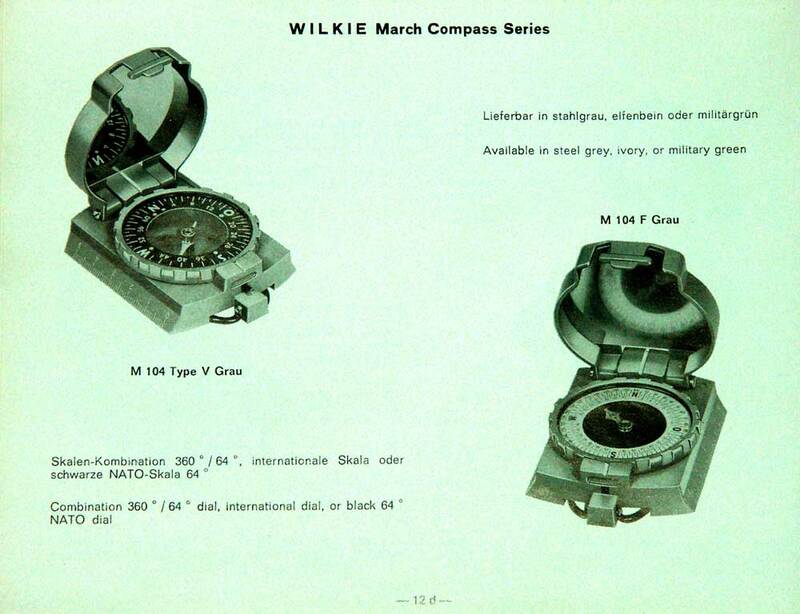 Model with grey case and only 6400 MILS divisions designated M 104 V in the 1968 catalogue but with a rectangular lid bearing WILKIE's logo (NATO rose of winds) and the abbr. DBGM on back side. User instruction in three languages (D / E / F). Early 1960's. Model M 105 F black (German catalog #). 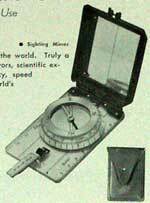 The export model with a flat lid-mirror catalog # was 500 (pic. at right, click on img. 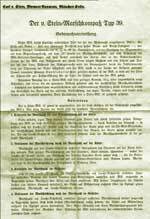 for full view of ad). 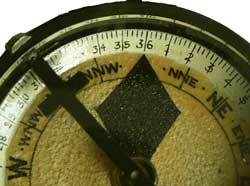 The magnetic needle looking as if only made of its northern half is in fact a blank part of a black disk. This design is also to be found on a light artillery compass without manufacturer name and on Wilkie's lapel compasses. 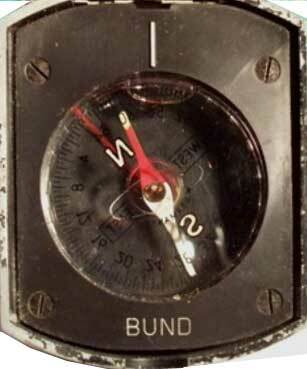 On the case of the German Army's models appears the word BUND (short for Bundeswehr). For picture click HERE. 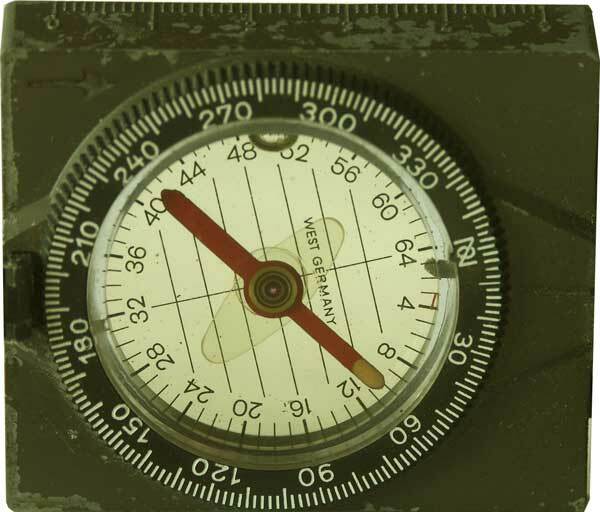 Here are the WILKIE's typical stabilisation winglets and the course setting tab at the underside well visible. 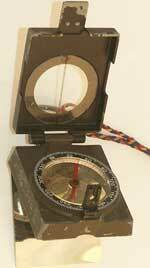 This model with slope measuring device was a predecessor of the WILKIE MERIDIAN (Pro) survey compass. 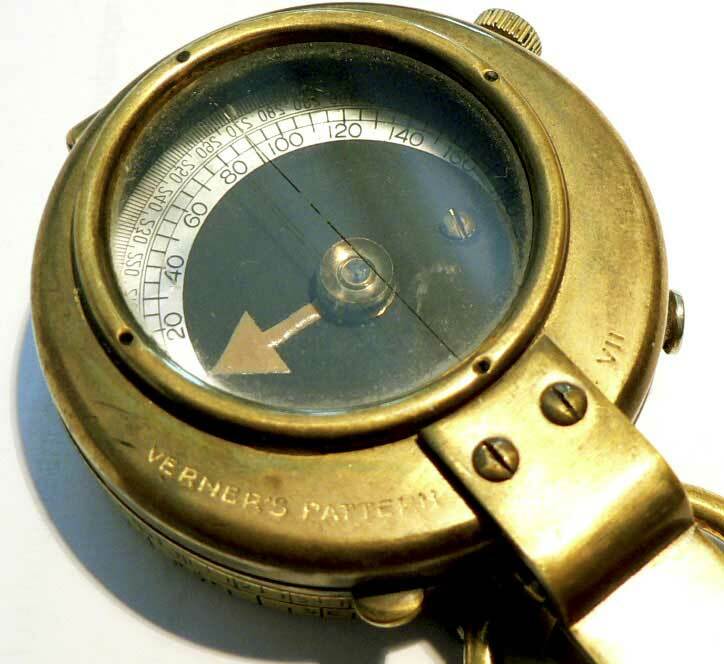 The illumination of the capsule is adjusted by means of a serrated wheel on the side (compare to the Eschenbach electronic compass). 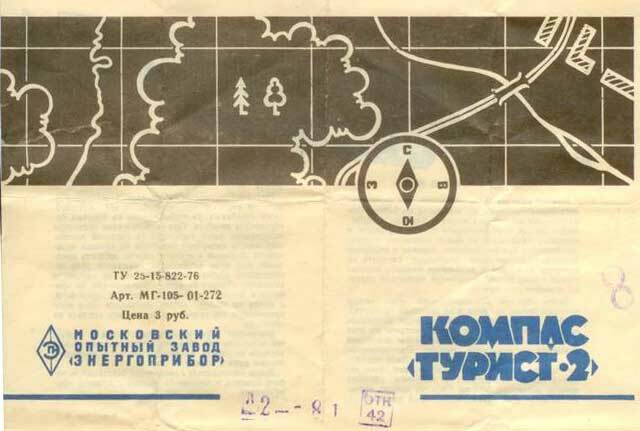 The design was registered in 1972 by PASTO (DBGM Nr. 7243598). 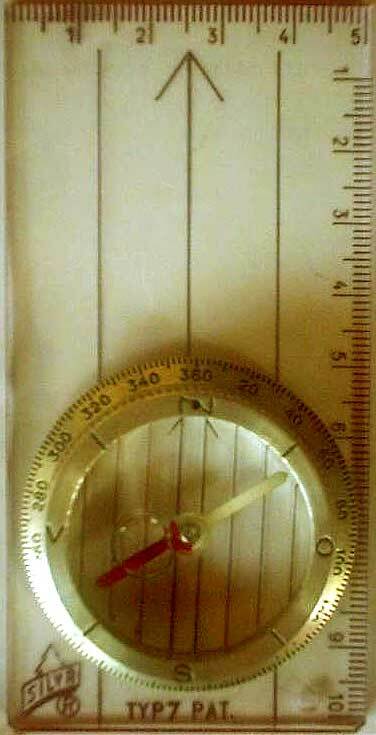 - Instrument with a BILAND-type needle (with letters N and S). 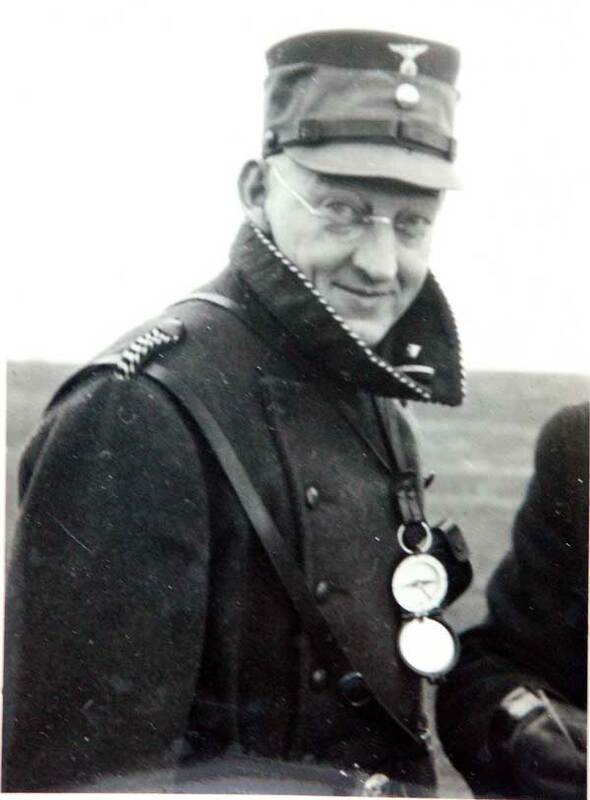 PROFILE - Franz WINTERER was an Austrian officier (for more information click HERE). 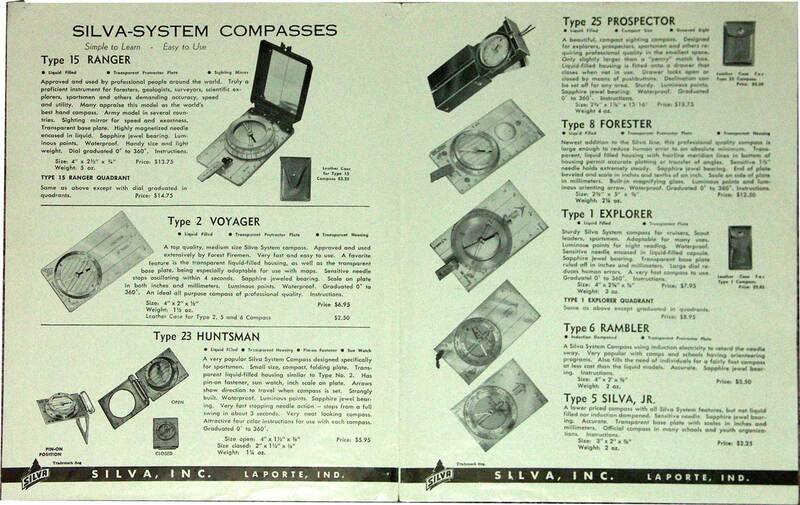 He developed at least four different compass models. Two of them (models I and II) were for military use and are described in the section Survey and Artillery compasses. 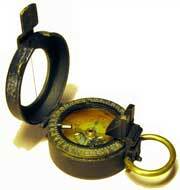 A smaller one was a plain version for hikers based on the same patent than models I and II (no. 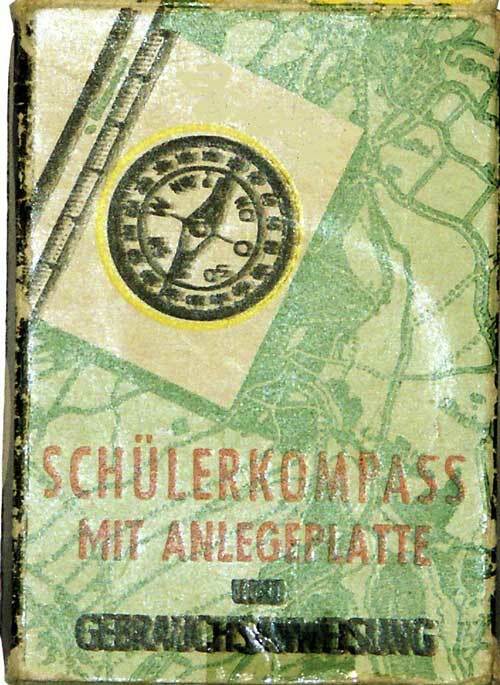 117354 for Austria, May 1929). A wooden version of it is known which bears no information. It was probably made before the patent was accepted. 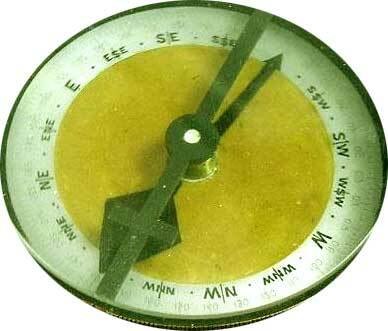 The fourth one (built in the early 50's) was a simple plexiglass plate with a rotating bevelled crown not unlike the old SILVA system. 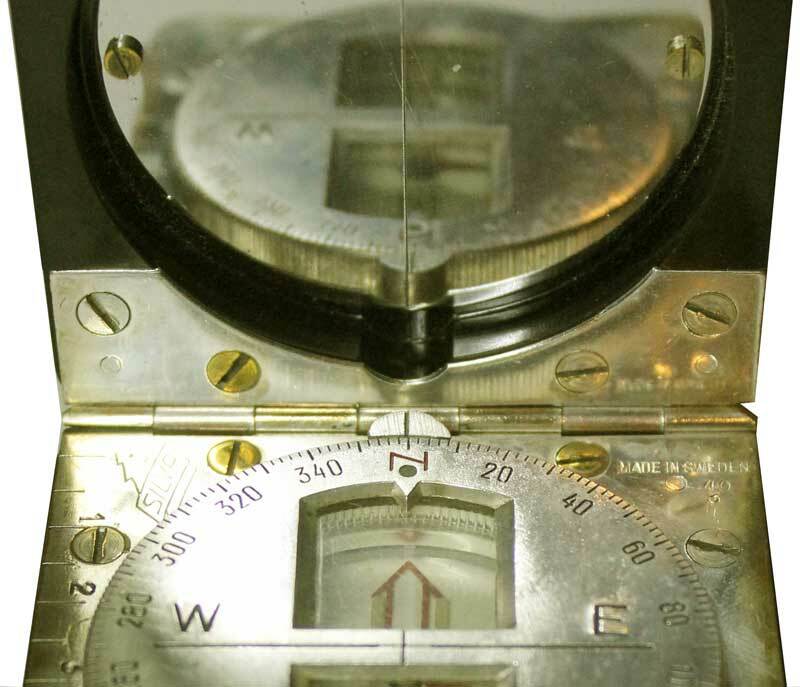 Divisions: 5 deg. 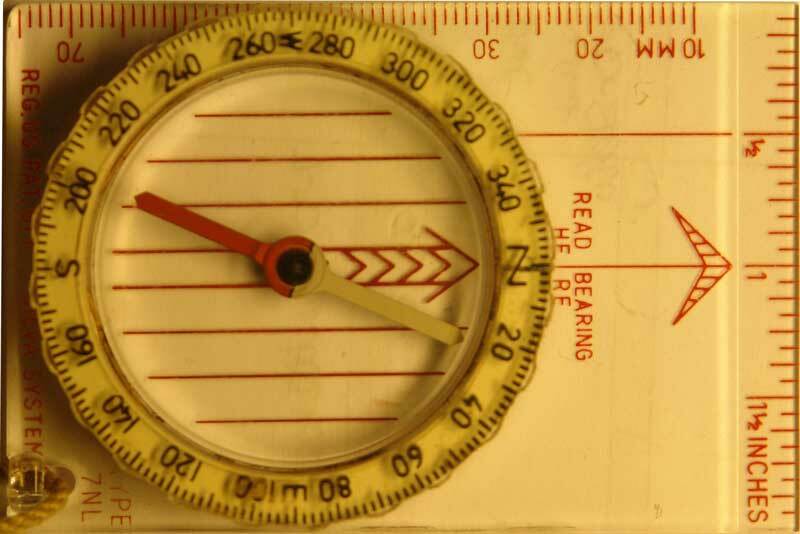 The declination (9° W) was indicated via the cut-out for the magnetic needle. Series model with patent no. Patent no. 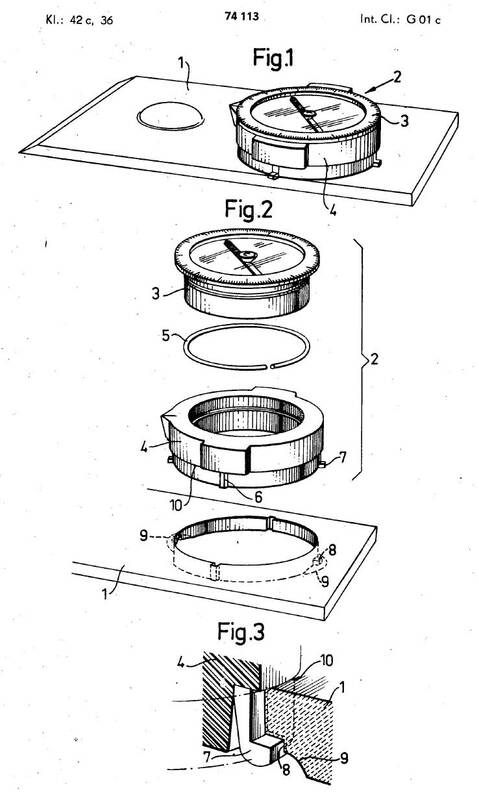 indicated on obverse Patent p. 2, figs. - Rulers on both sides: divisions in mm but without graduations. 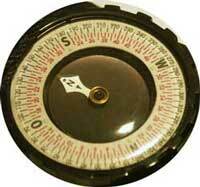 - Compass rose graduation: 360 degrees counterclockwise, in 10 deg, steps (thick black markings). 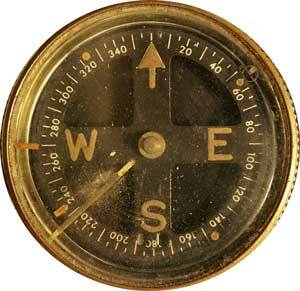 The figures corresponding to NE, NW, SE, and SW are indicated as well as North (360) and South (180). The figures for WEST (90) and EAST (270) are located on a bar similar with the Bézard compass design (see the dedicated chapter). 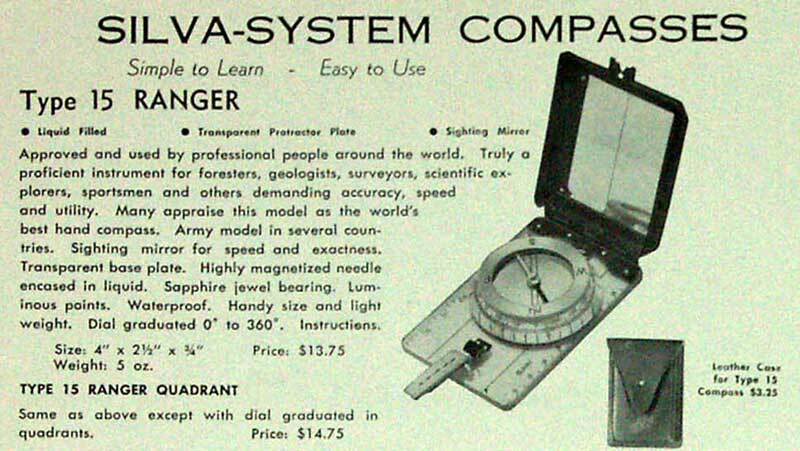 A civilian version of the larger modell I also existed with a 360 degrees and a 24 hours divisions in the same casing as the military version (comp. 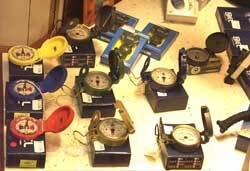 with survey compasses). 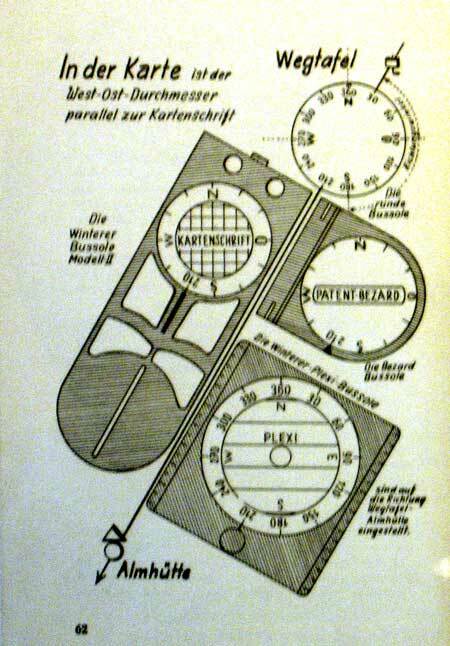 Winterer describes in its probably last book (1953) a fourth model called Plexi-Kompass. 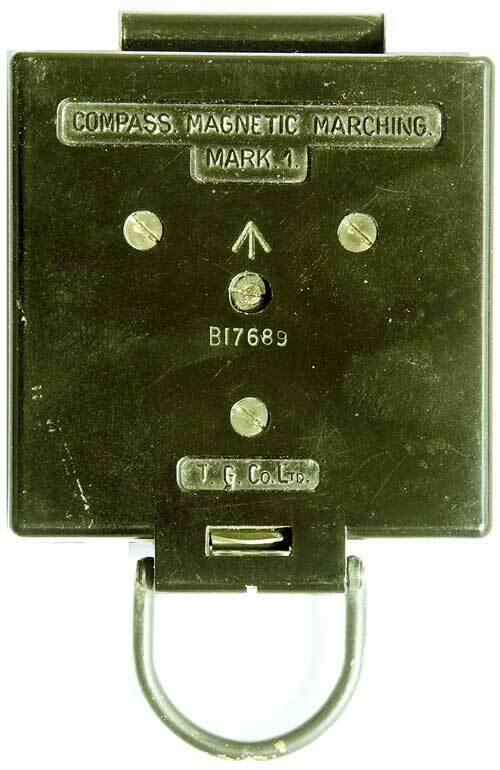 It was available alone or fixed onto a plexiglass ground plate. 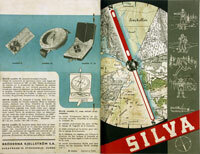 NOTE: The photographs on the book's cover show an item bearing the words Pat. ang. (applied for) but no number is indicated. 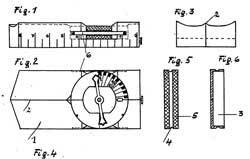 Winterer patented a system in 1956 (pat. no. 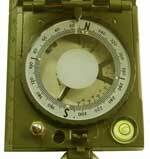 195662) for a special liquid dampened compass, a further development of his Plexi-Kompass. PROFILE - Manufacturer and users are still unknown (see below). 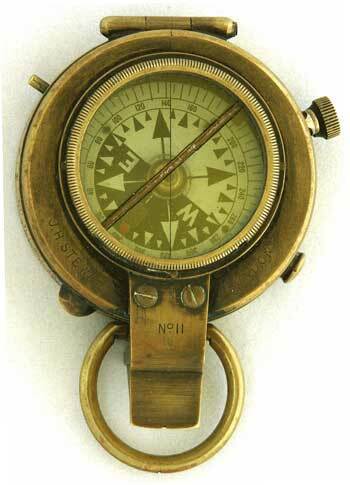 This compass is in our eyes one of the most interesting items displayed in this category. 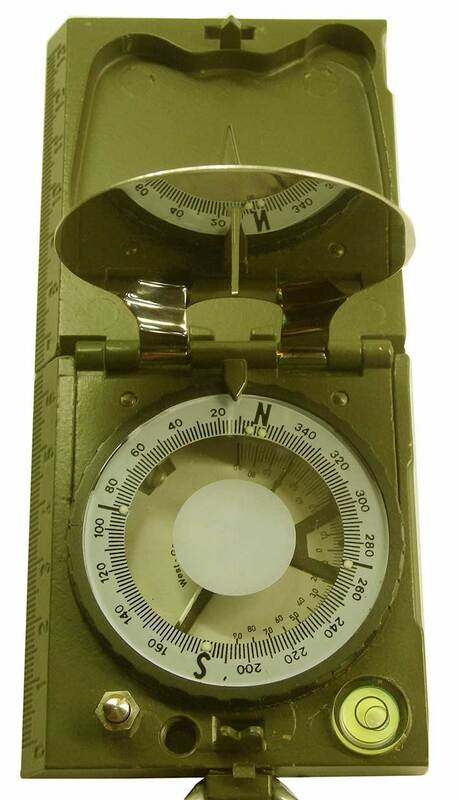 Although its design is extremely low tech, it features all essential characteristics of a military marching compass. A high level of ingeniosity was obviously needed to cope with scarce industrial resources. Very little metal was employed for its production and the scales are either directly painted on the glass or made of decals. 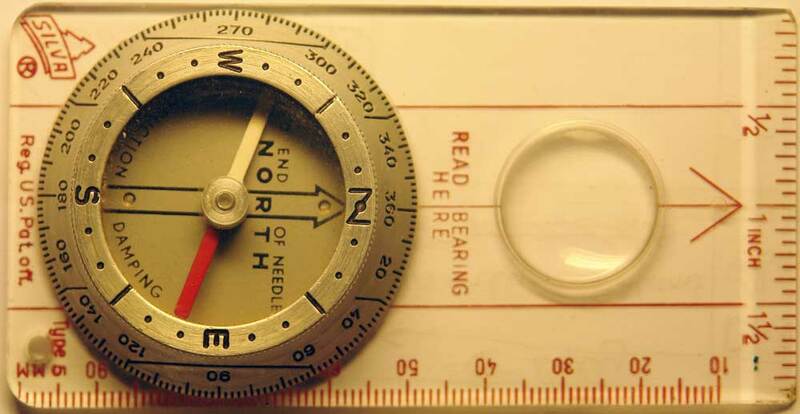 The divisions and the cardinal points are printed on a stripe of paper while a grid and an arrow with the letter N are painted in red under the cover glass. 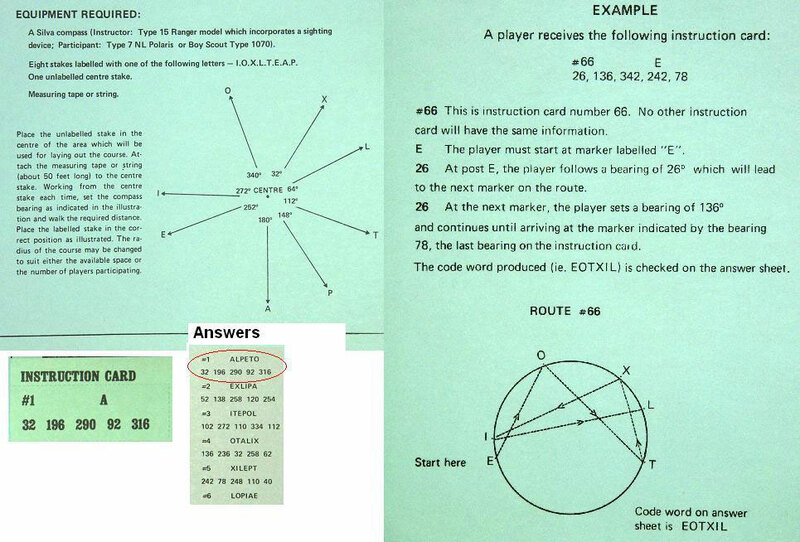 The other cardinal points are printed below the corresponding figures: 48/O (Ost = East), 32/S, 16/W. The cover glass is relatively lose. It is only secured in the case by two minute clamps made of bent wire inserted from outside into two slots. 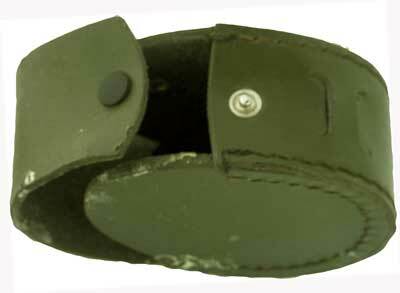 It can easily be rotated by the friction effort of two fingers to set a desired angle. A tiny recess bored above the North mark (facing the 64 mils figure) contains a dot of luminous paint. The needle is locked when not in use by a lever actuated when closing the lid. 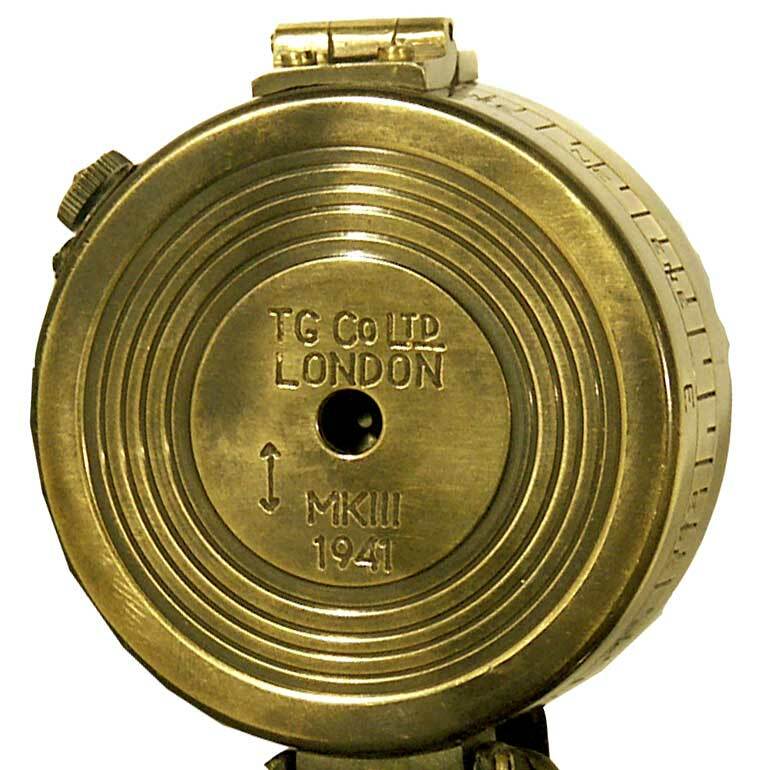 Sighting is done by observing the target over a rifle-type sighting device and through a round hole located under a polished metallic mirror attached in its centre by a rivet in the flat round lid. The foresight bears a tiny dot of luminous paint. 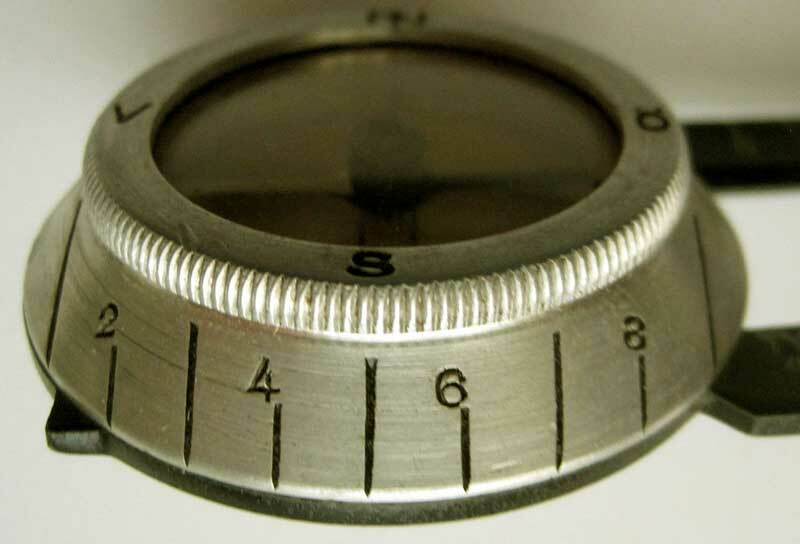 The actual declination's value can be locked by means of a knurled screw sliding in a slot on the case' side. 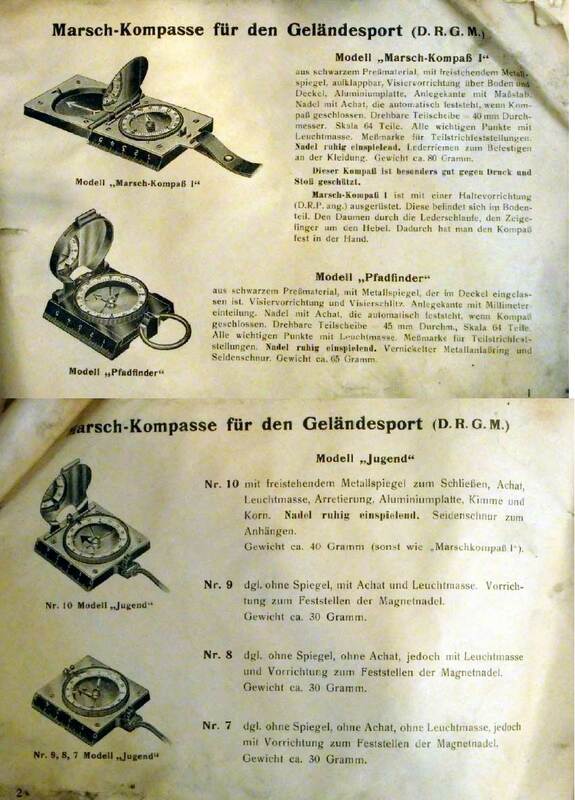 The user instruction (Gebrauchsanweisung - photocopy available) doesn't name the manufacturer. They had to conceal their identity behind a three-letter-code anyhow, to avoid getting bombed... 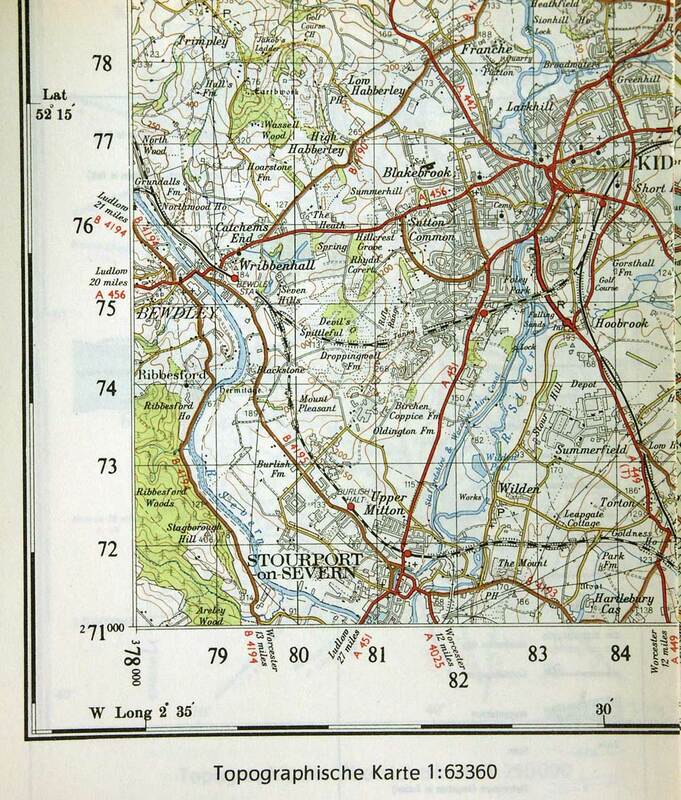 Solely the number at bottom of p. 2 (N/1114 8. 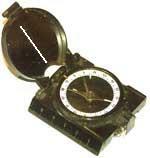 42) could enclose the production time (Aug. 1942)". 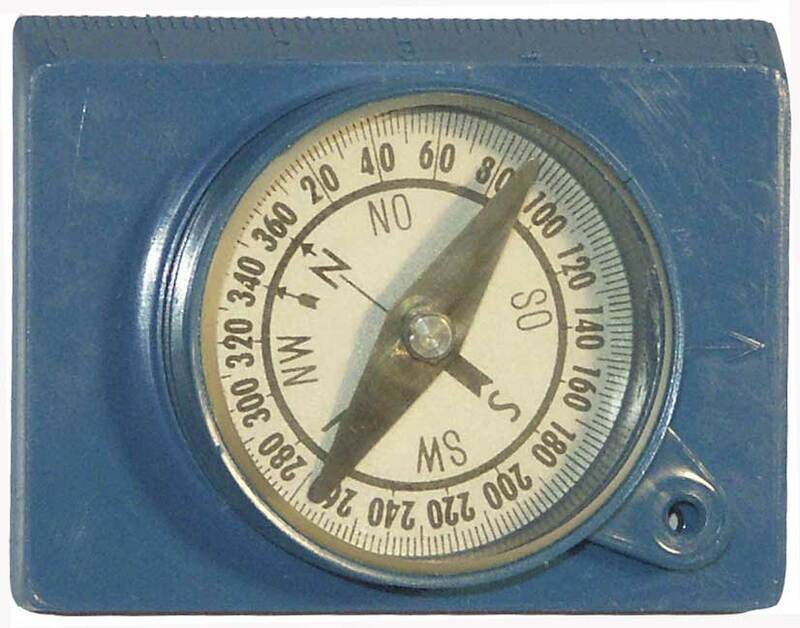 The values indicated for the magnetic deviation confirm this interpretation, at least the ones for Germany (Berlin: 4,5°). The abbreviation D.R.P. 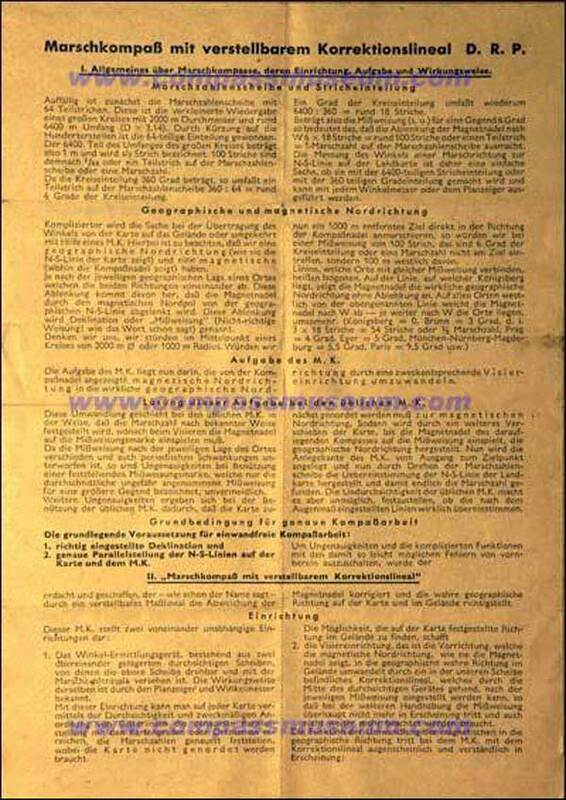 (Deutsches Reichspatent / German Empire Patent) without a pat. no. 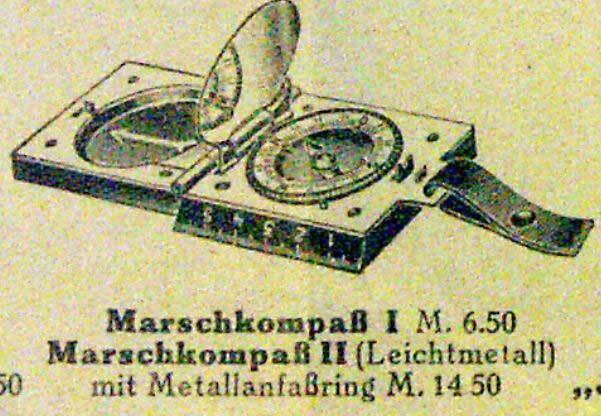 after the title 'Marschkompass mit verstellbarem Korrektionslineal' (marching compass with adjustable deviation indicating ruler) doesn't help either to unveil the manufacturer's identity. 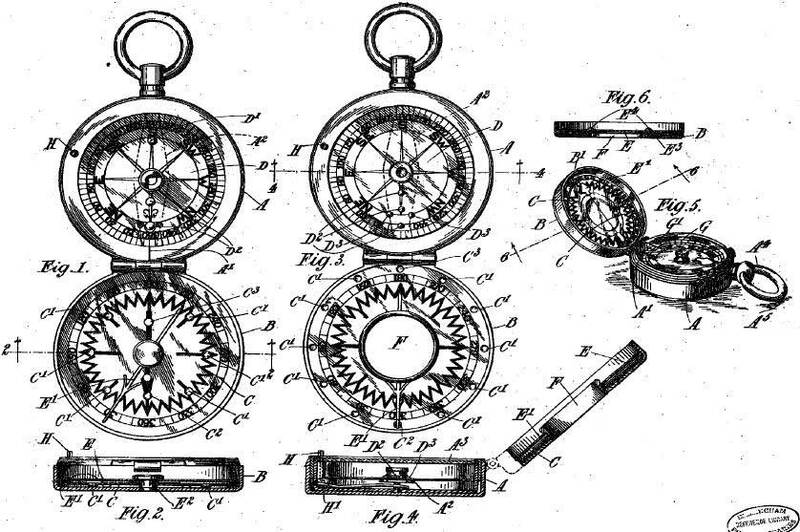 A thorough search through all compass patents filed in the three German-speaking countries (A, CH, D) at about this time gave no evidence of any instrument matching this device. PROFILE - Former Irish manufacturer (for more information about him, click HERE). As far as the technical caracteristics are concerned this compass design ressembles the Verner's pattern no. 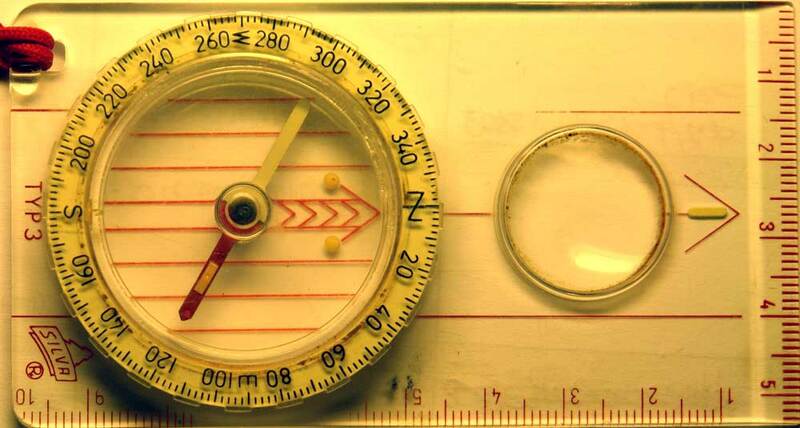 VI (see the Compass Collector's website) but it predates it since it is not a prismatic system and the card is not made of mother of pearl but of aluminium. 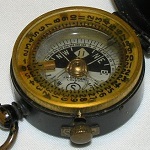 The loop's hinge axis is a long screw like on the same (old) model shown between the F. Barker pocket compasses Search and Scouting. 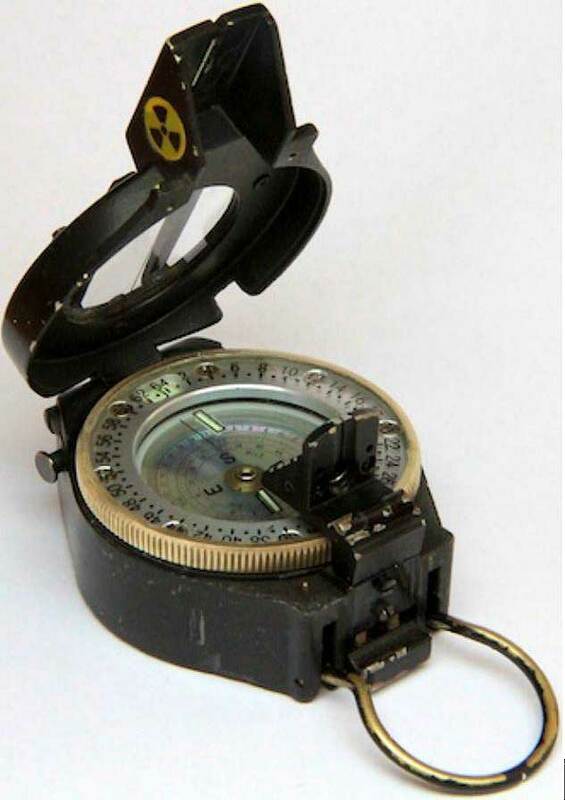 The design is called Service Pattern: the NORTH direction (black diamond) could easily be told in the dark from the South (thin black line) on the autoluminous background (radium paint). 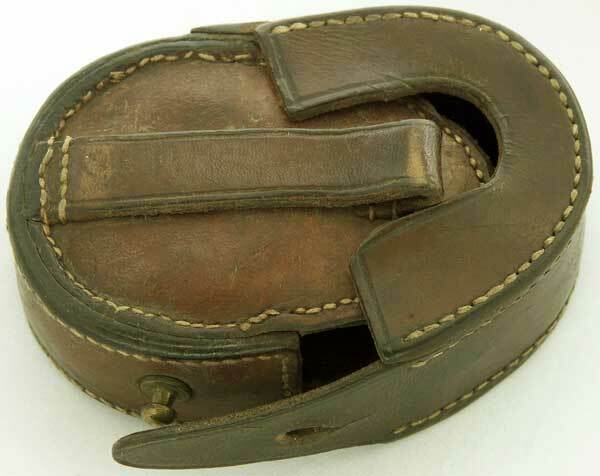 This special item was offered as having belonged to a British Army officer who is said to have served in the 6th Inniskilling Dragoons regiment (see WIKIPEDIA). 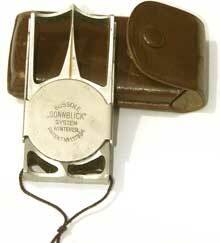 It is supposed to have been used in South Africa during the Boer War (1899-1902). - Manual transit lock and momentary breaking lock (finger press dampener, see Verner's pattern Mk VII system). 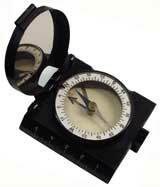 - Bezel: rotating march / bearing glass face with cross-shaped bar and rifle-type sighting aids. PROFILE - Famous German manufacturer of optics. 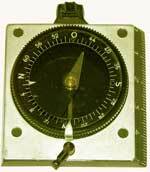 This instrument resembles in many points the standard Wehrmacht soldiers compass (see Breithaupt, Busch, MK, etc.) but it is very probably only an early proposal since it lacks several features of the later series production and was never issued to the troops (s. differences below). 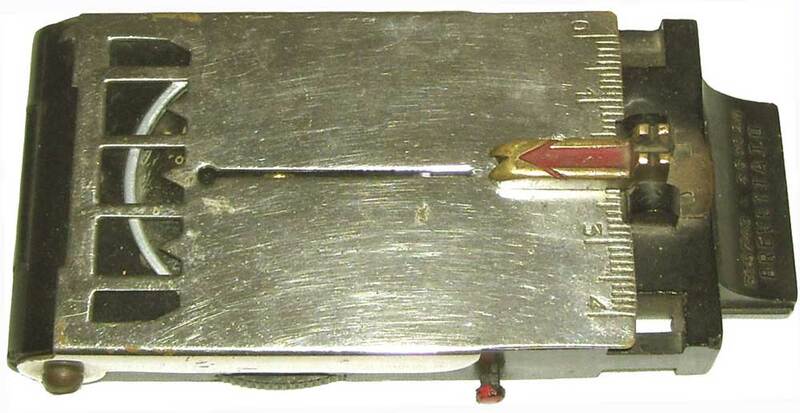 Differences to the standard model: no foldable ruler, lid made of two riveted parts and nose not cutaway for the sighting device (heavier), long marching course arrow entirely painted (more radium compound needed).